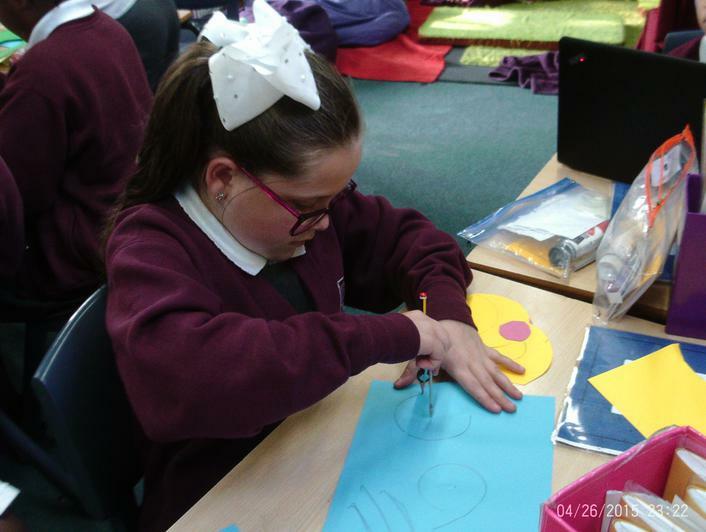 Alder class have been busy preparing for our Festival of Lights concert. 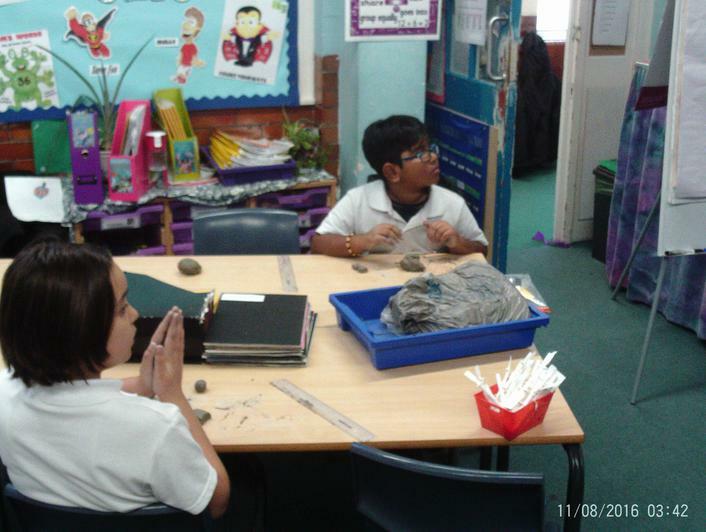 We have been looking at different religions celebrations connected to light. 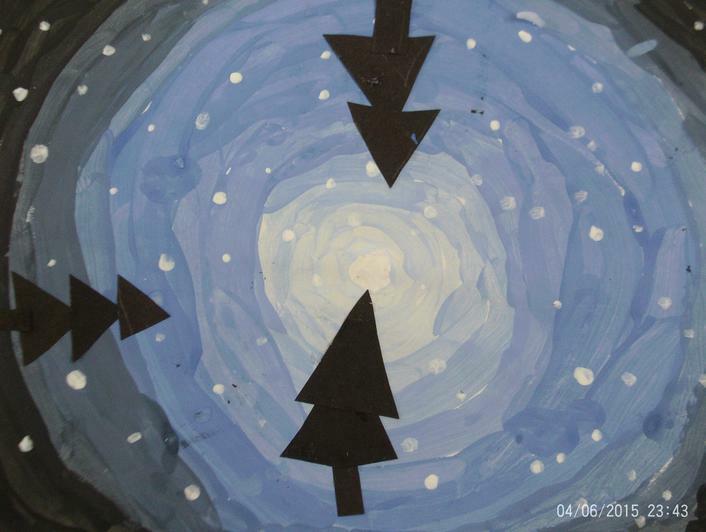 For the concert, we will be focusing on the Jewish holiday of Channukah and the Muslim celebration, Eid ul Fitr. 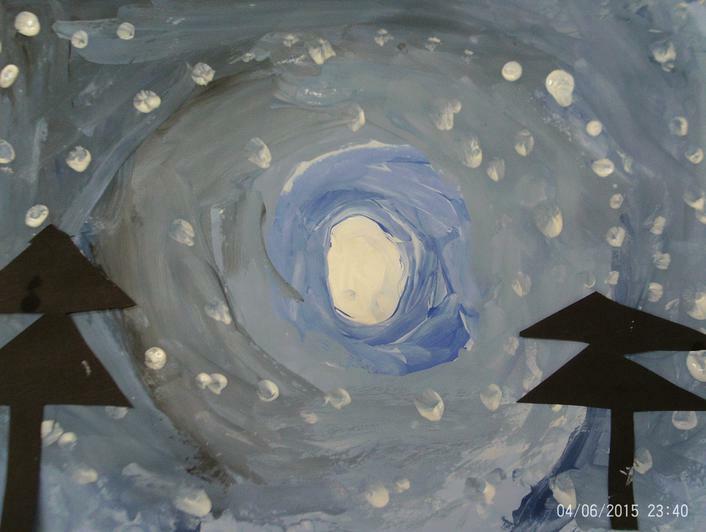 During Channukah, Jewish children play with a sevivon (Hebrew), dreidel (Yiddish) or (in English) a spinning top. 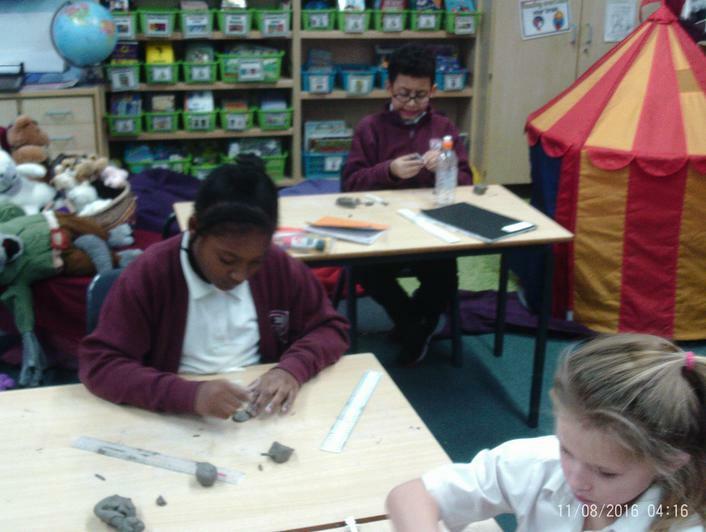 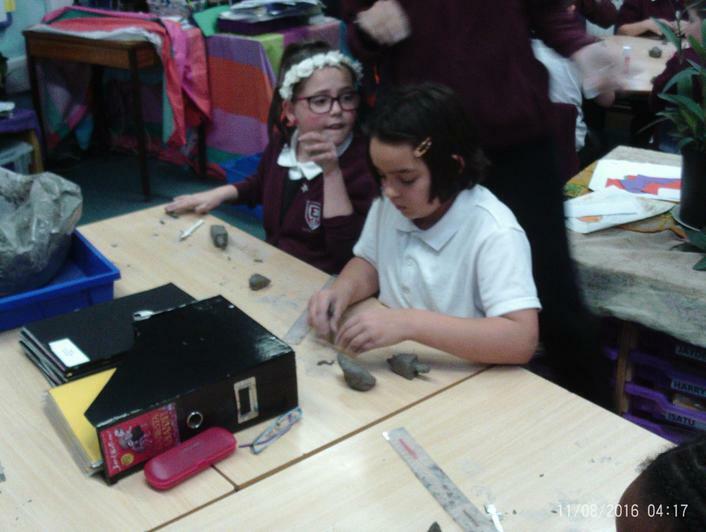 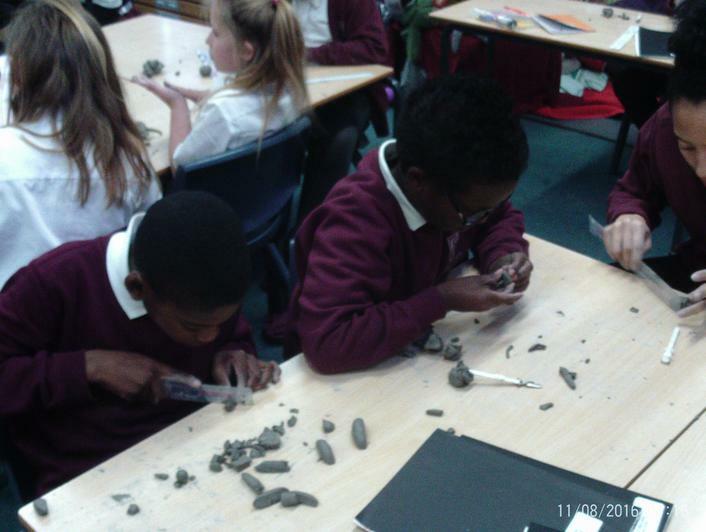 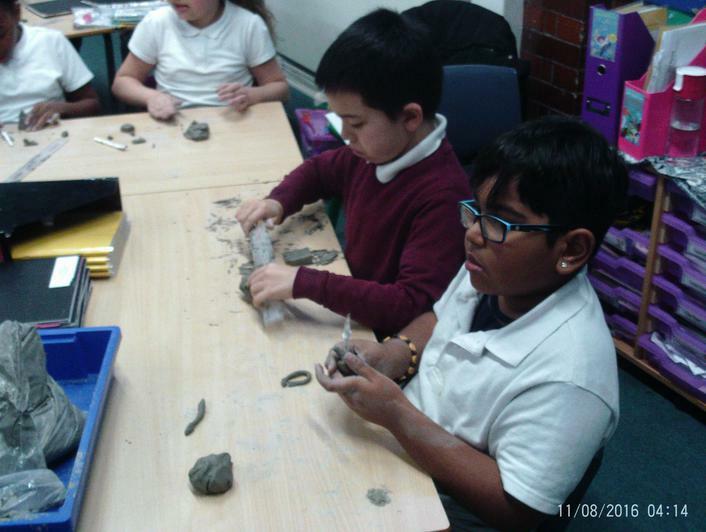 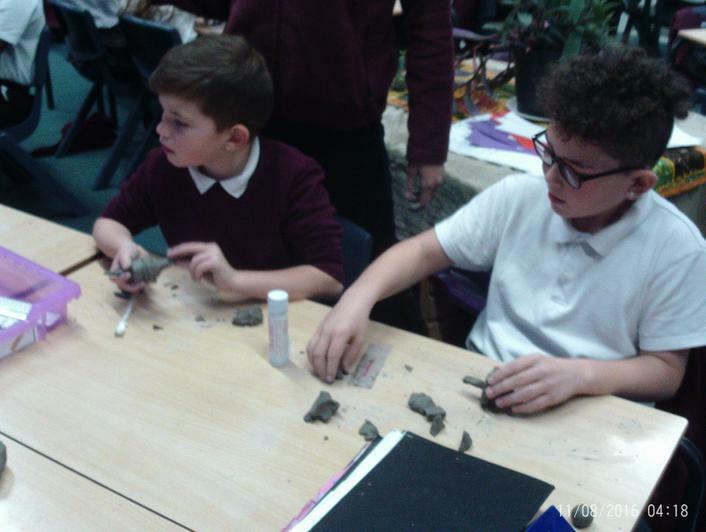 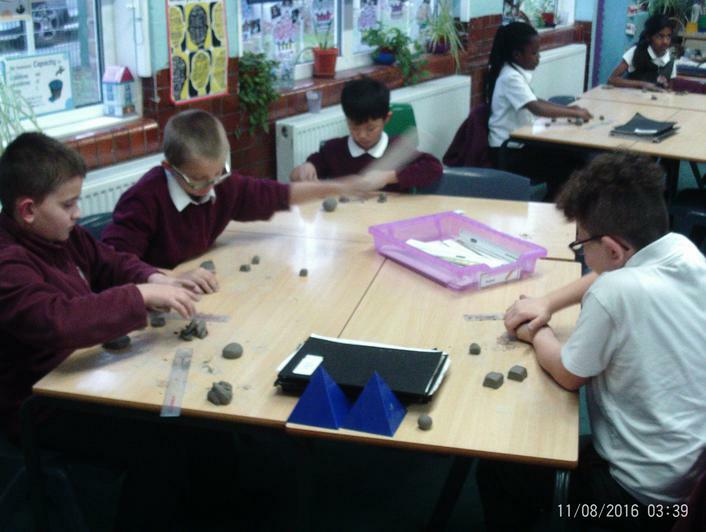 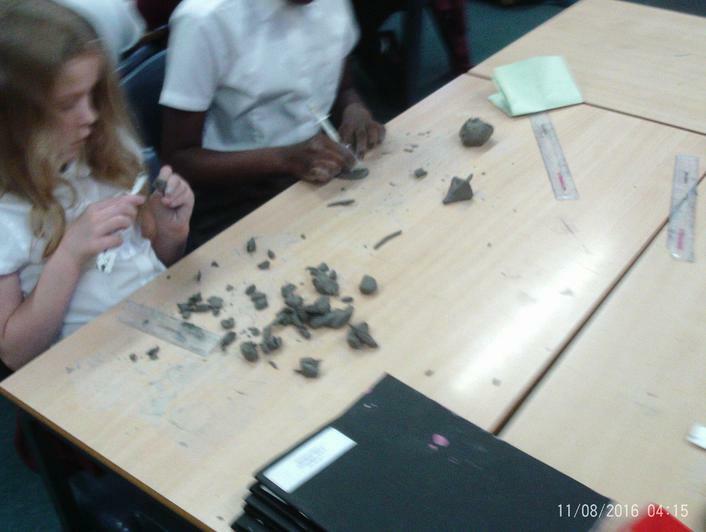 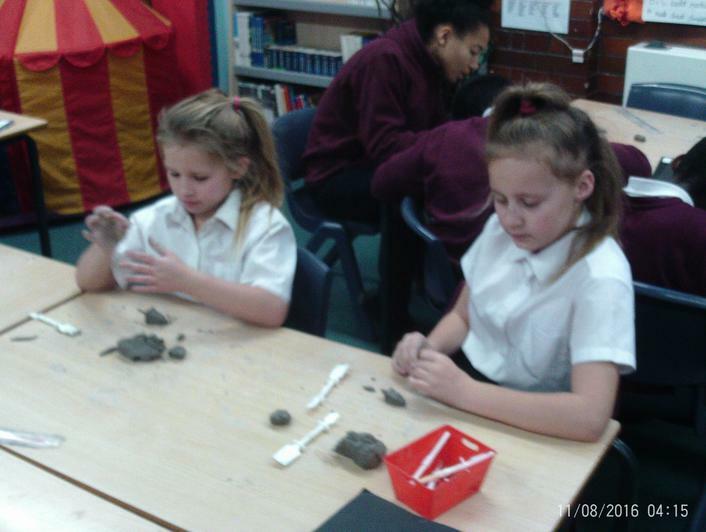 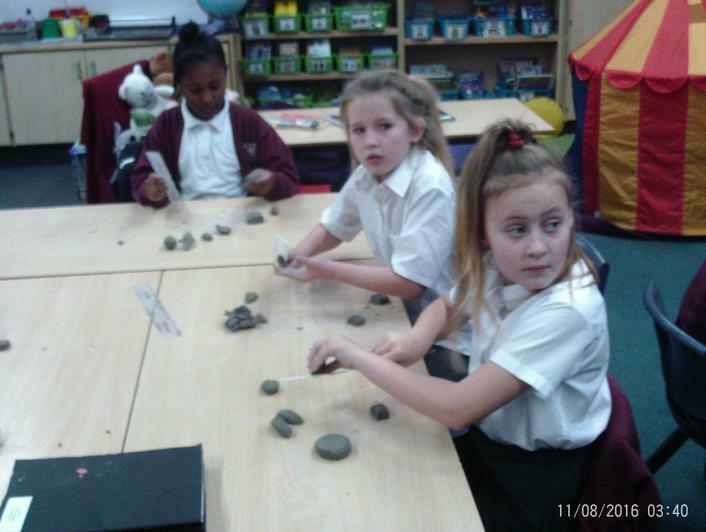 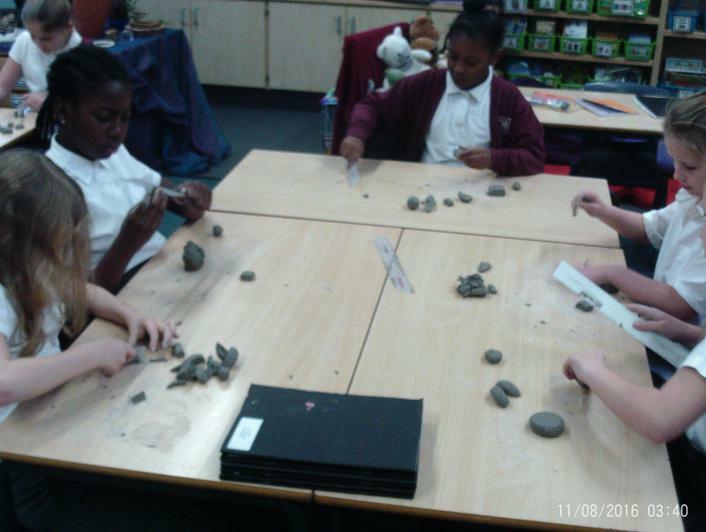 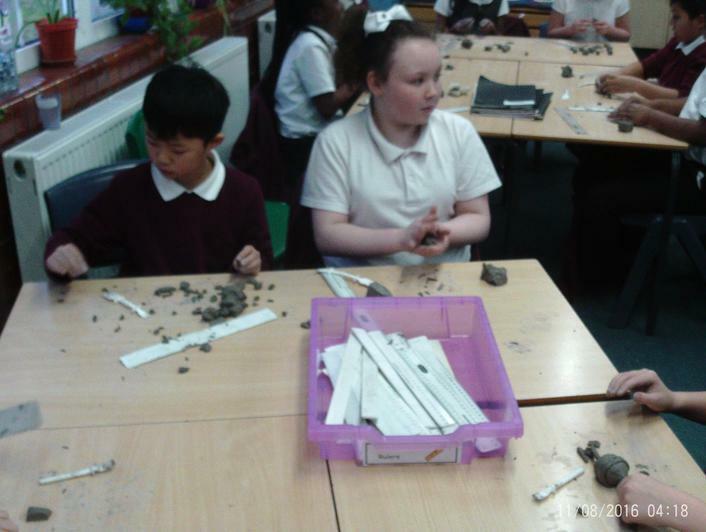 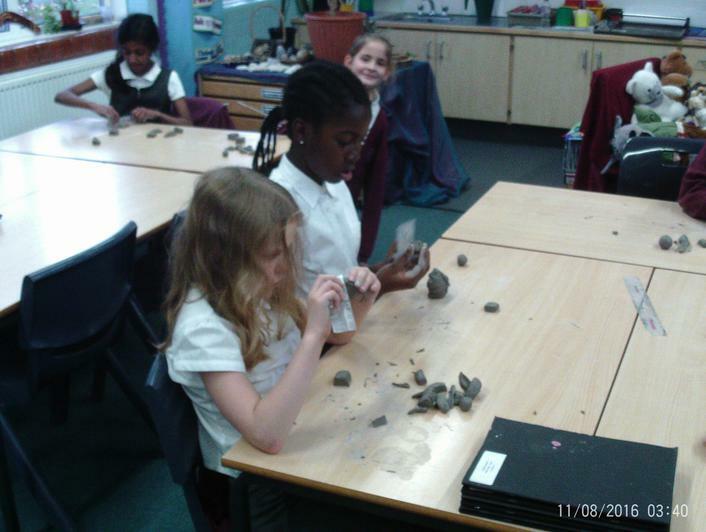 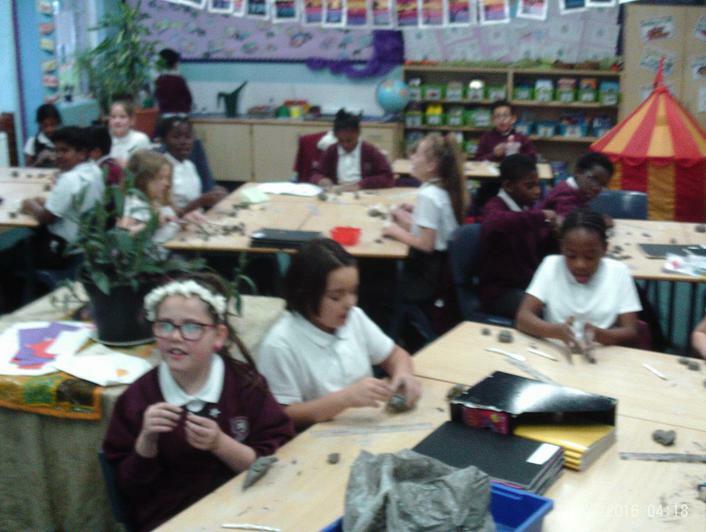 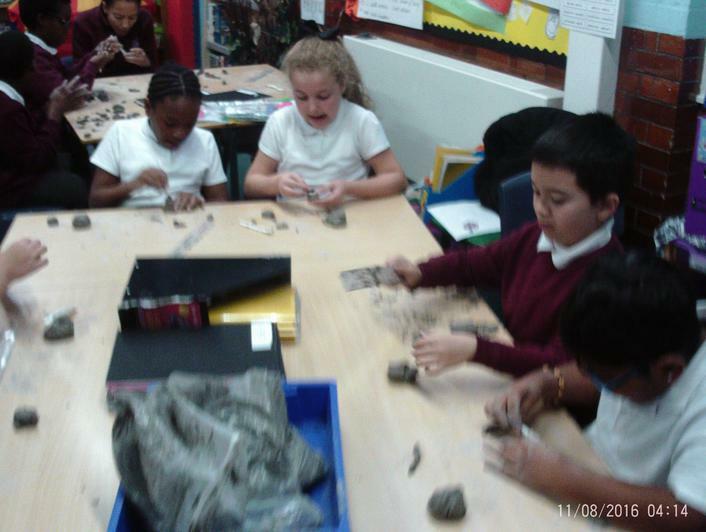 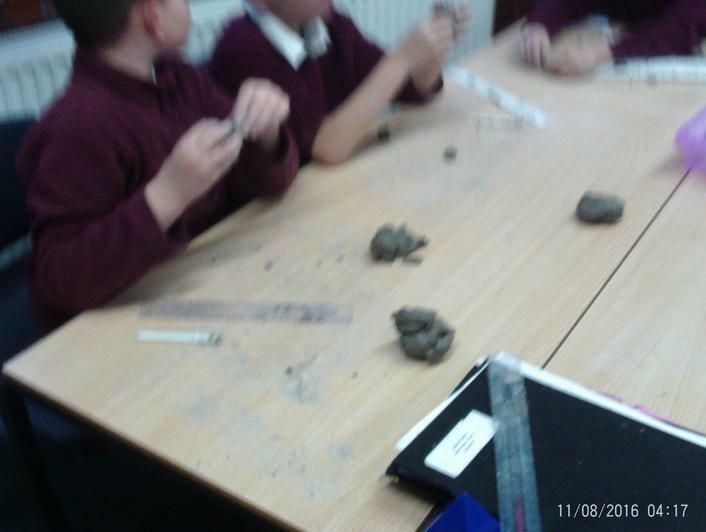 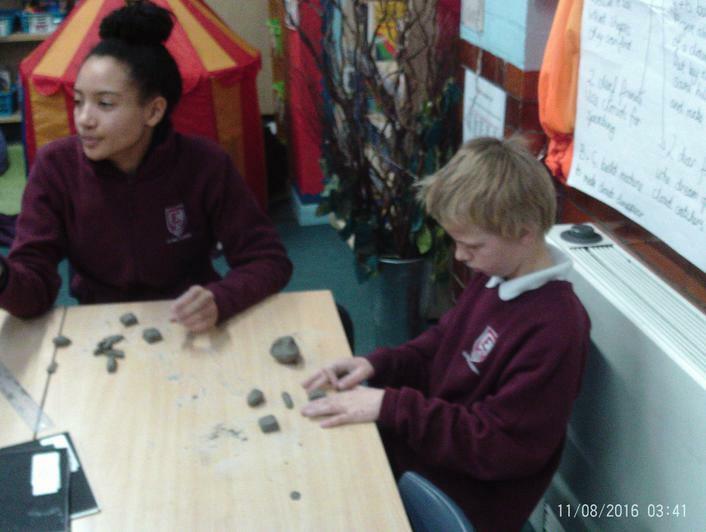 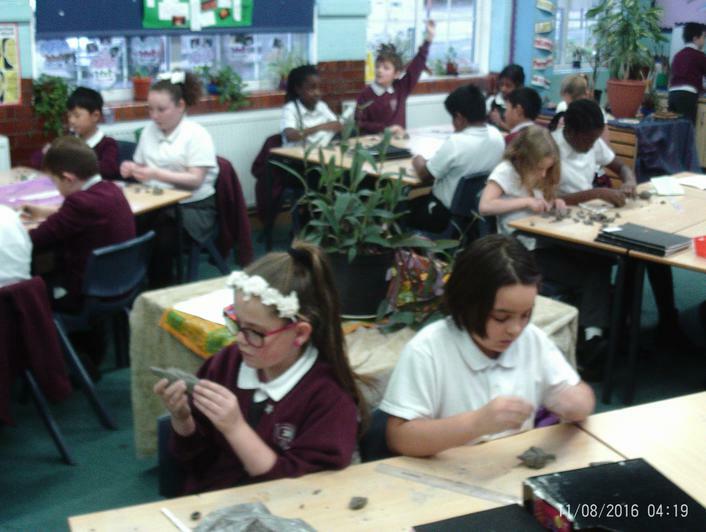 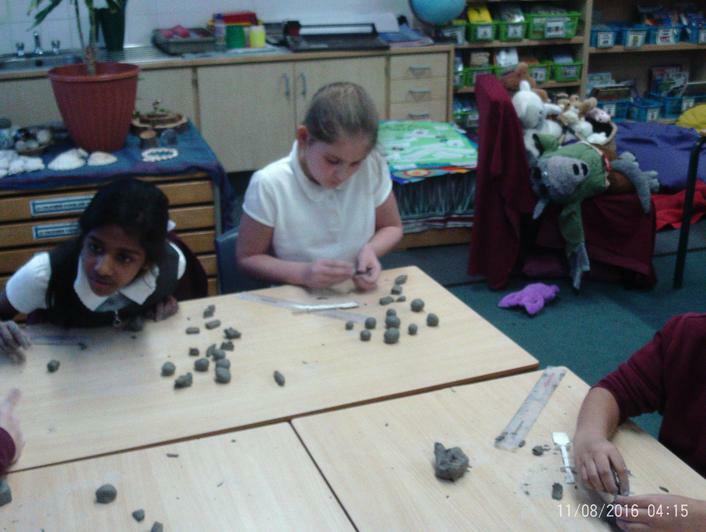 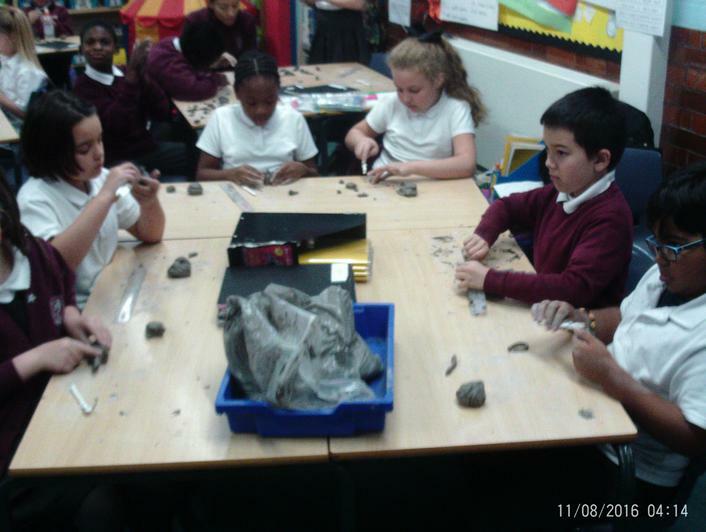 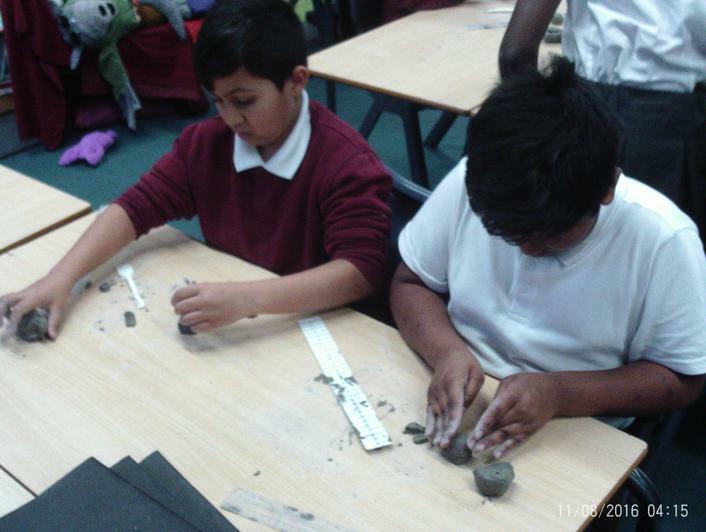 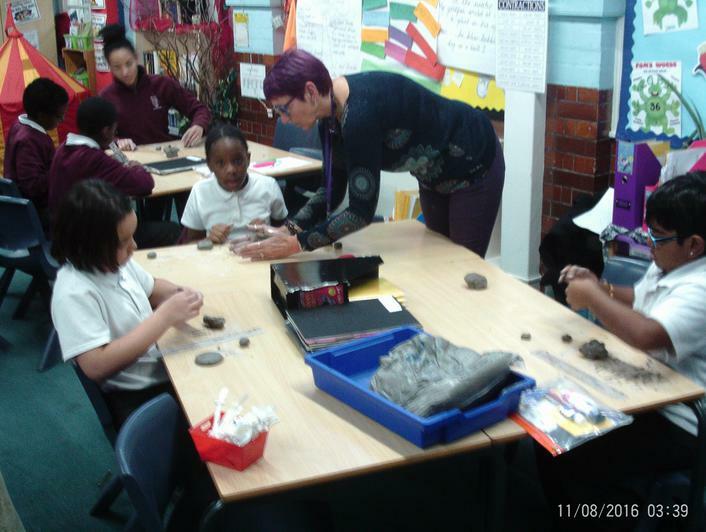 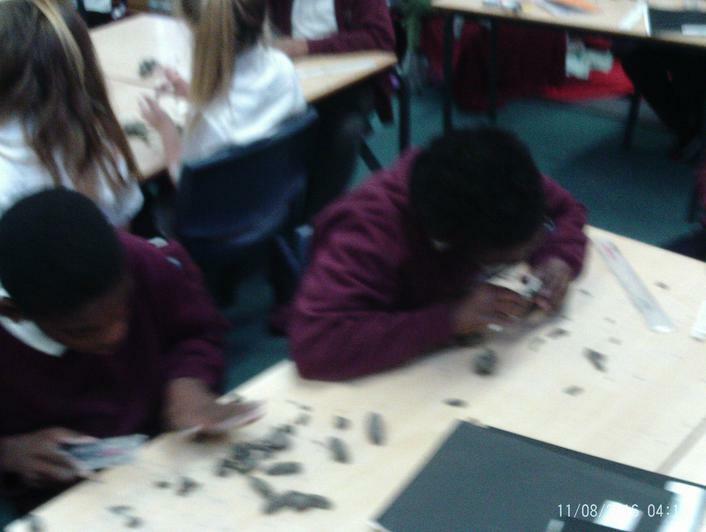 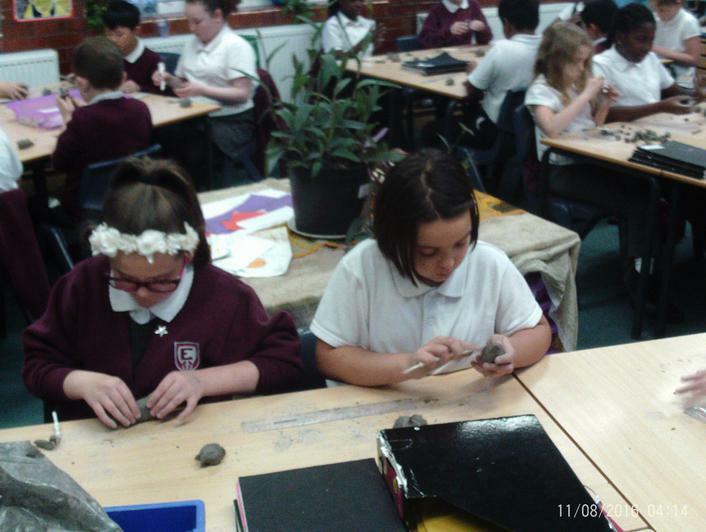 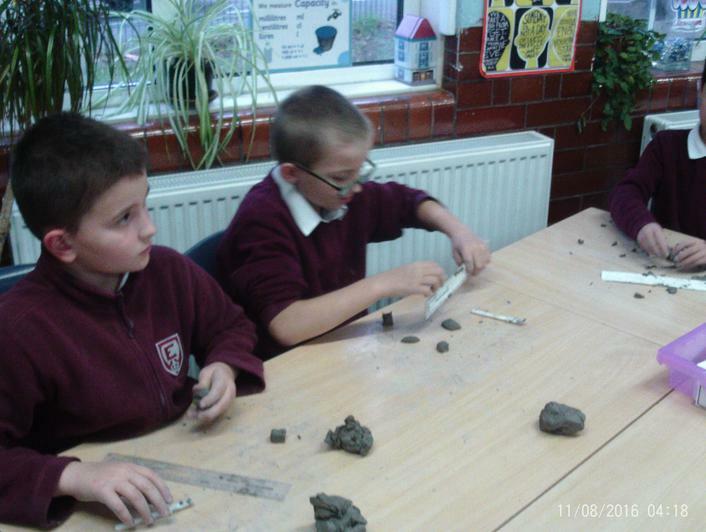 We have made some out of clay. 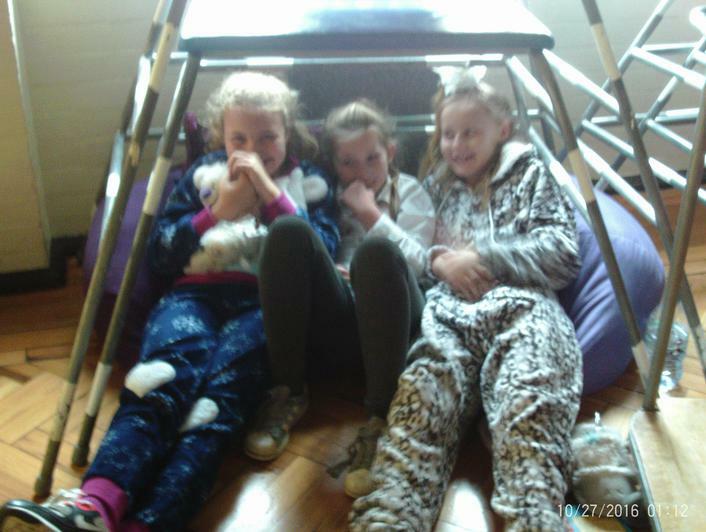 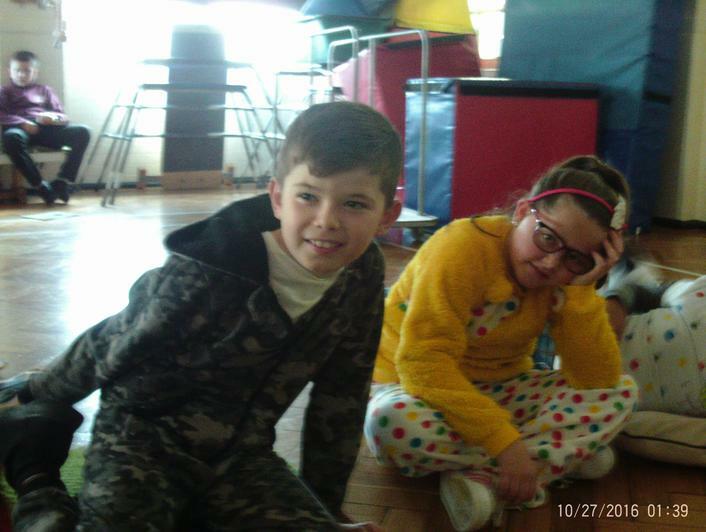 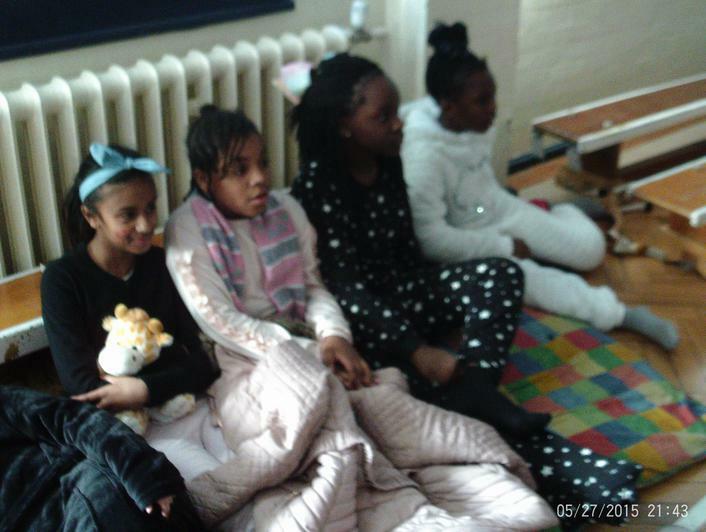 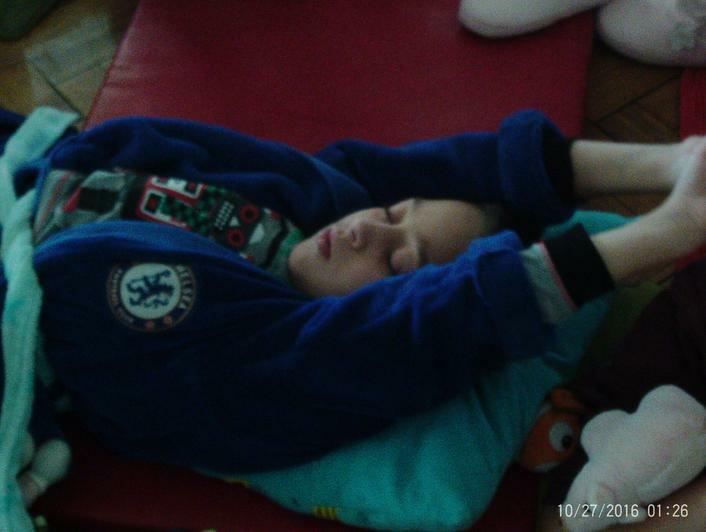 Last Friday Children In Need day, the children came to school dressed in either something spotty or their PJ's! 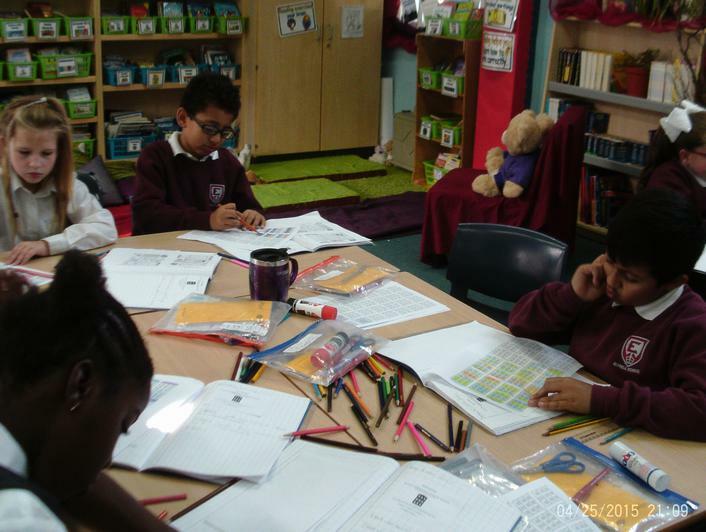 As part of our guided reading sessions, we have been studying David Walliams. 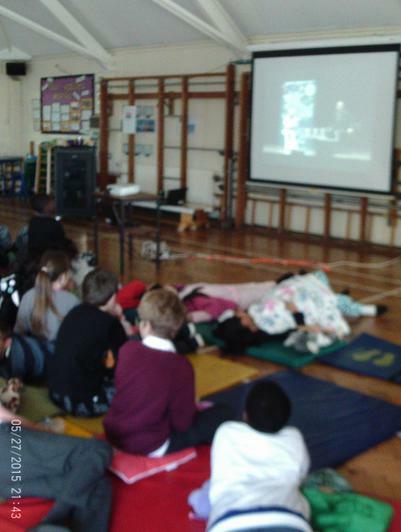 We watched a live stream of David Walliams reading extracts from his books. 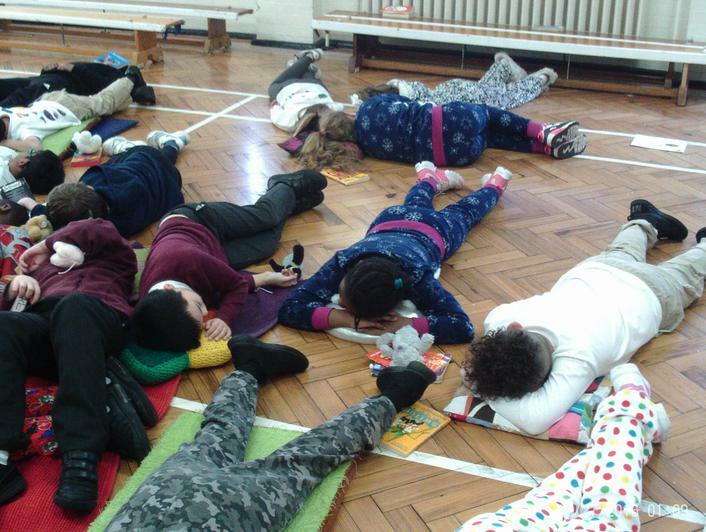 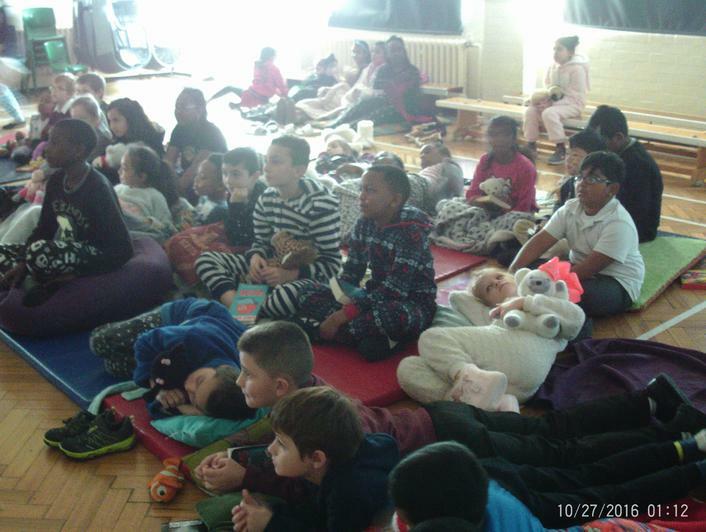 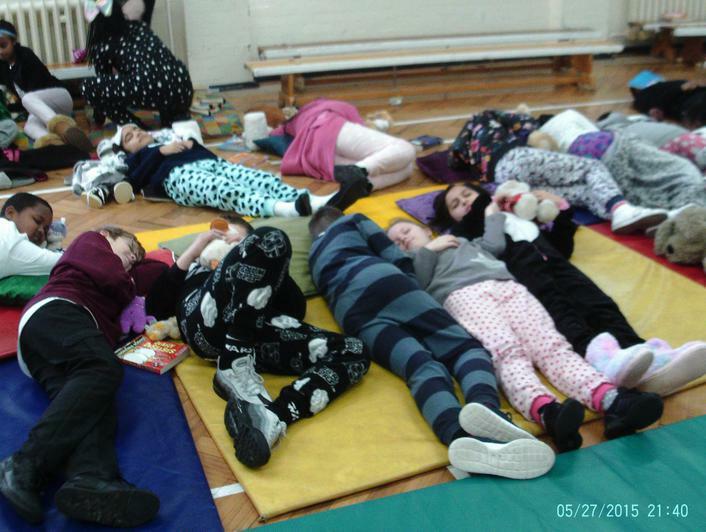 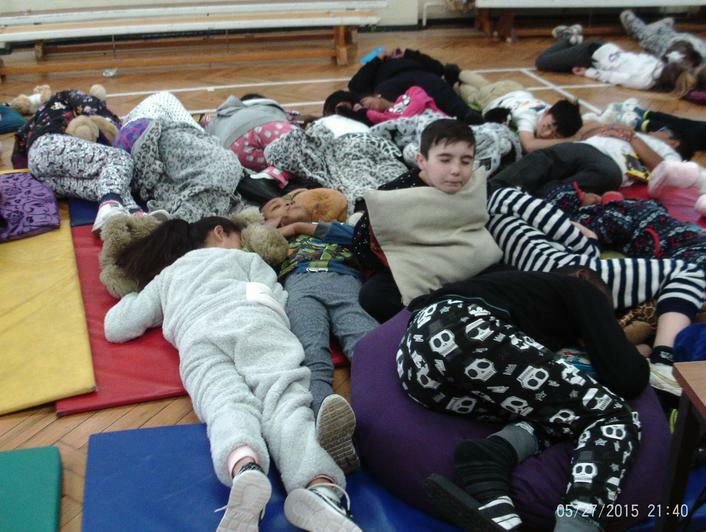 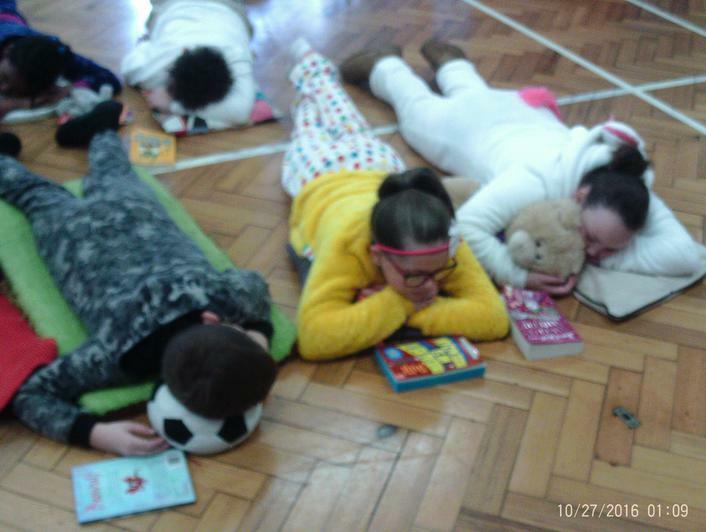 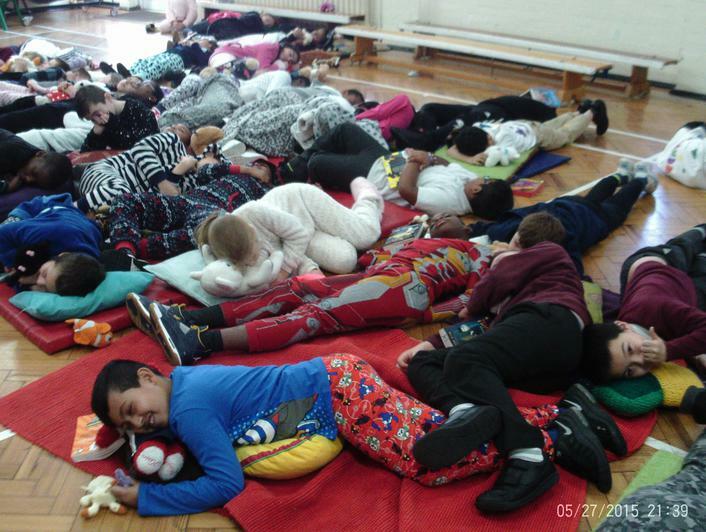 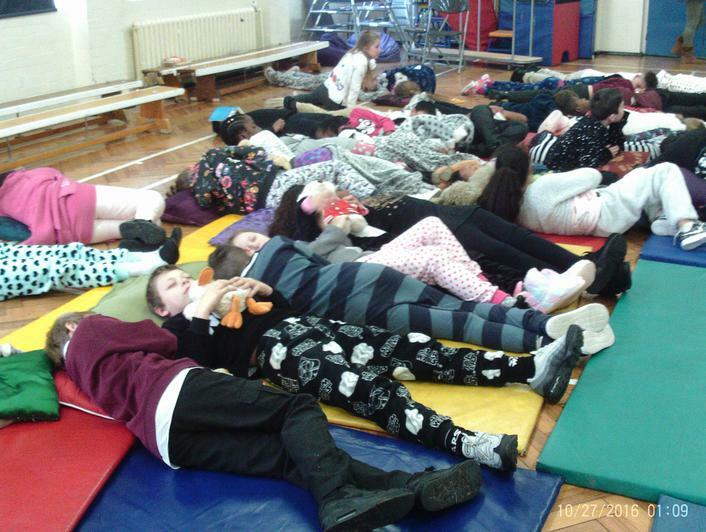 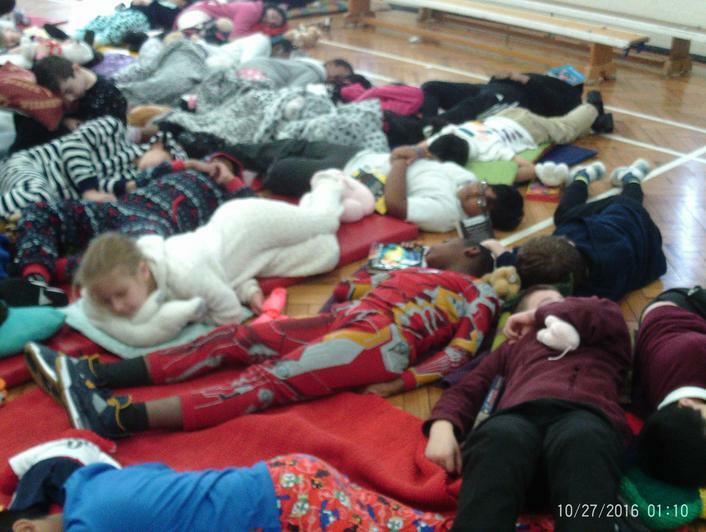 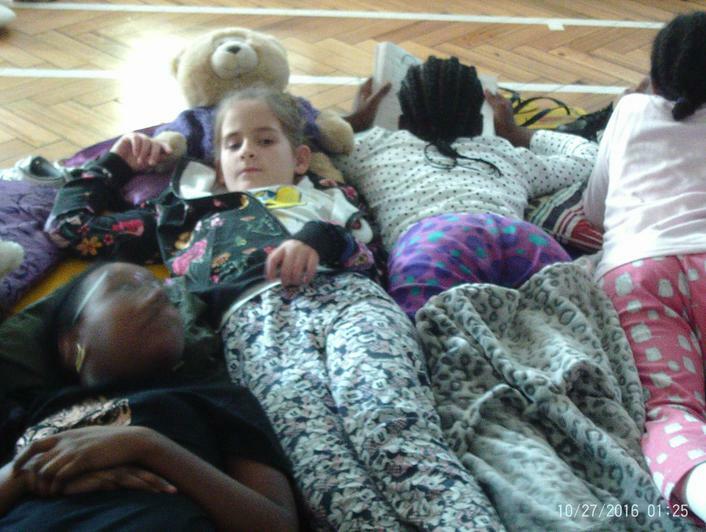 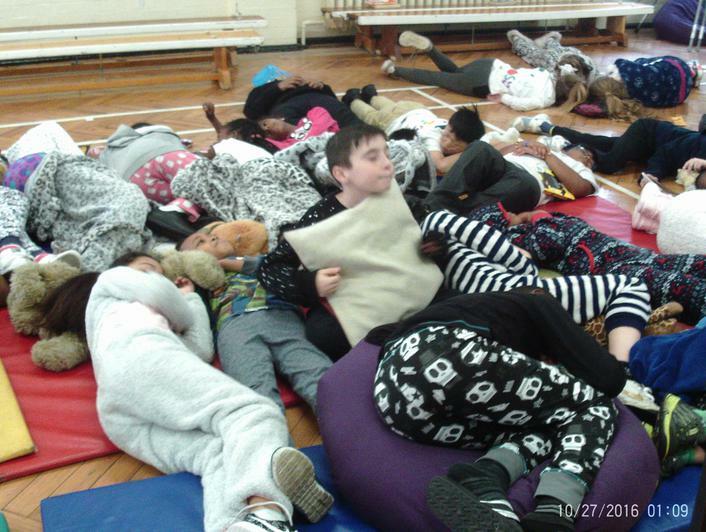 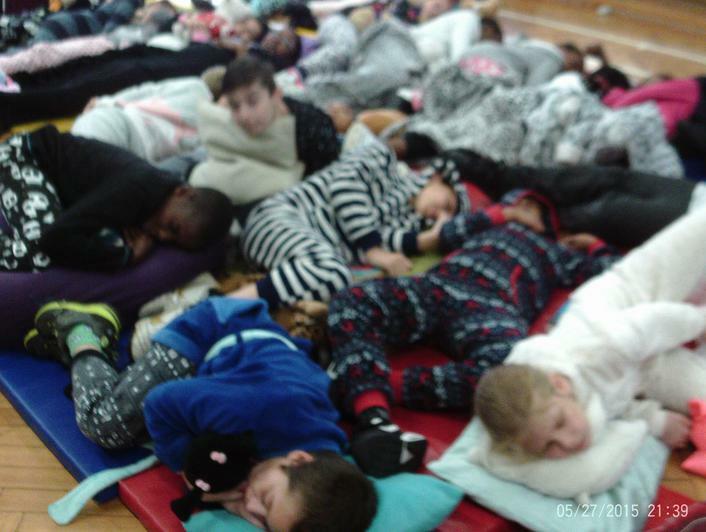 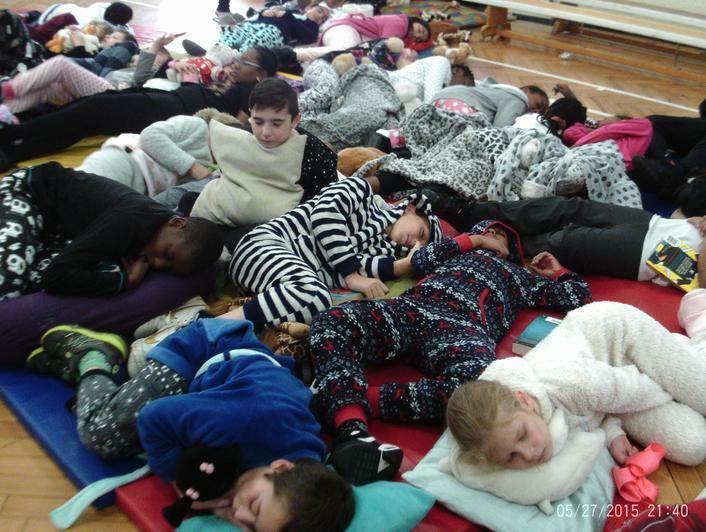 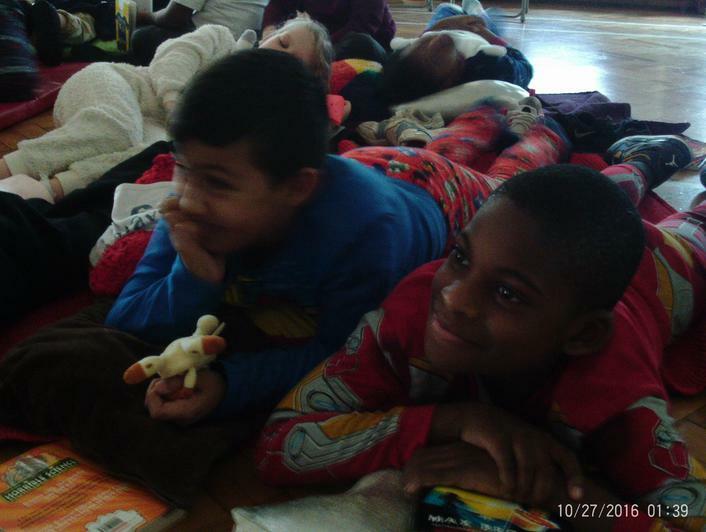 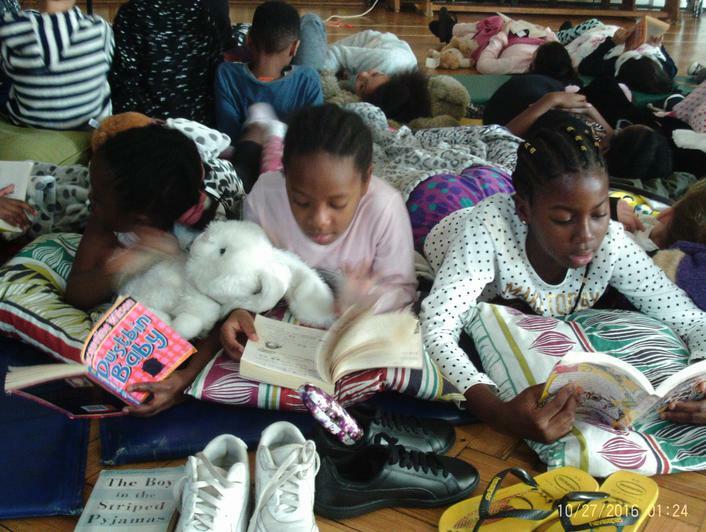 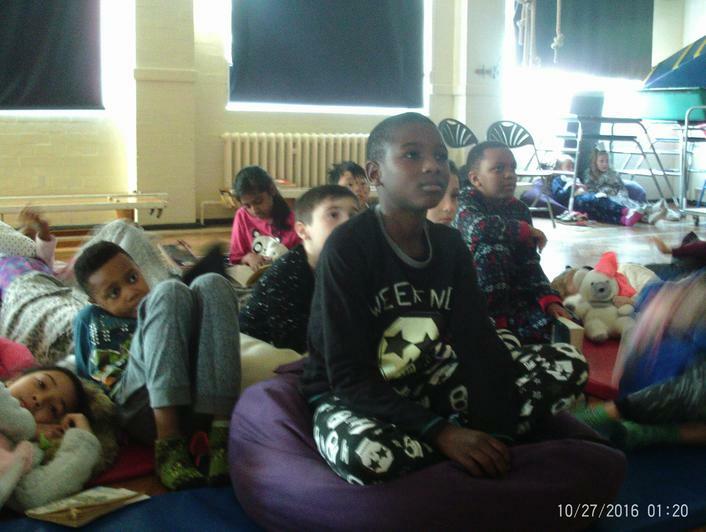 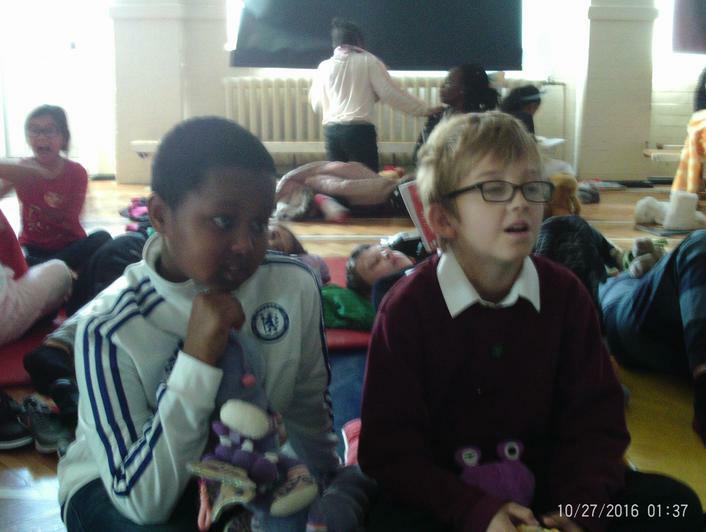 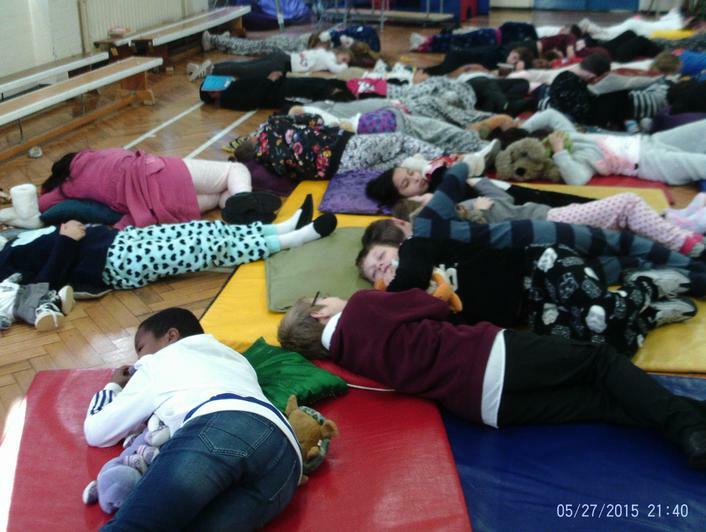 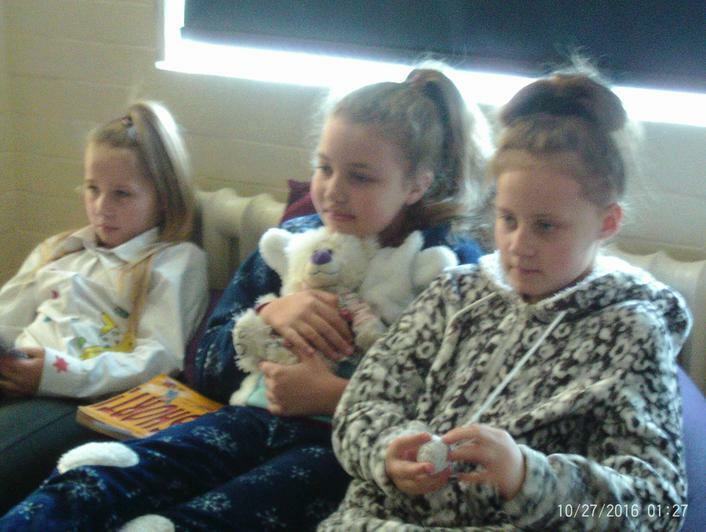 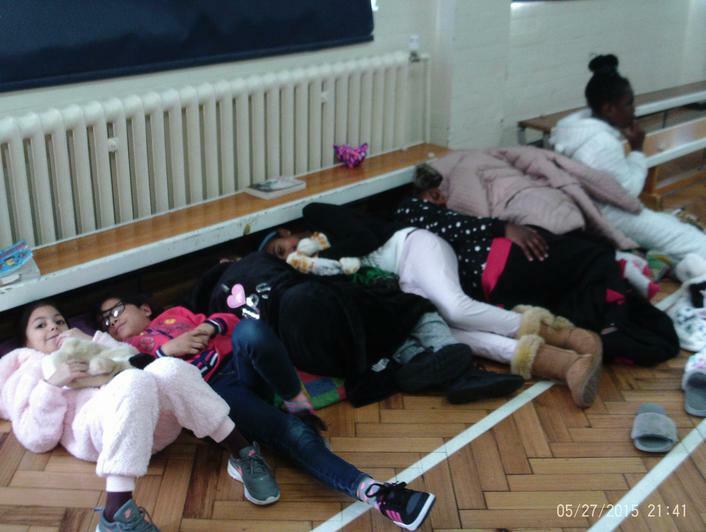 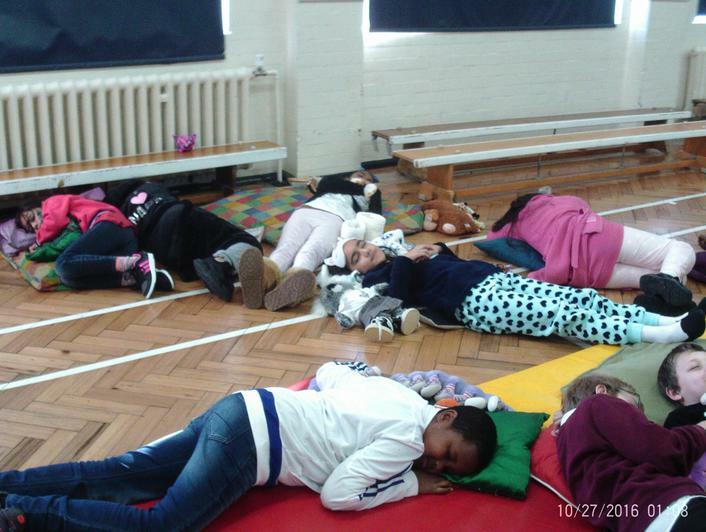 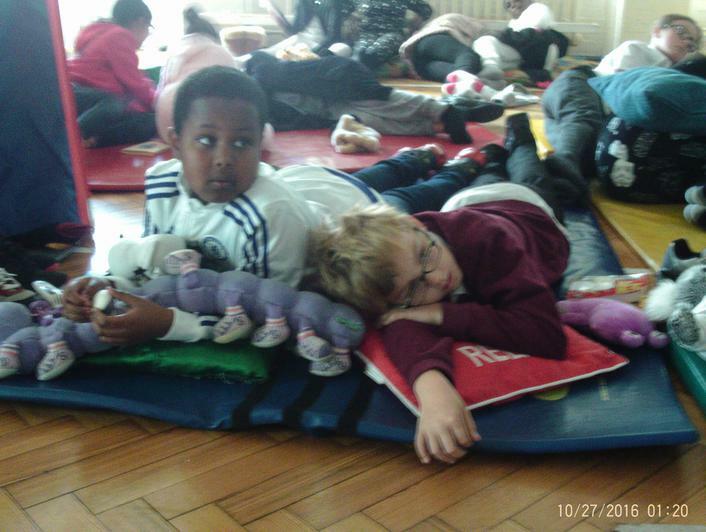 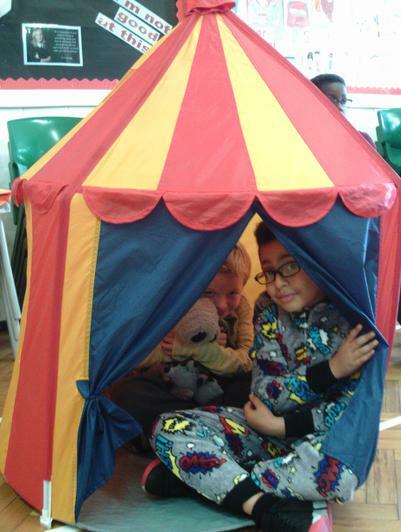 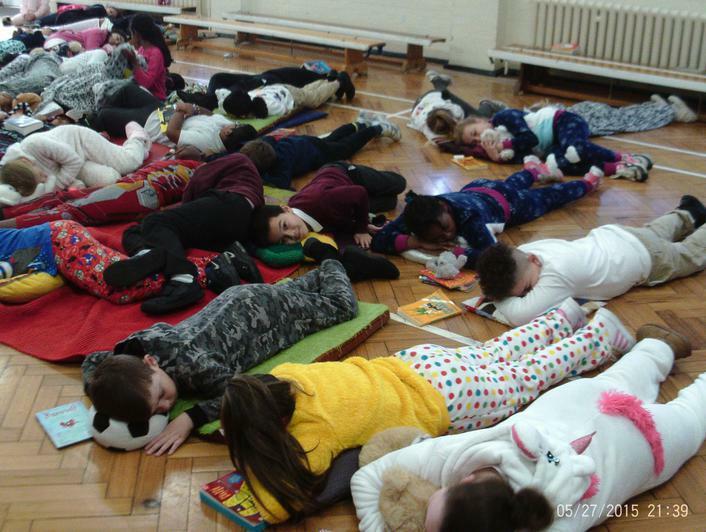 All the children enjoyed listening to chapters from 'The Midnight Gang' and 'The World's Worst Children' whilst snuggling on cushions and beanbags in their PJ's. 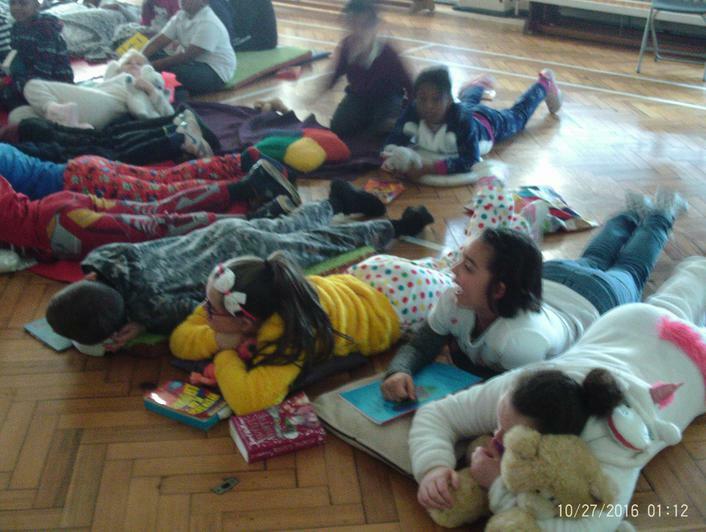 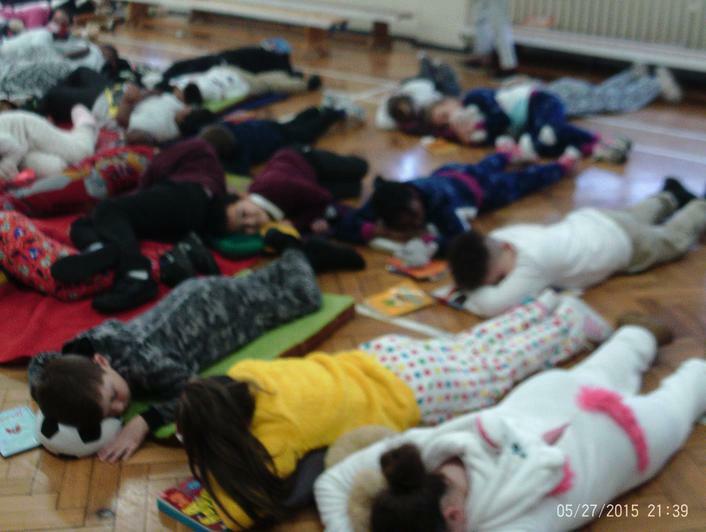 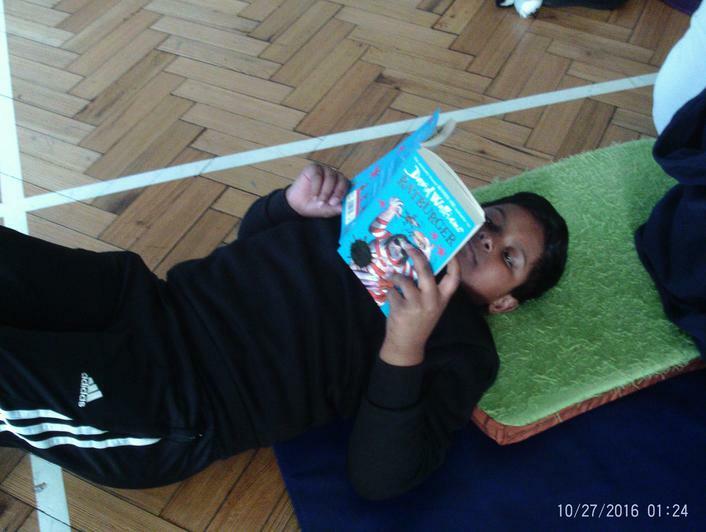 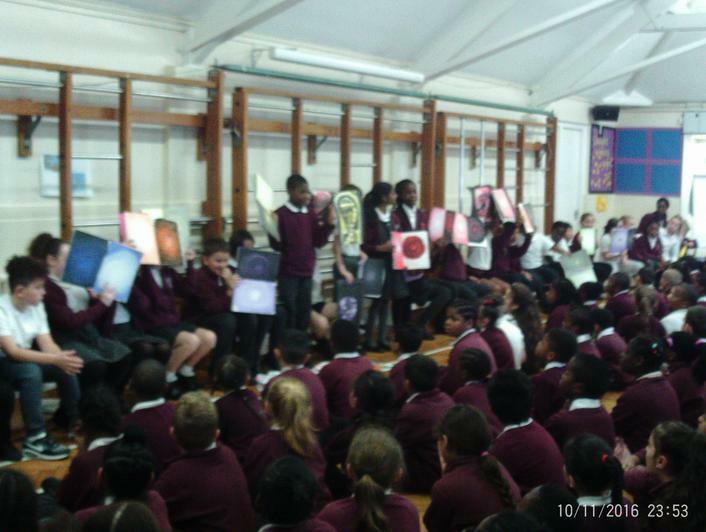 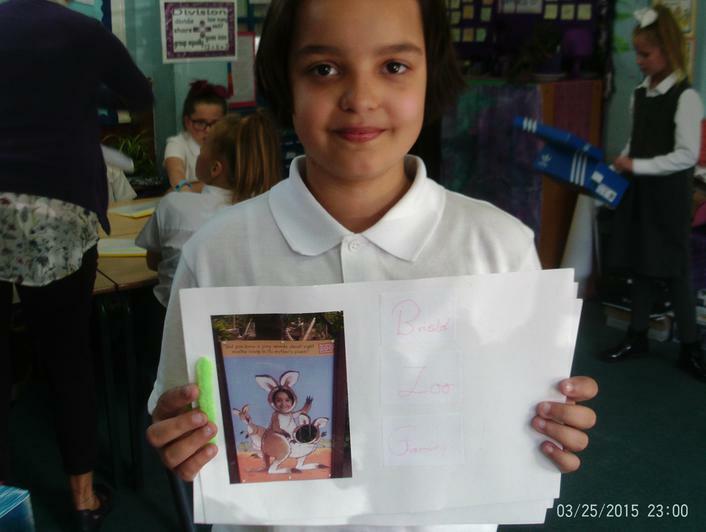 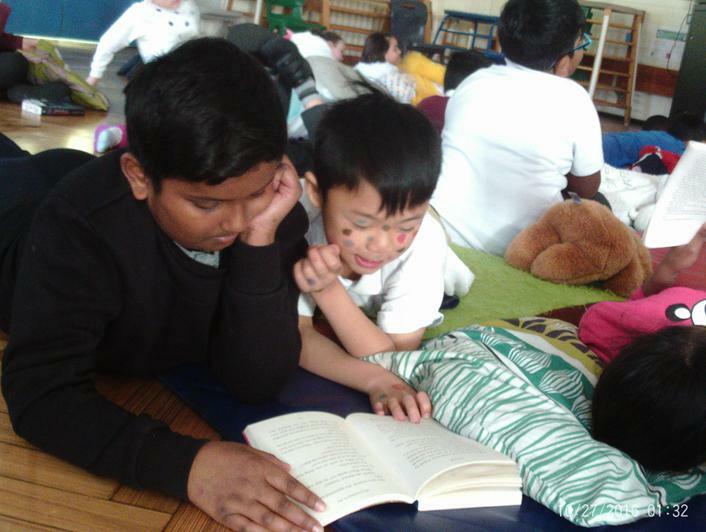 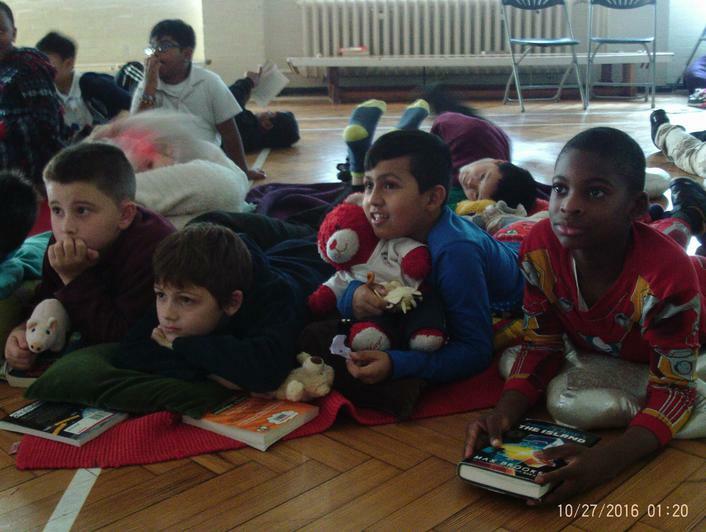 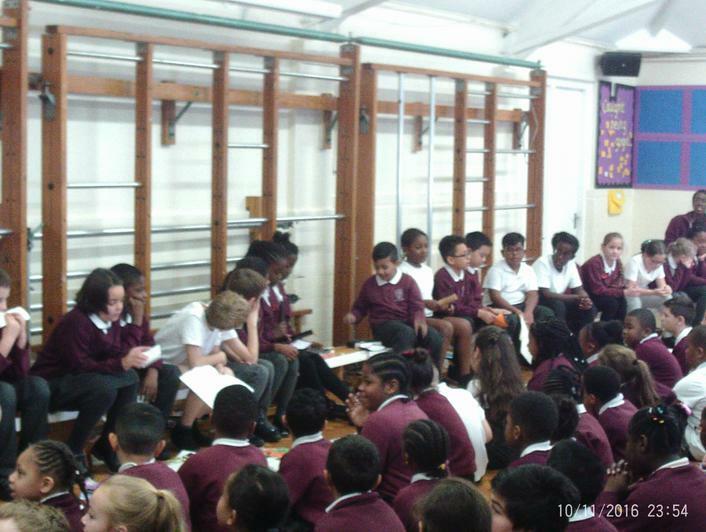 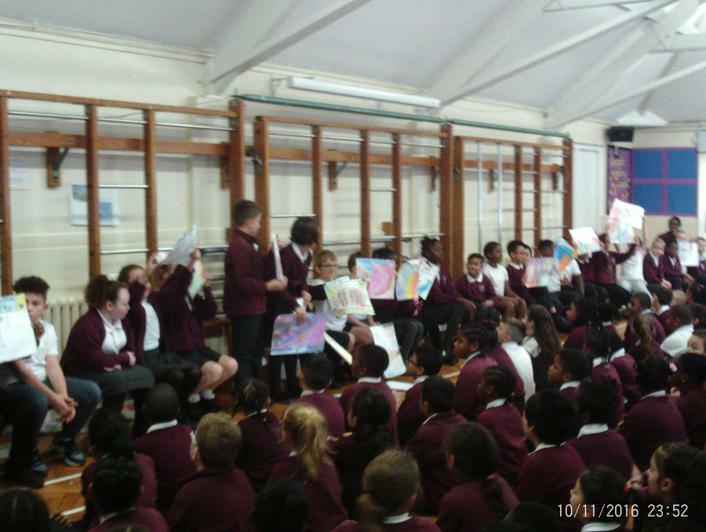 Children were given time to read their own choice of books in a relaxed and enjoyable environment. 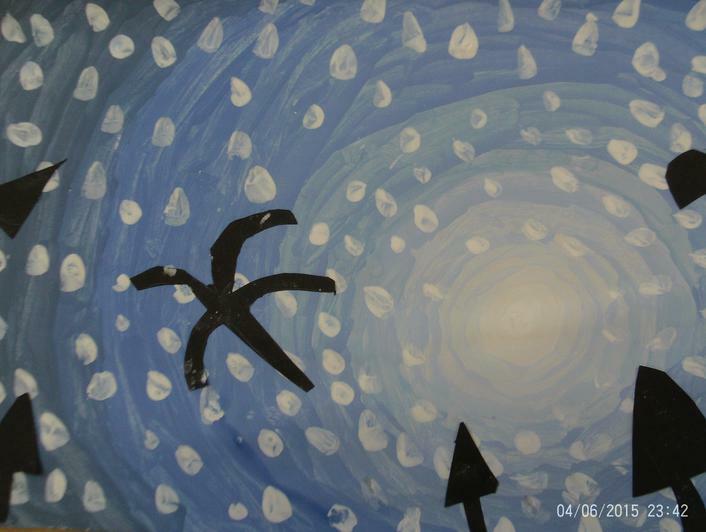 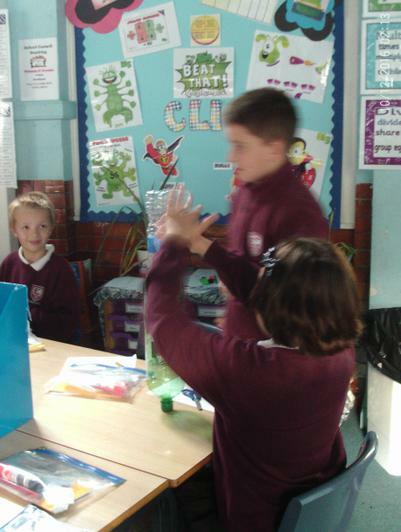 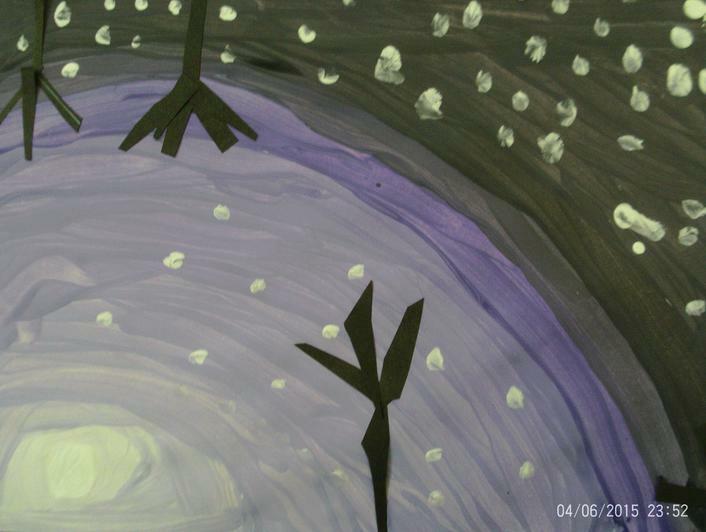 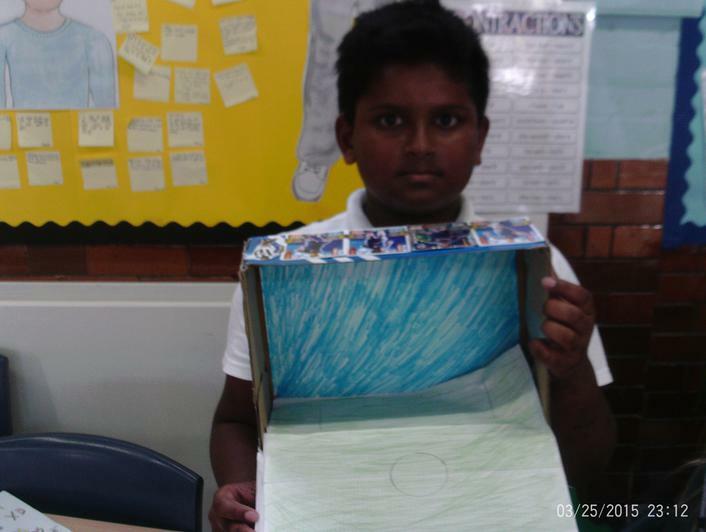 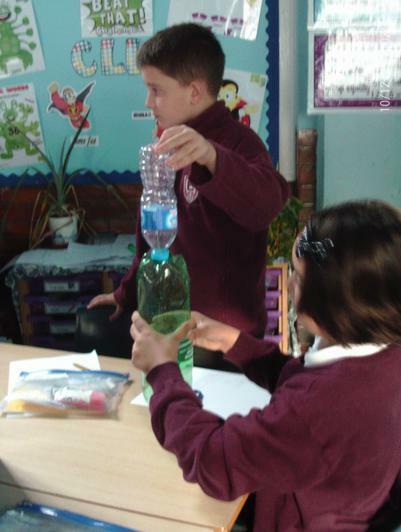 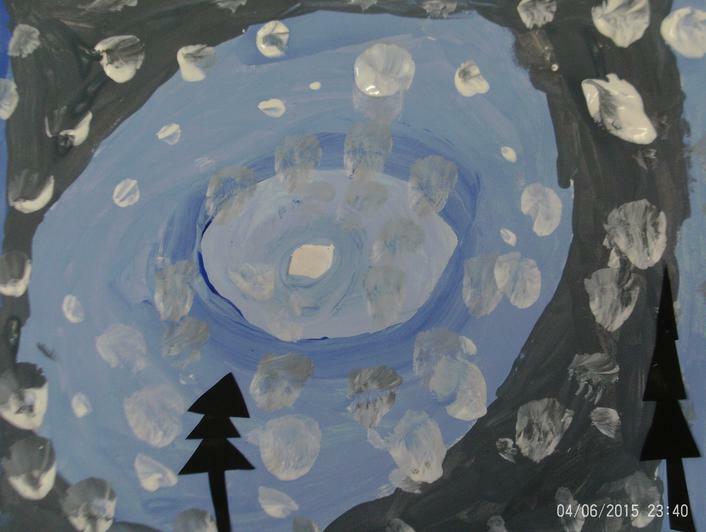 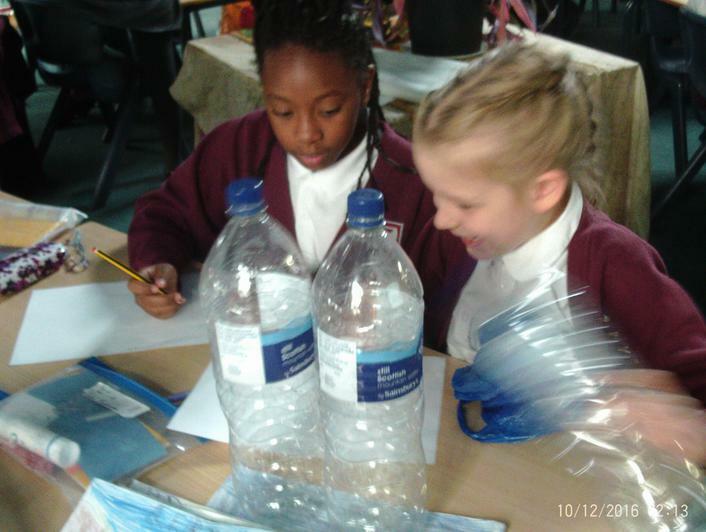 This week, we combined science (The Water Cycle) and DT. 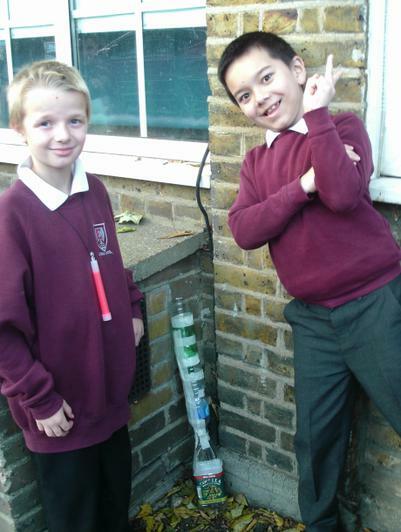 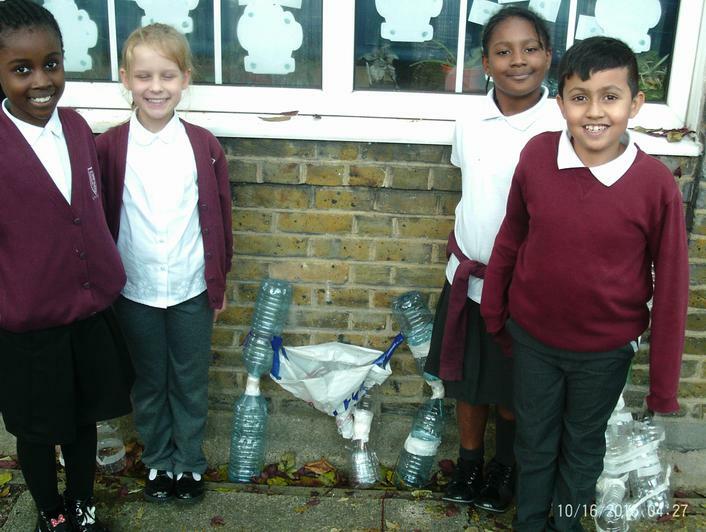 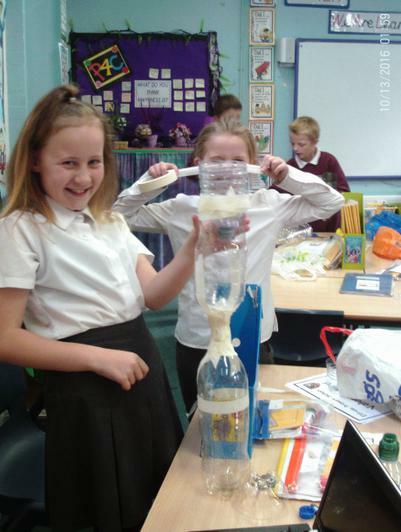 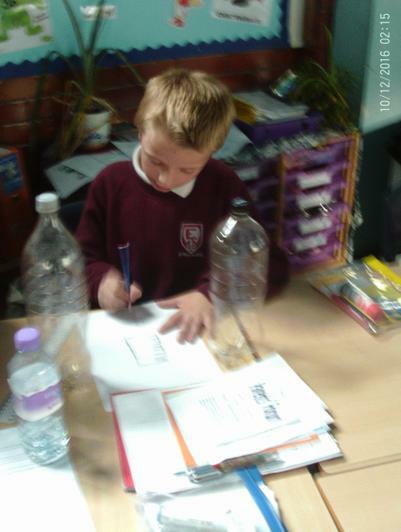 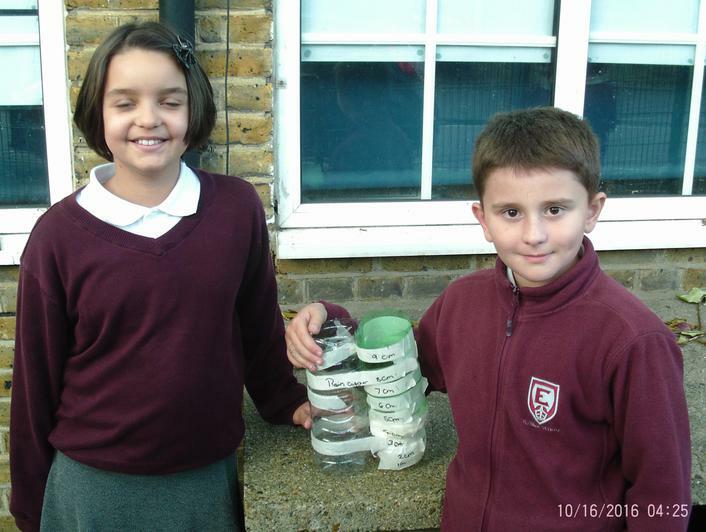 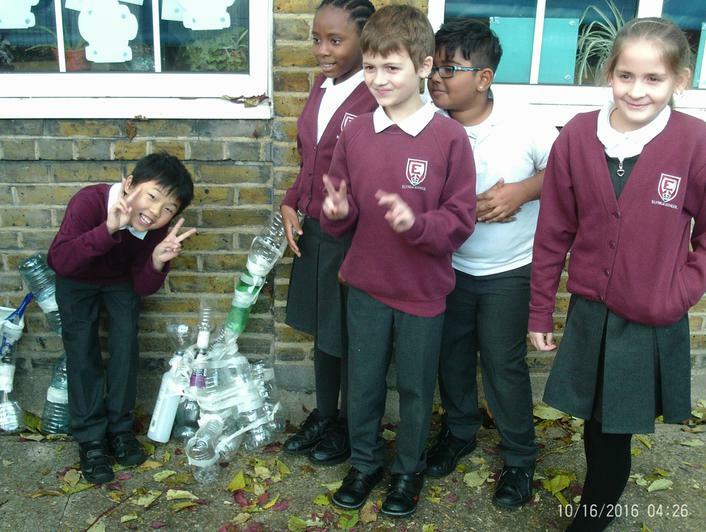 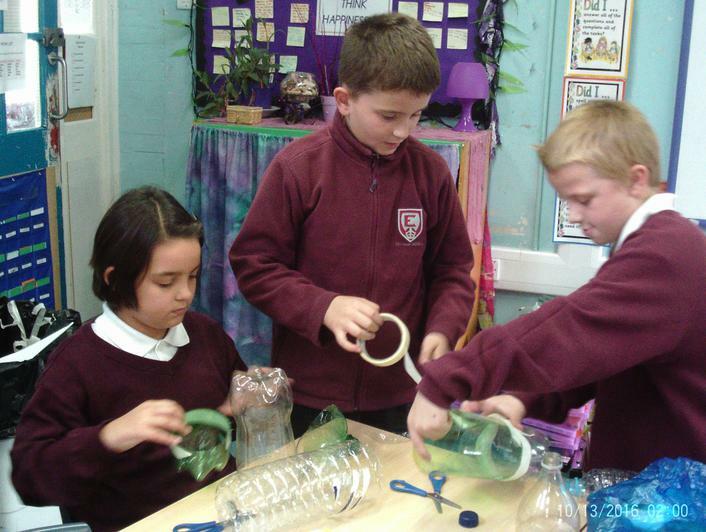 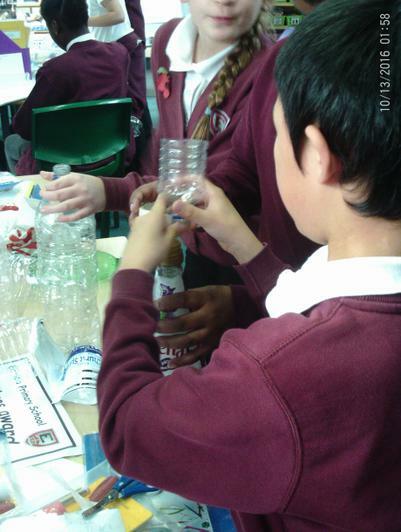 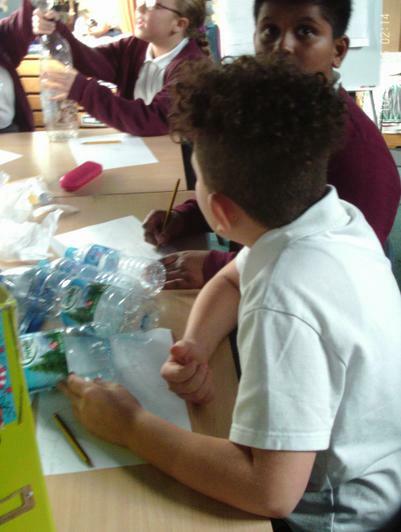 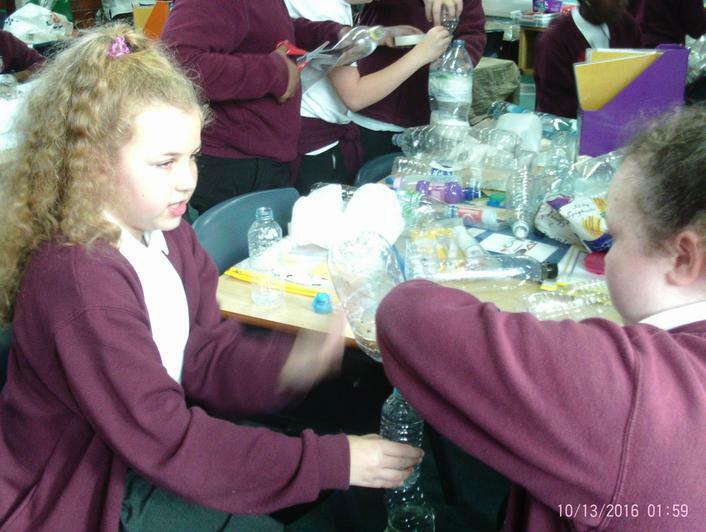 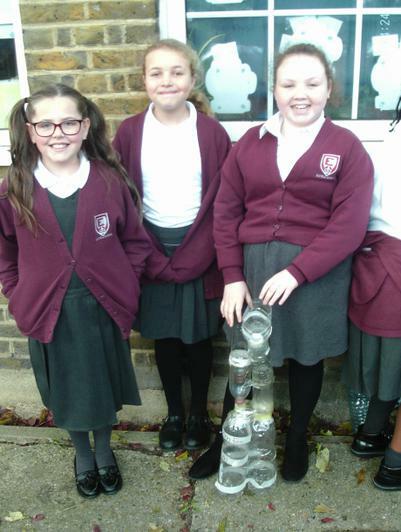 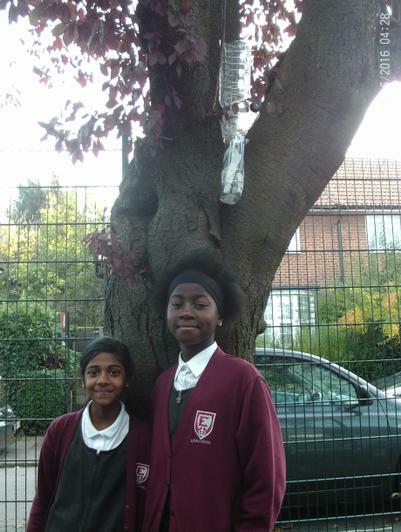 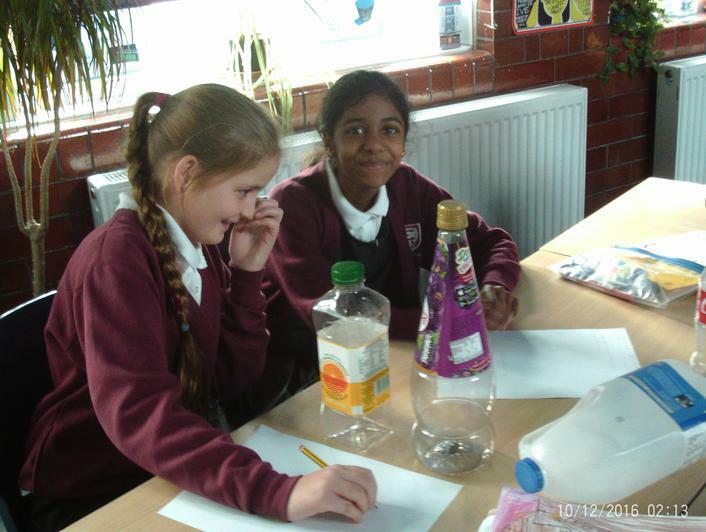 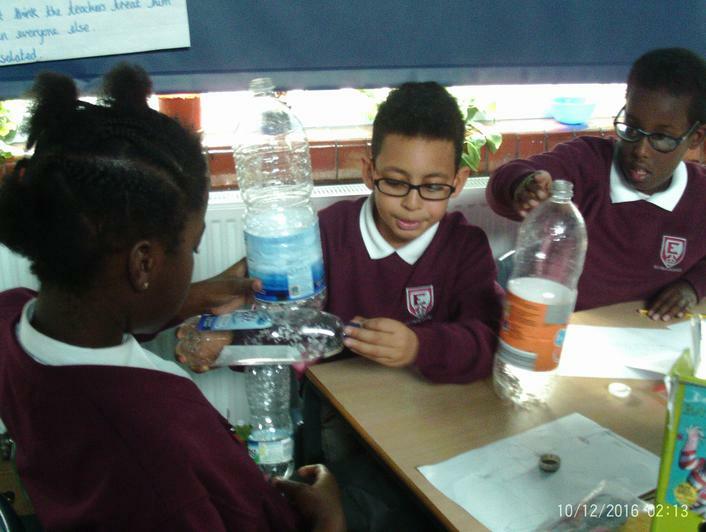 The children designed and made their own water catchers. 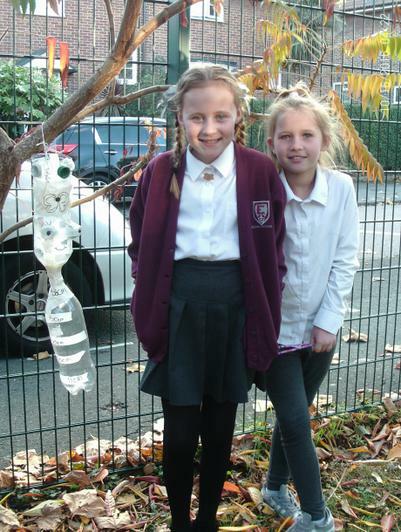 These have now been placed outside and over the next week, they will be monitoring them and checking how much water they have collected. 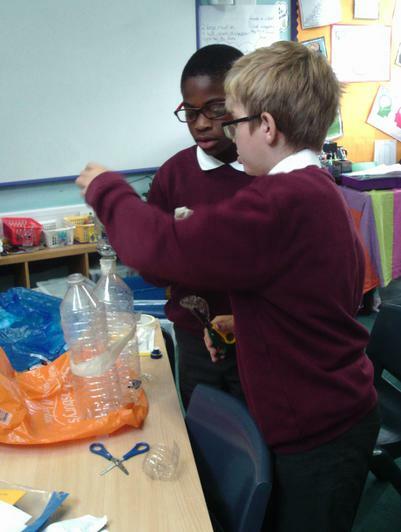 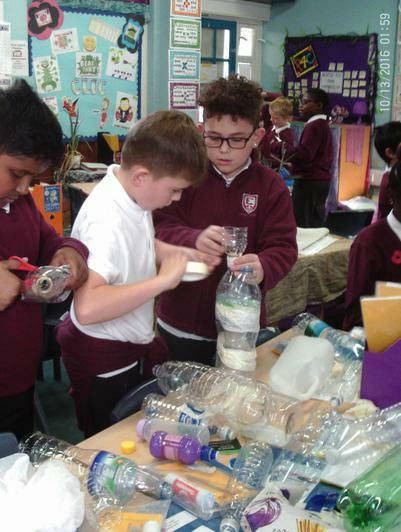 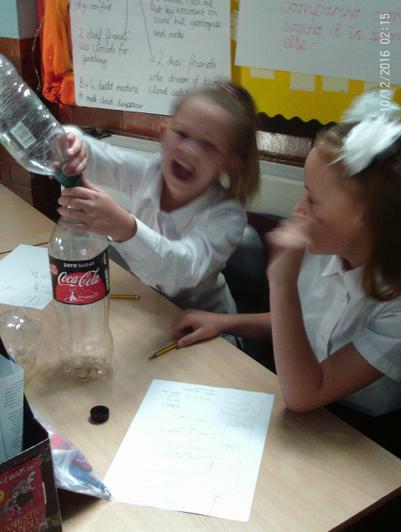 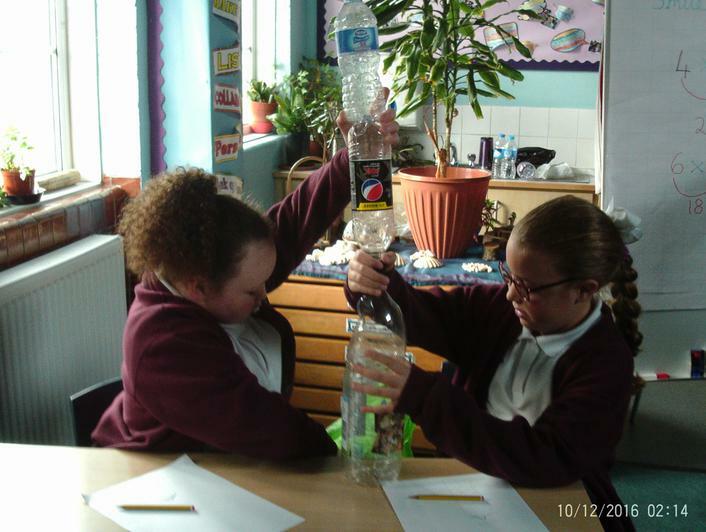 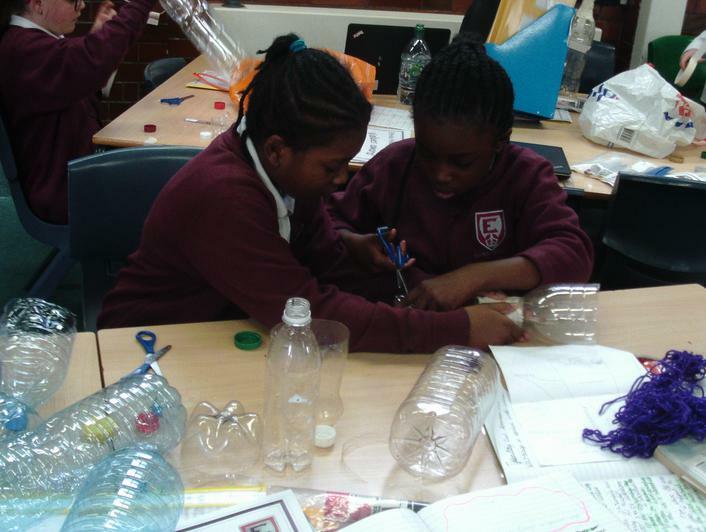 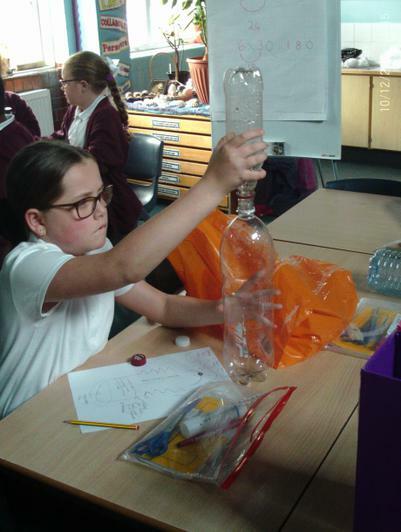 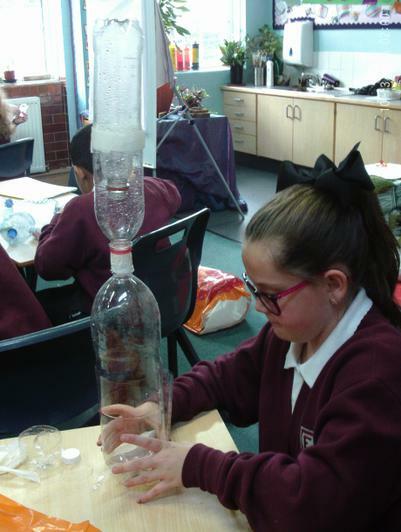 At the end, they will be evaluating and re-designing their water catchers to try and improve them. 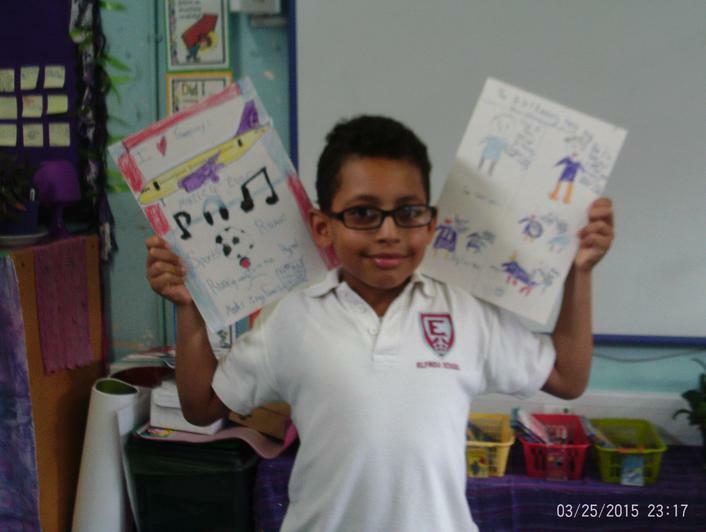 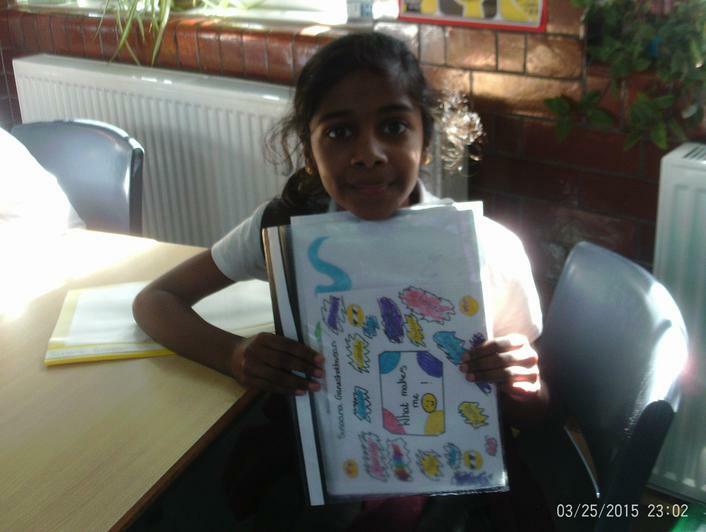 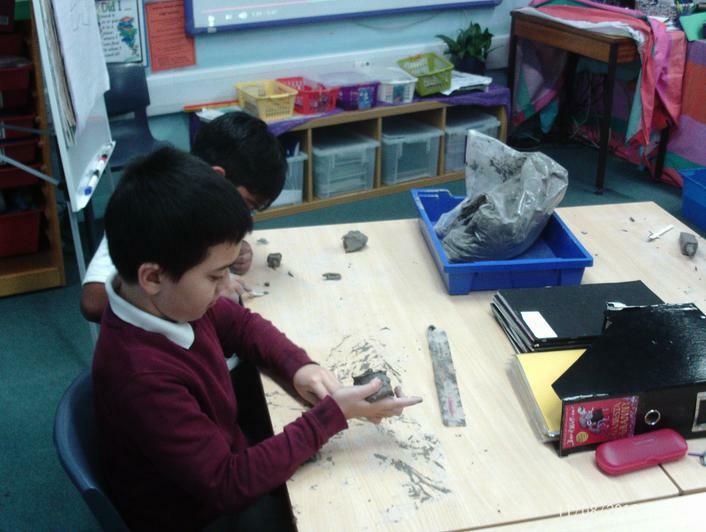 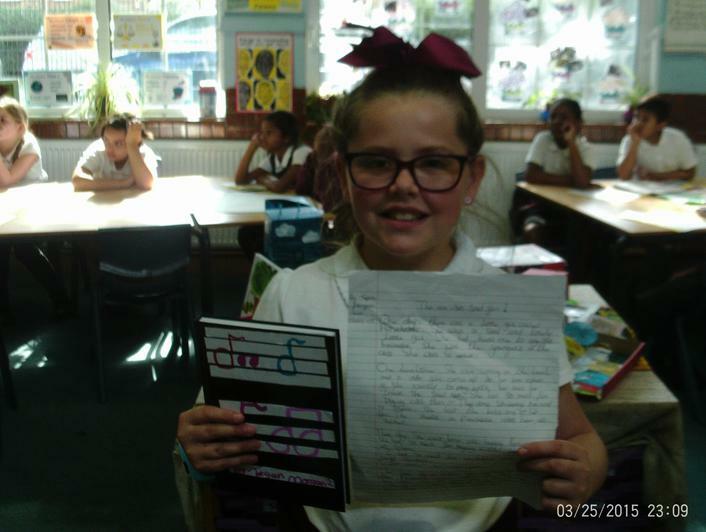 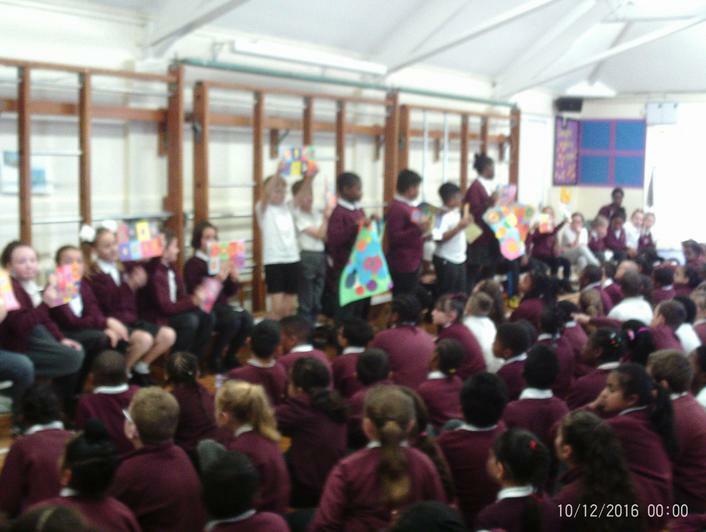 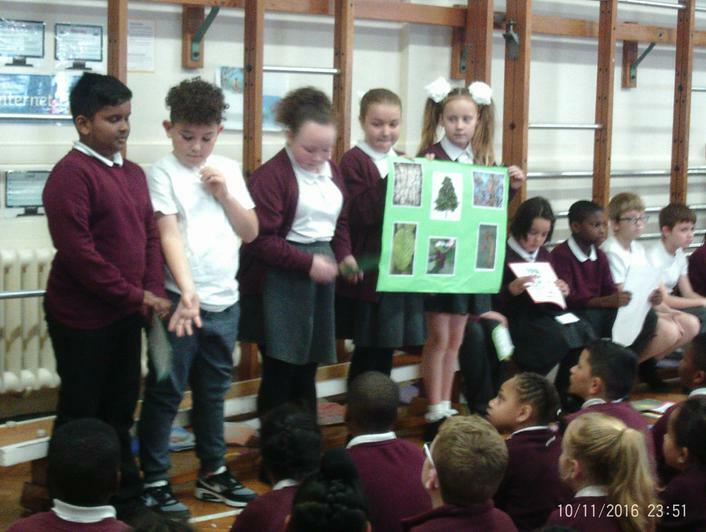 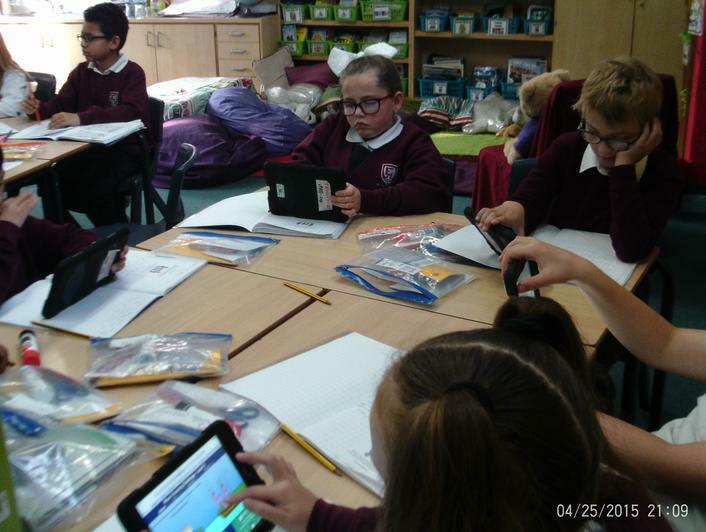 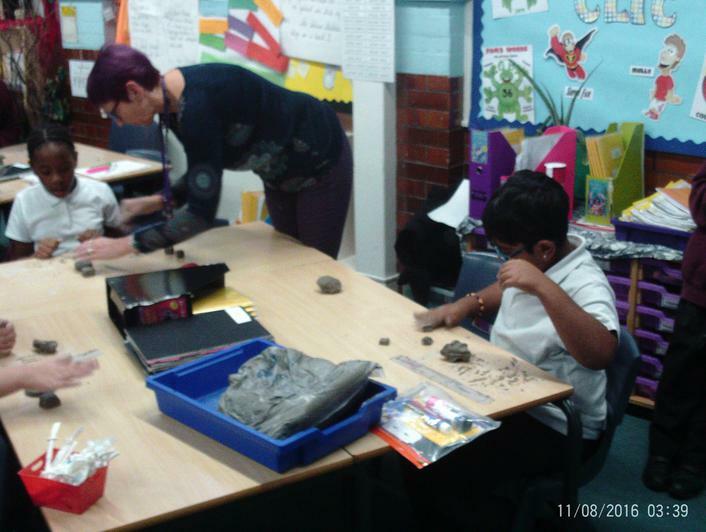 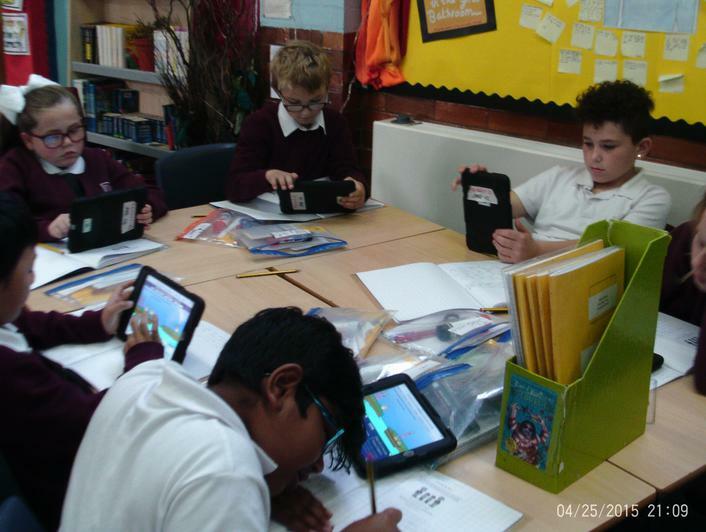 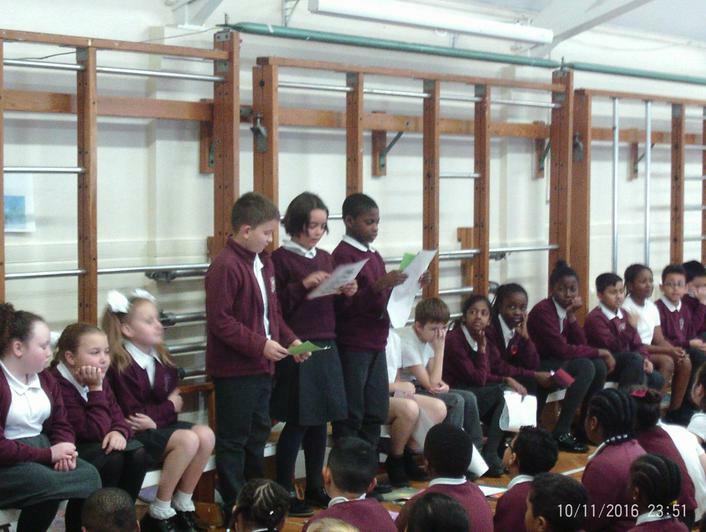 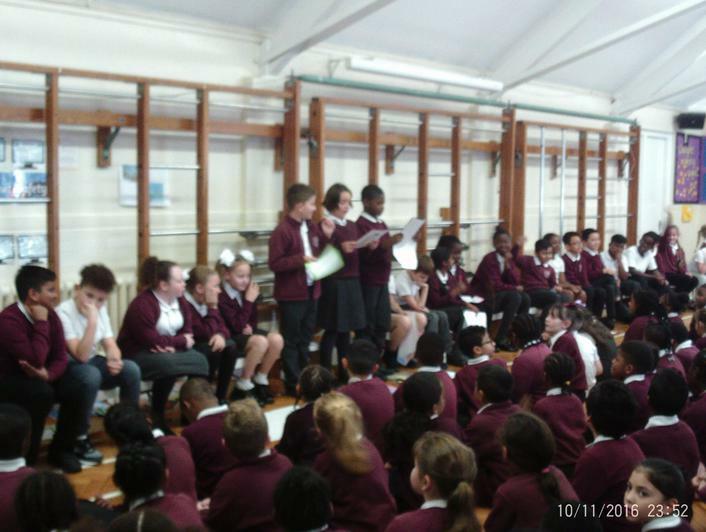 Last Thursday (2nd November), Alder class shared a fantastic selection of their learning so far this term. 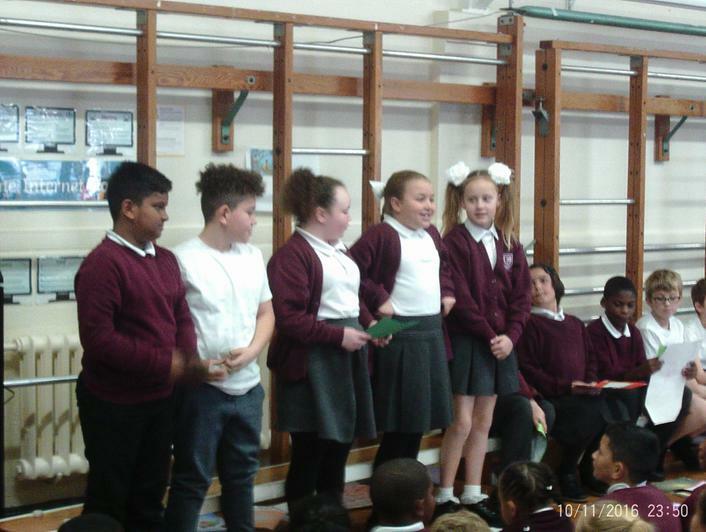 There was: music; artwork linked to maths, topic and growth mindset; interesting facts about Alder trees; poetry recitals and drama, BIG Maths secrets were shared; and much, much more. 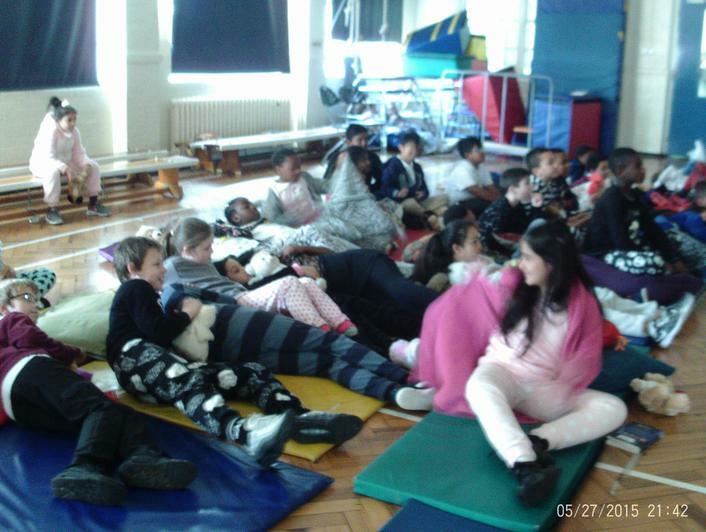 Thank you to all the adults who were able to come and watch. 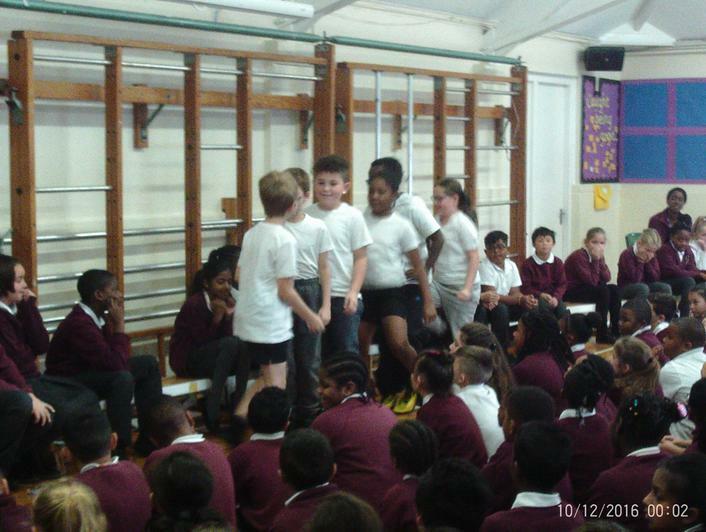 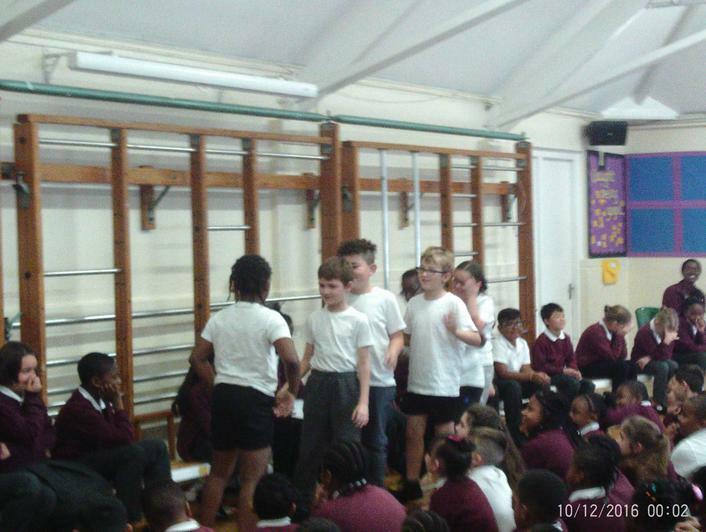 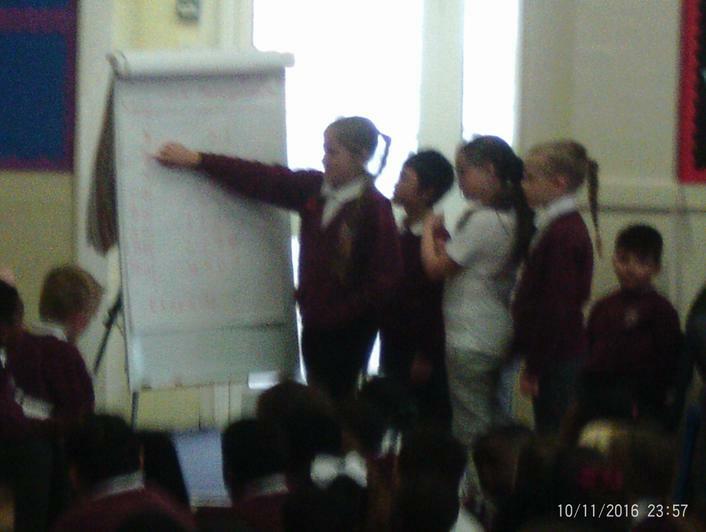 The children performed amazingly and thoroughly enjoyed sharing their learning. 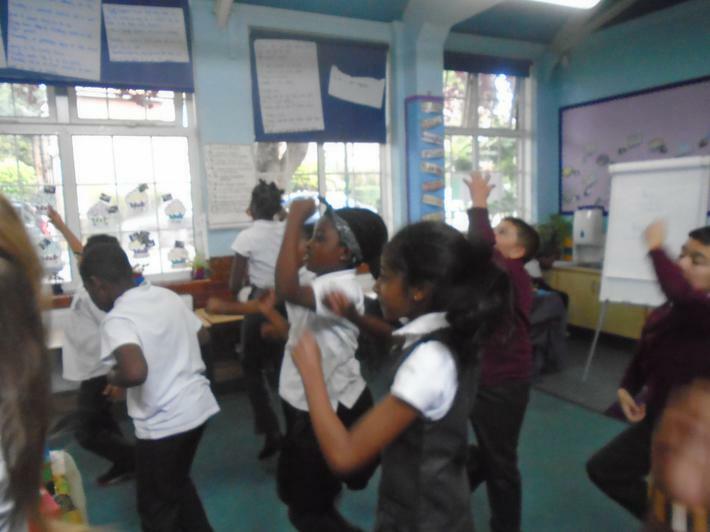 Following on from the Joe Wicks HIIT exercises the children have been creating, this week they focused on combining HIIT exercises and BIG Maths. 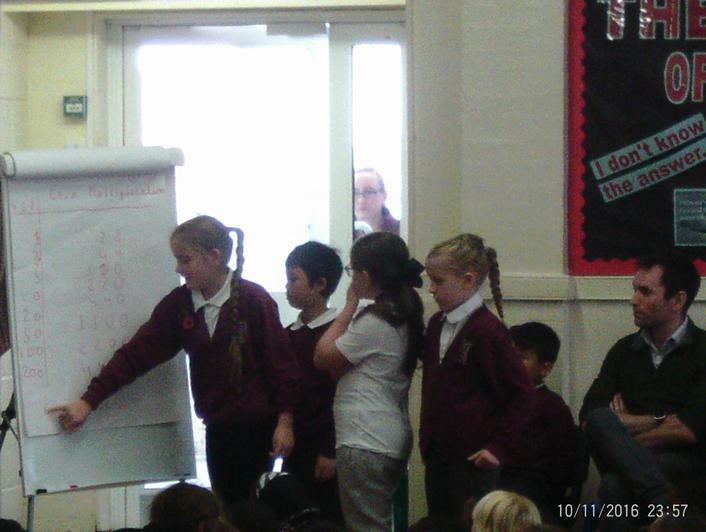 They had to come up with an exercise for each of the BIG Maths characters: Count Fourways, Squiggleworth, Mully, Super Fab, Pim and Pom. 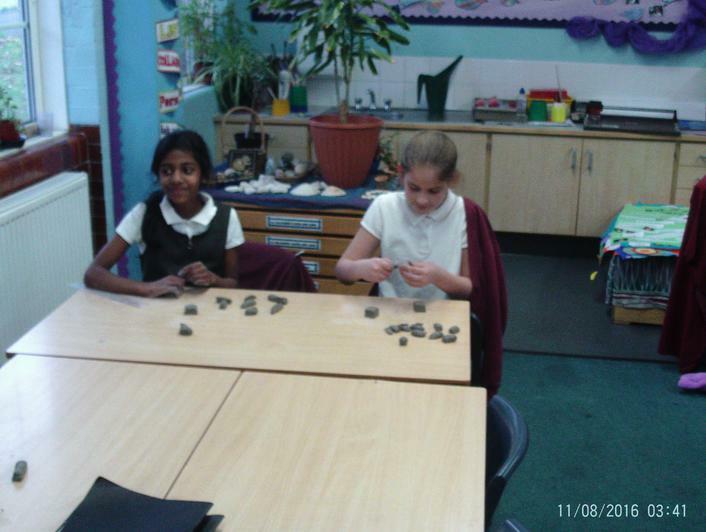 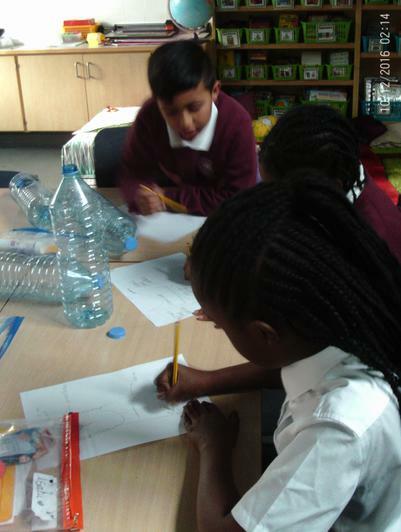 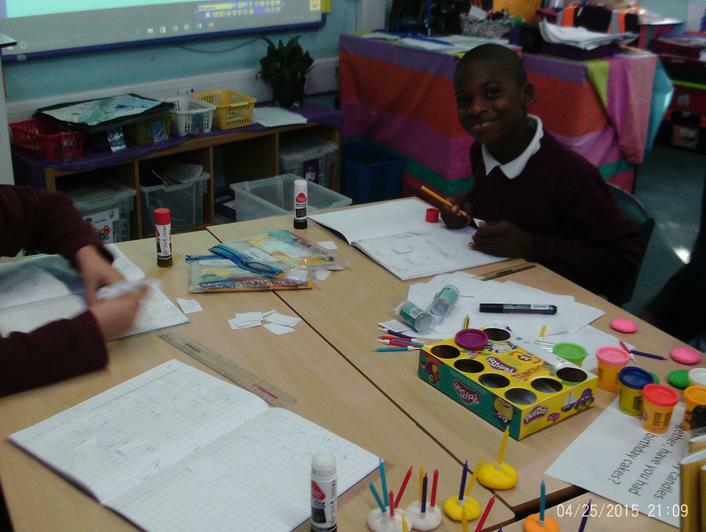 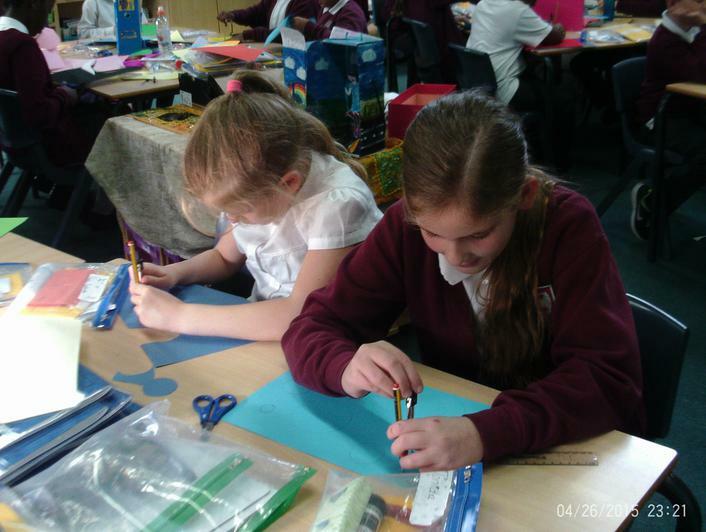 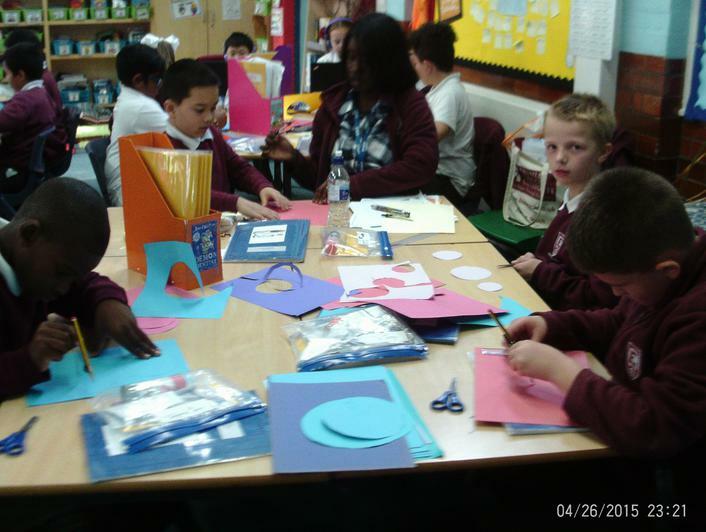 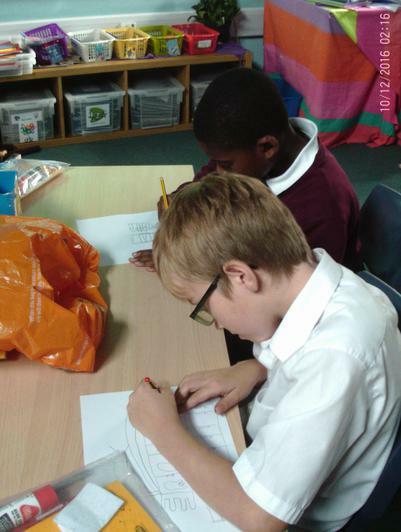 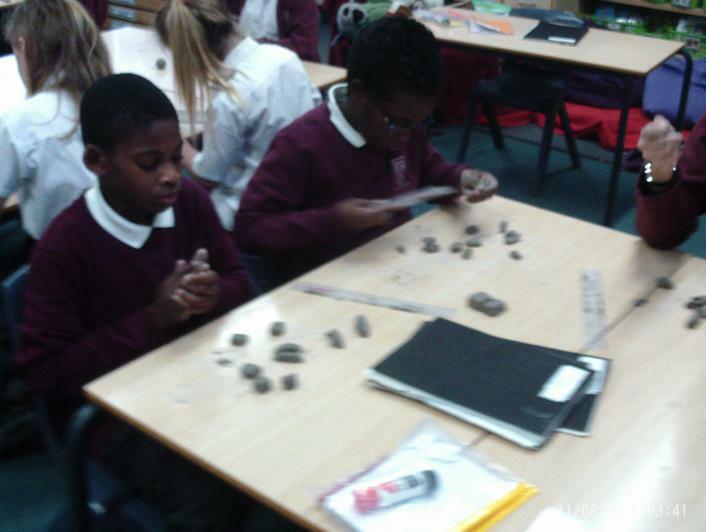 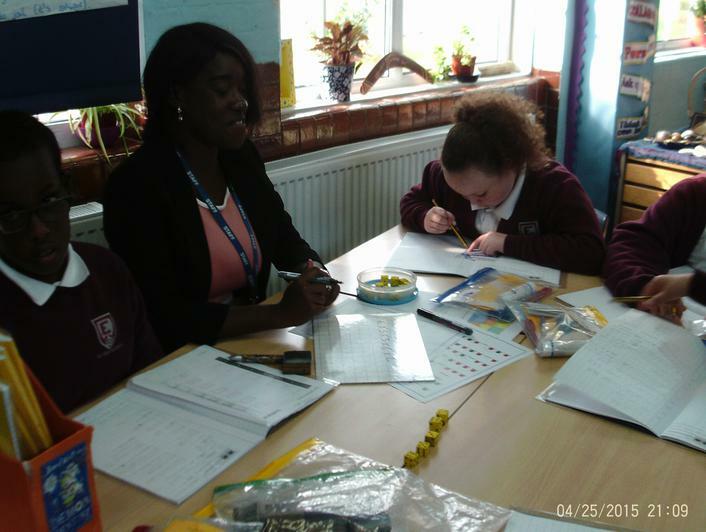 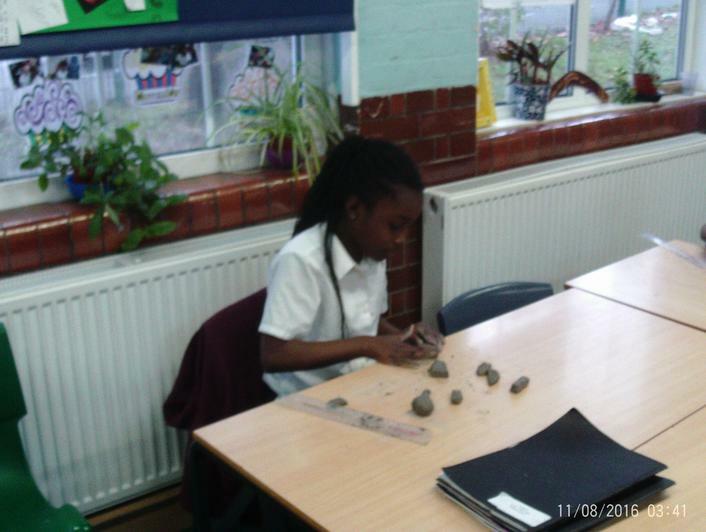 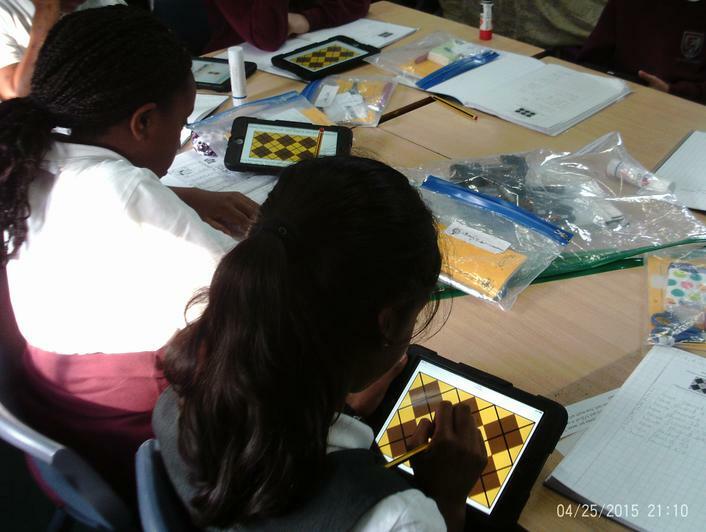 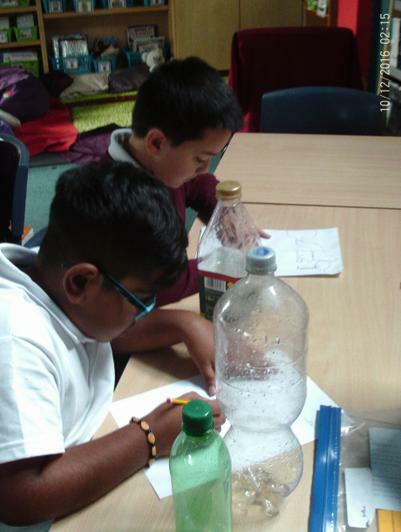 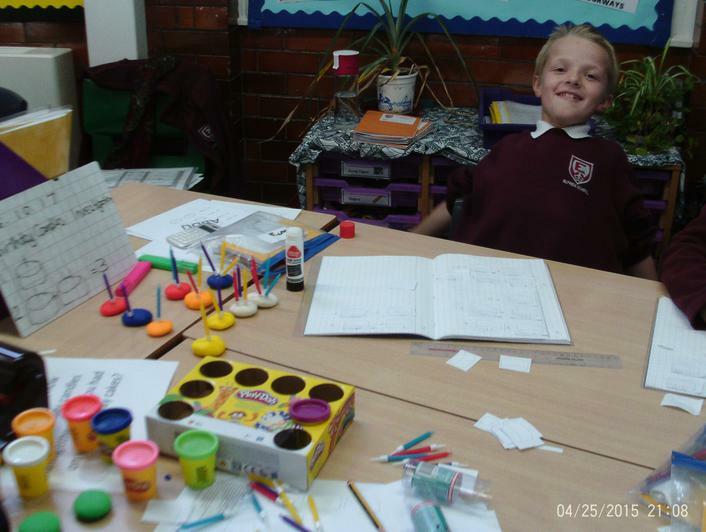 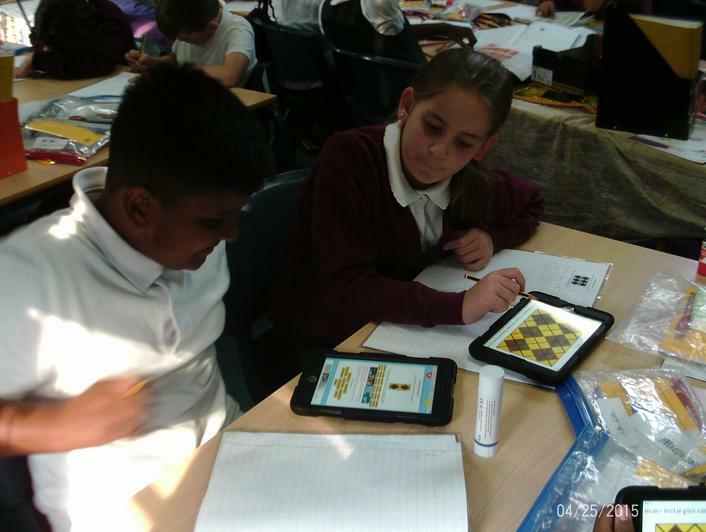 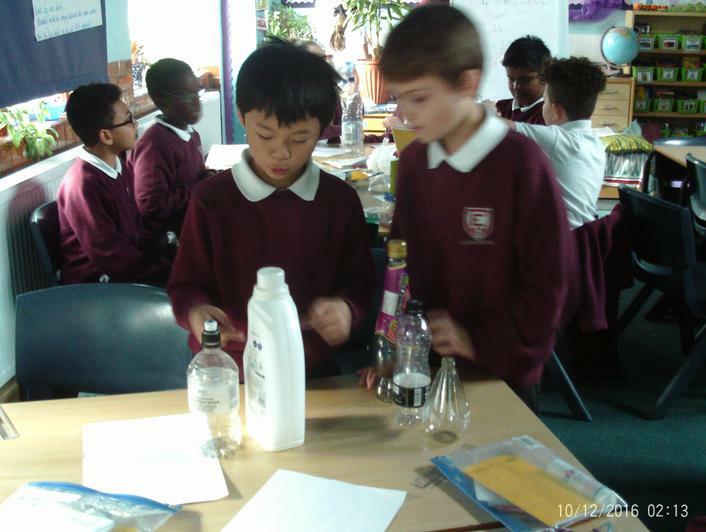 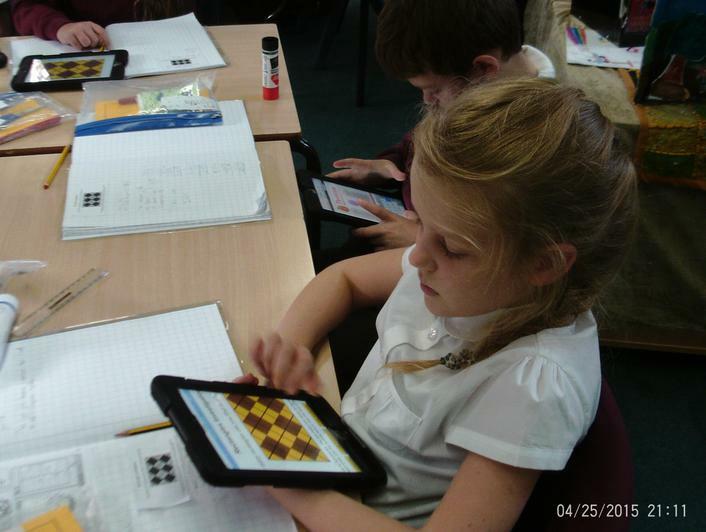 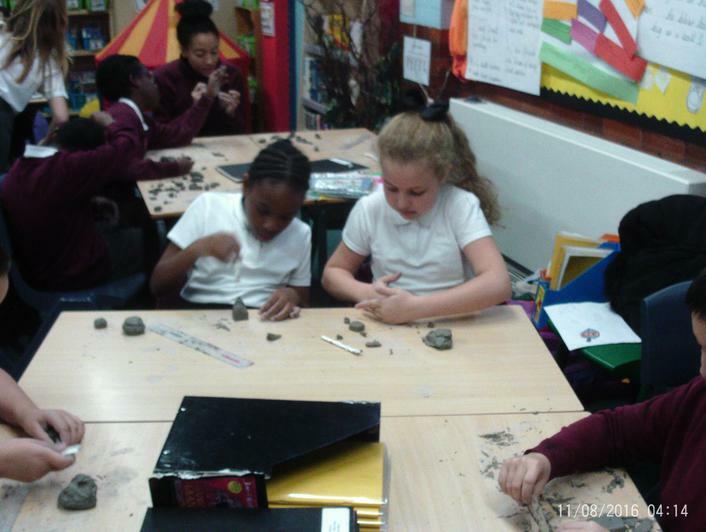 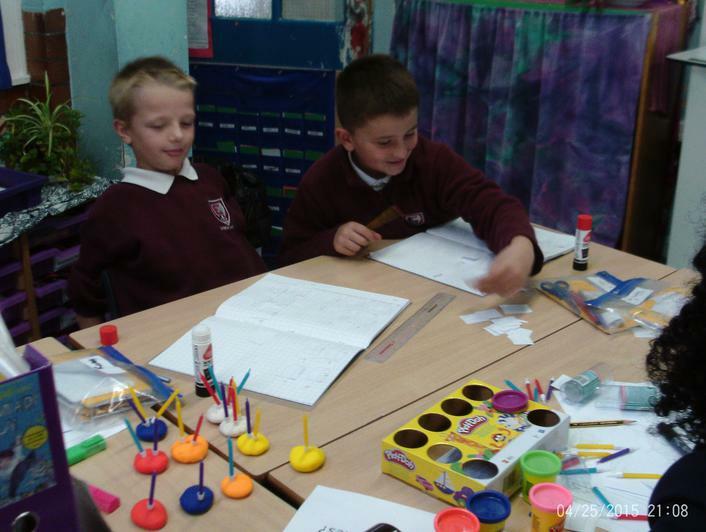 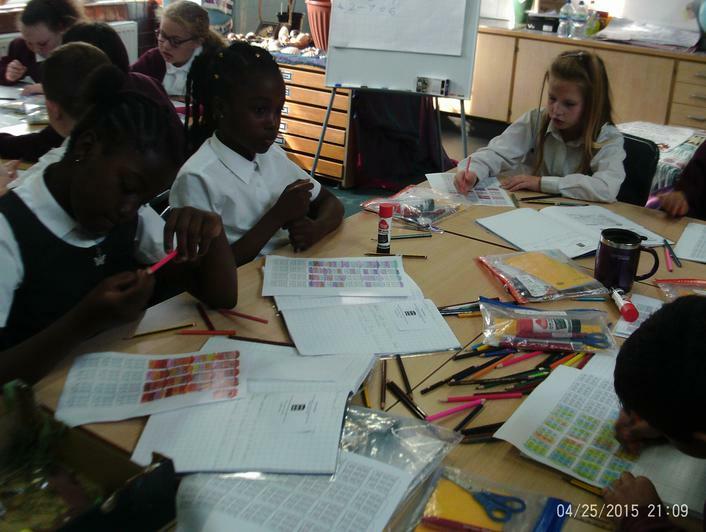 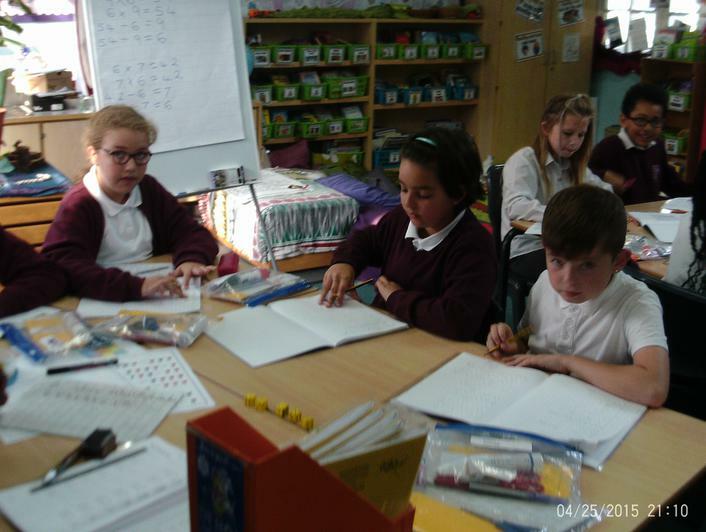 For maths week, the children have been focusing on investigations during their maths lessons. 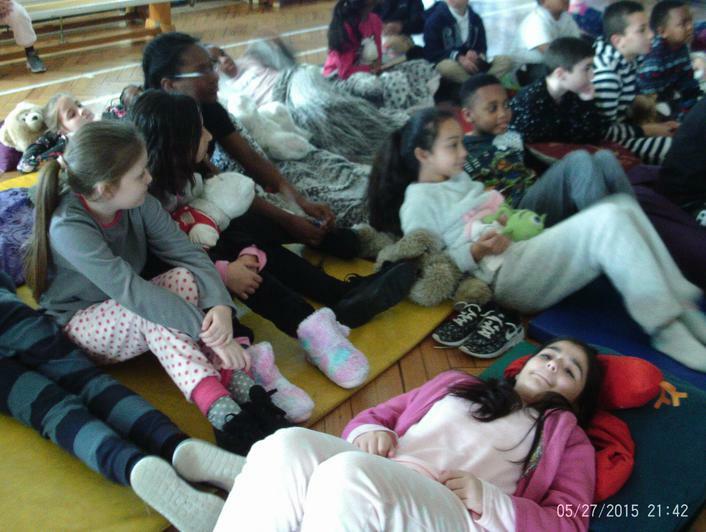 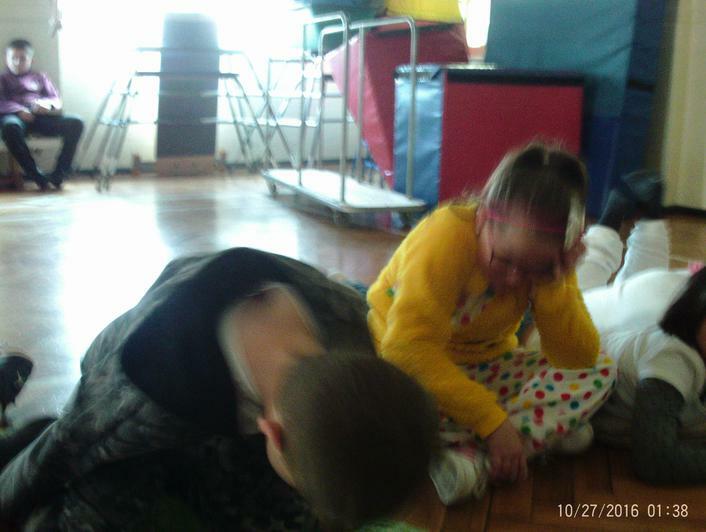 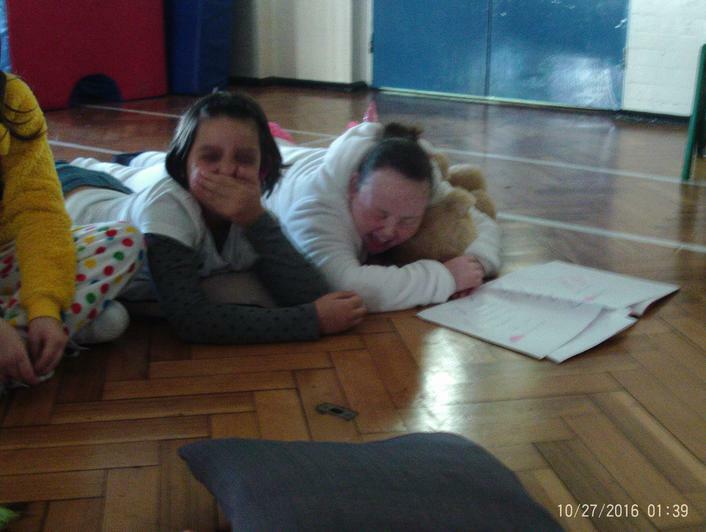 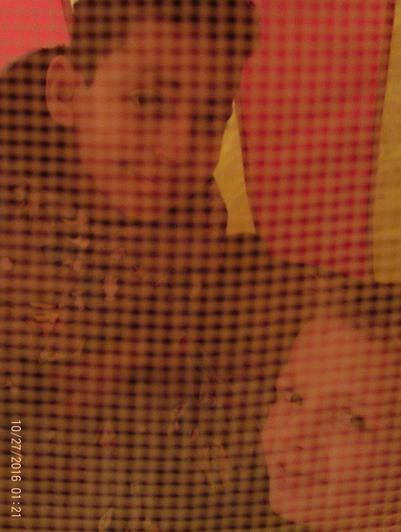 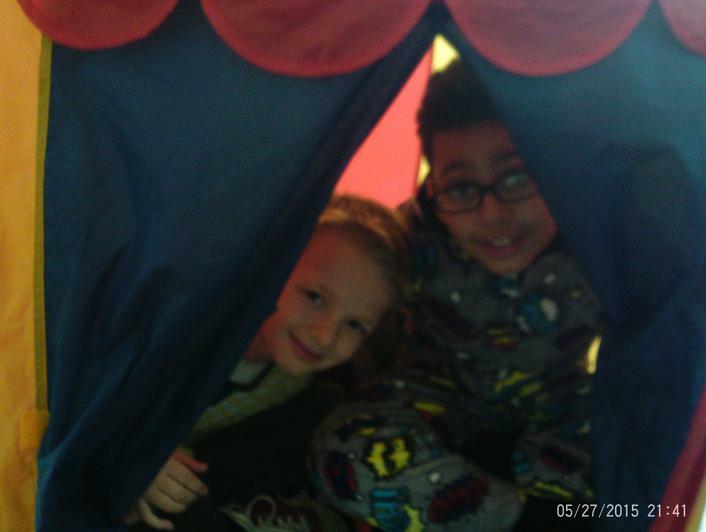 They have experienced a carousel of activities throughout the week. 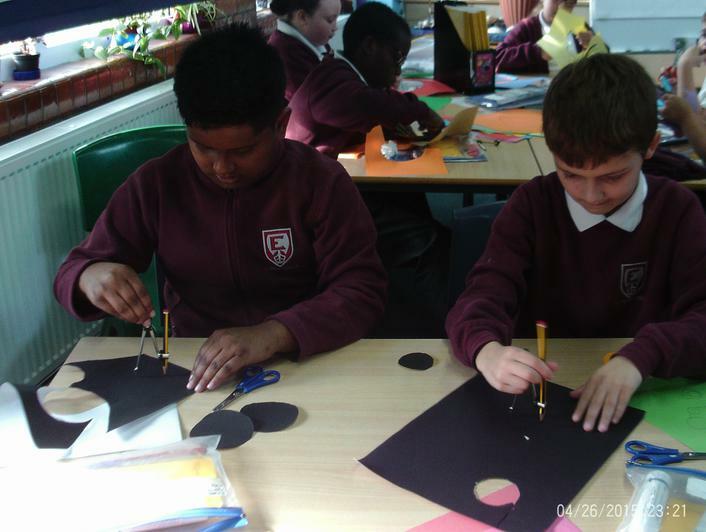 They were learning about the features of a circle and learnt to use a compass. 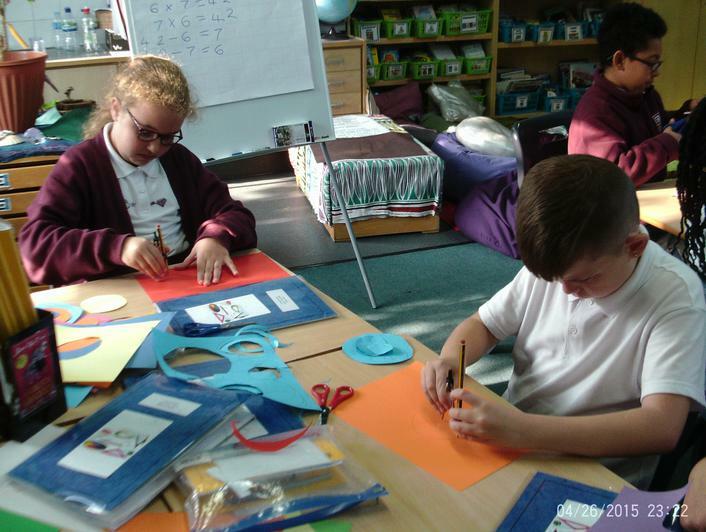 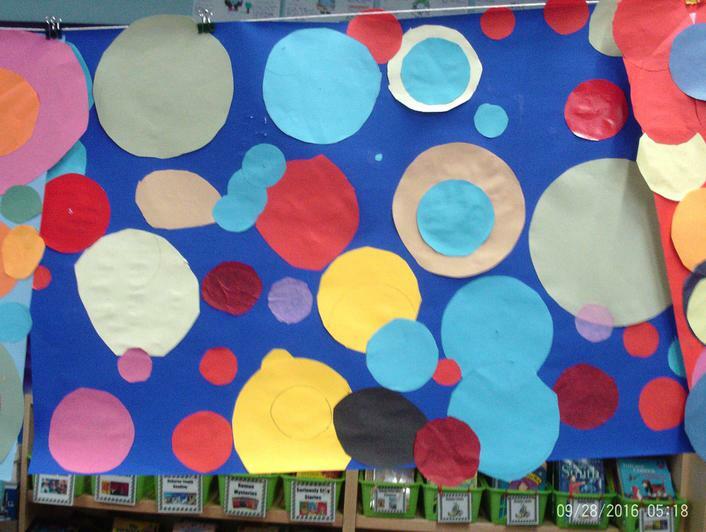 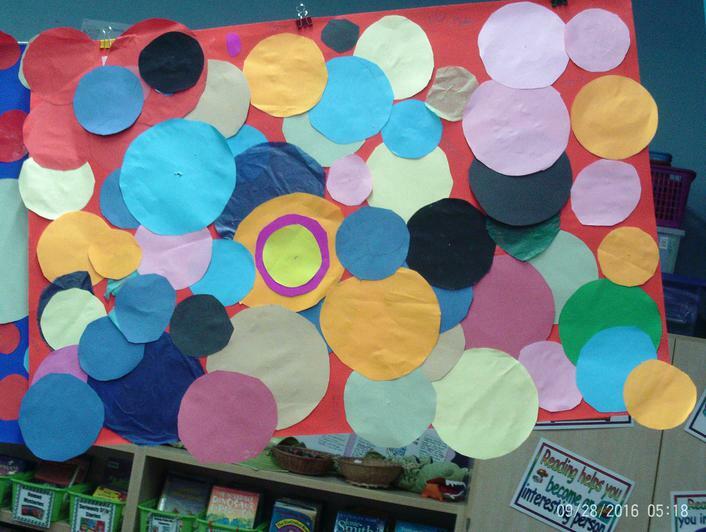 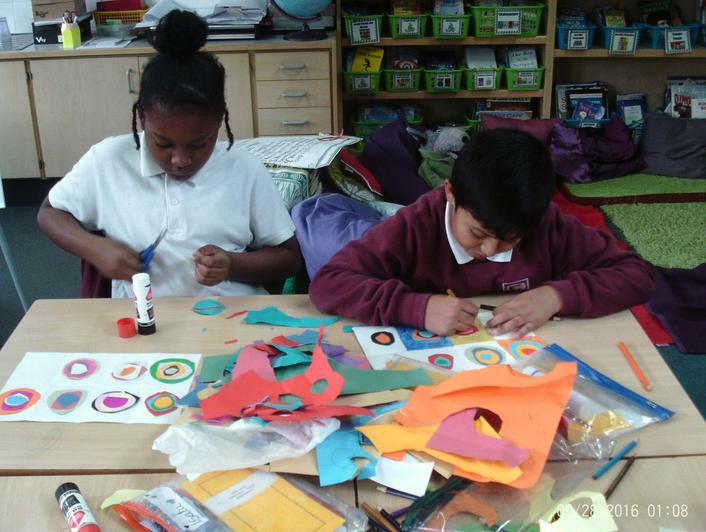 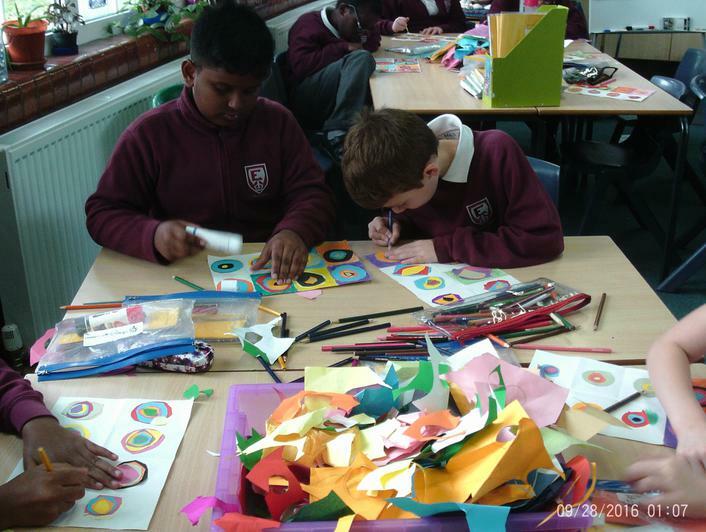 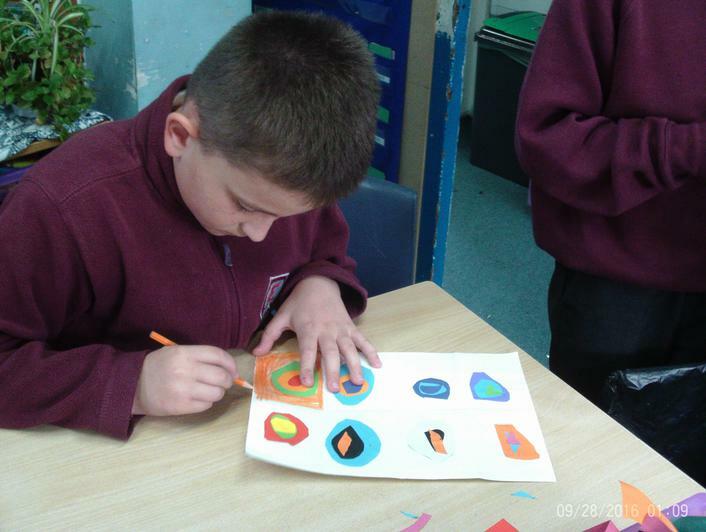 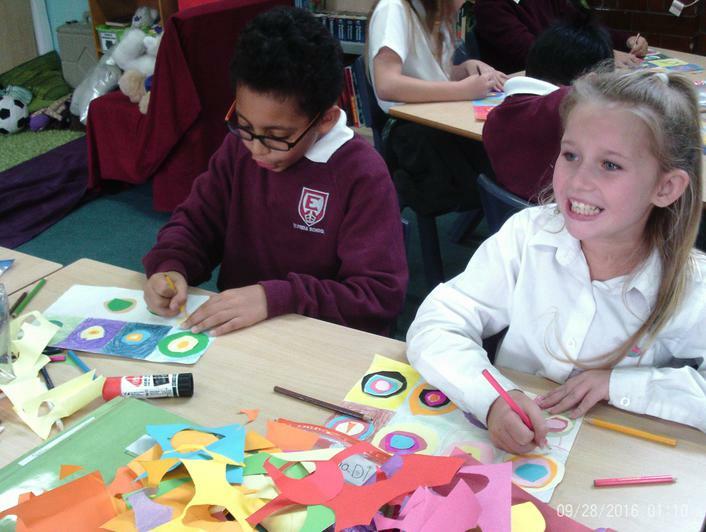 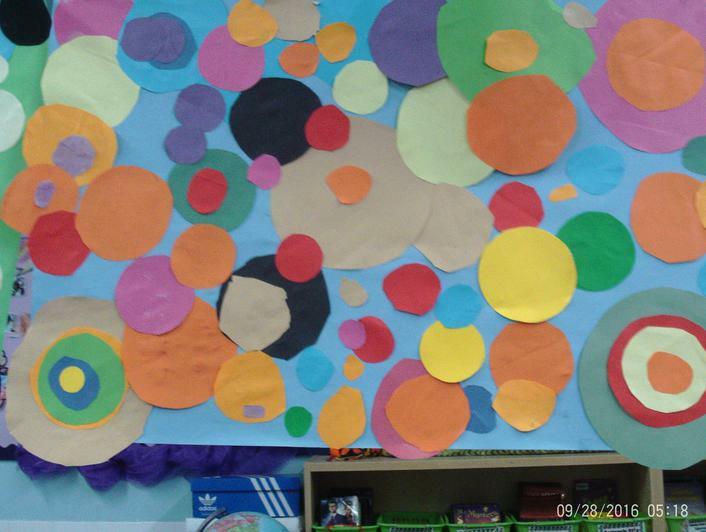 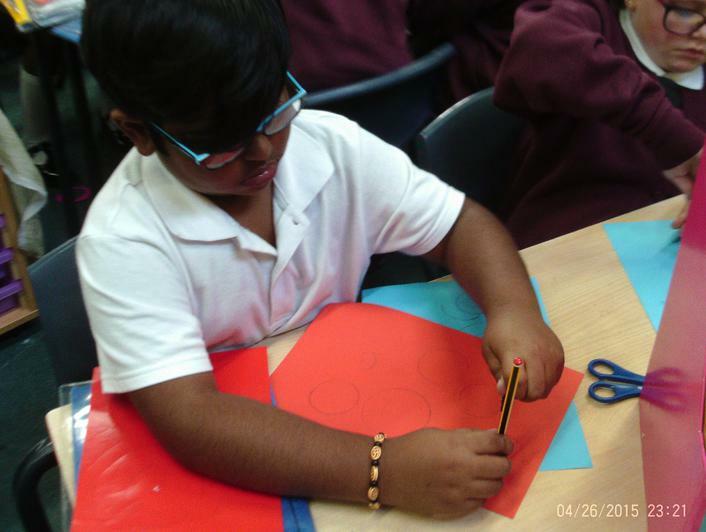 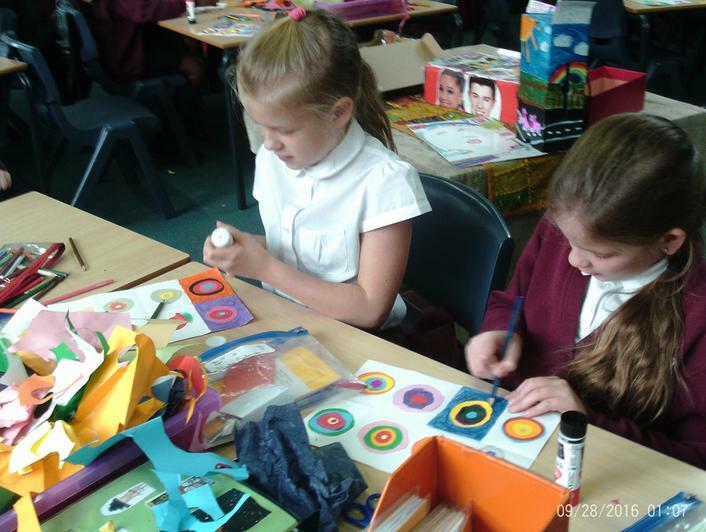 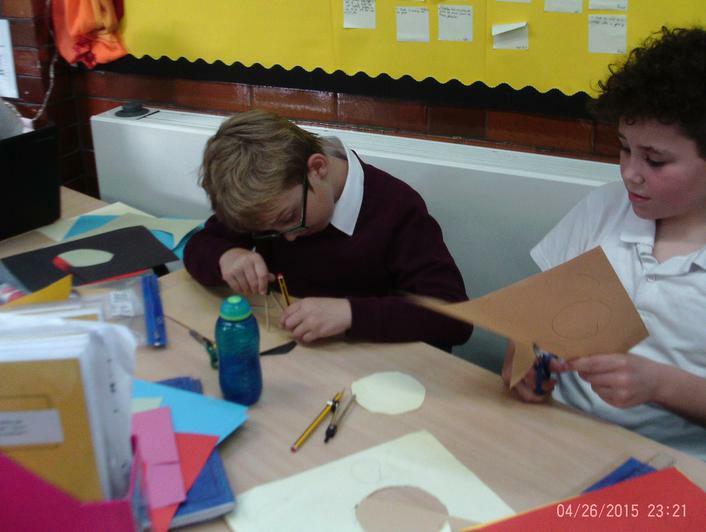 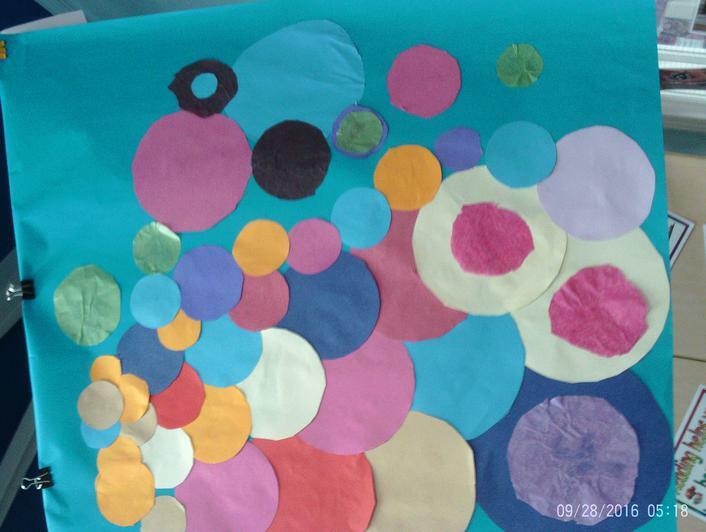 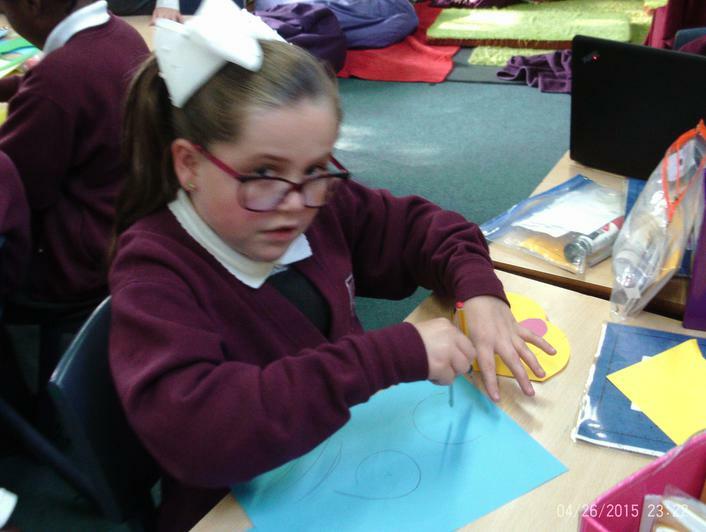 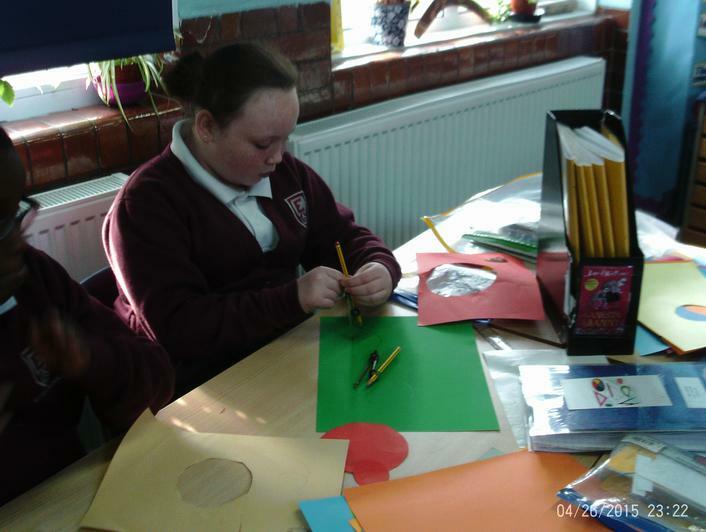 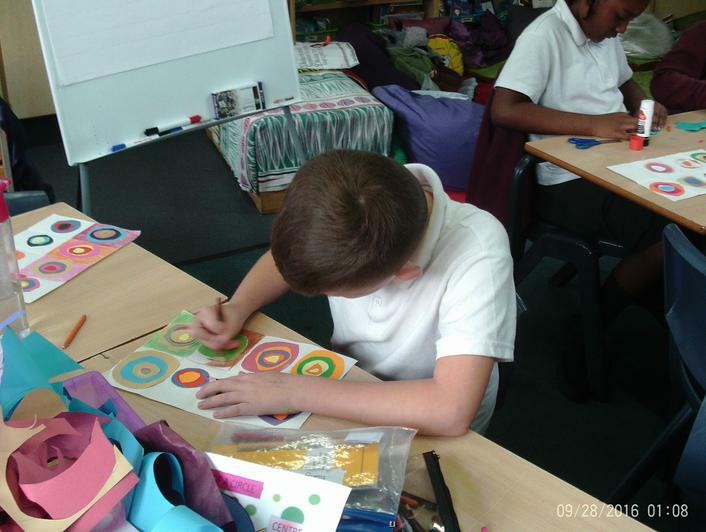 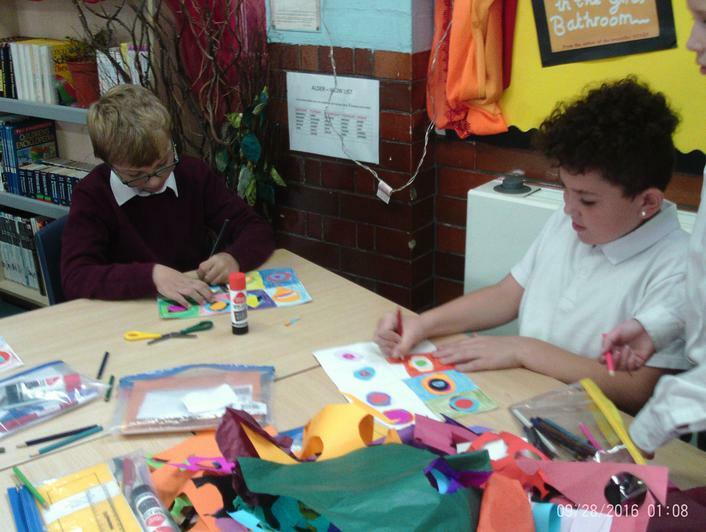 We then used their compass practice to cut out different sized circles and create some beautiful circle art. 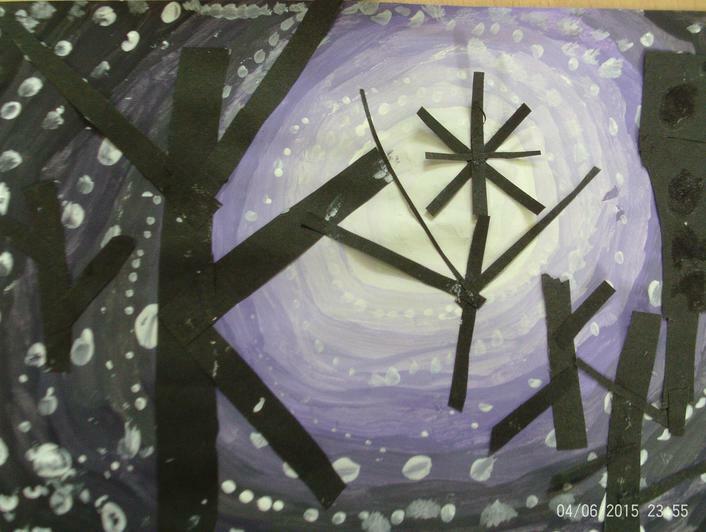 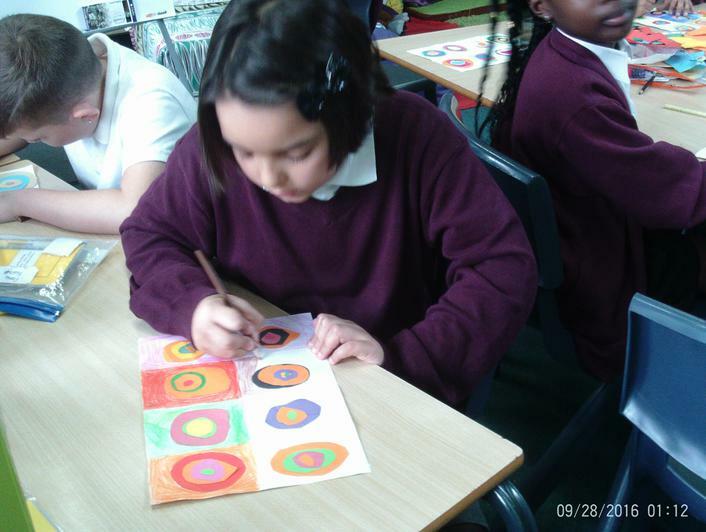 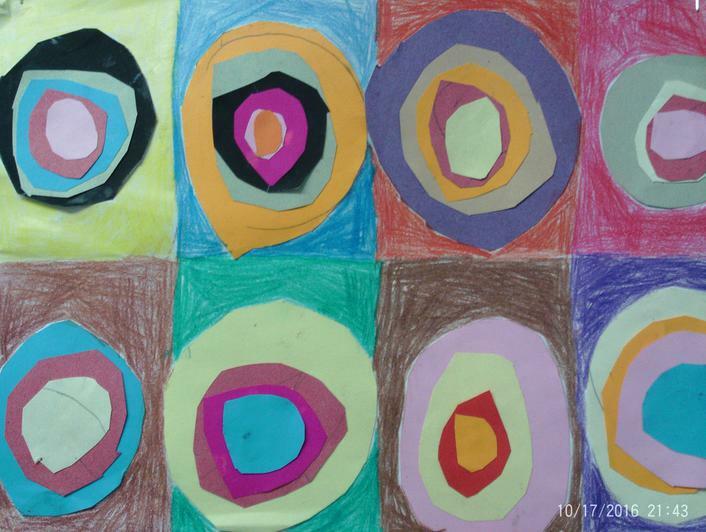 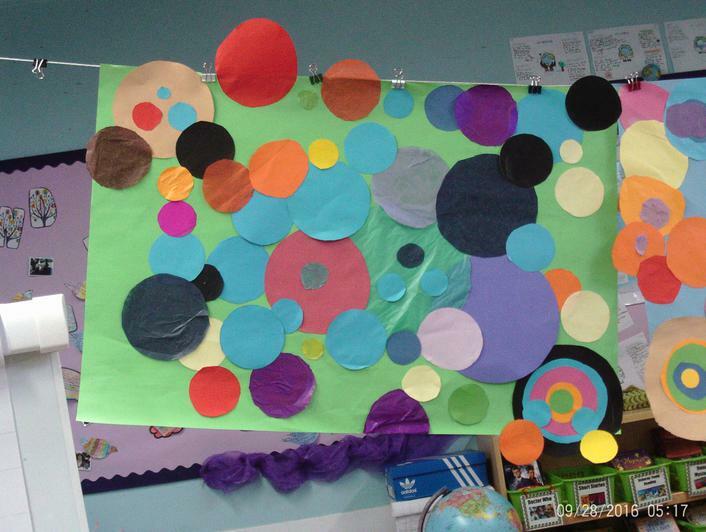 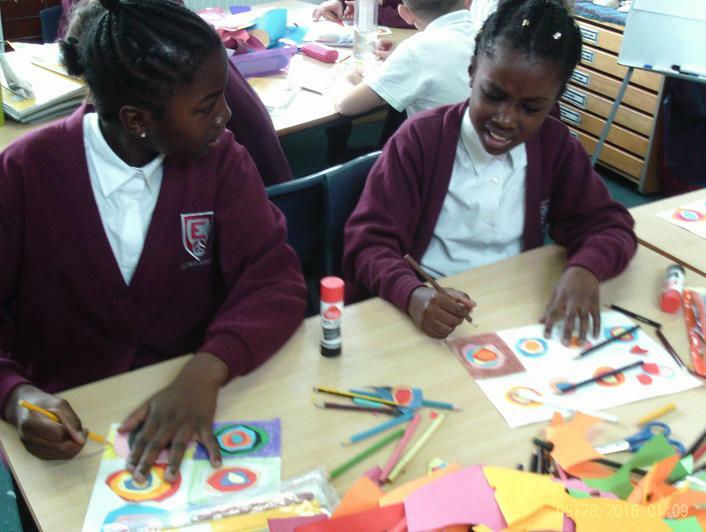 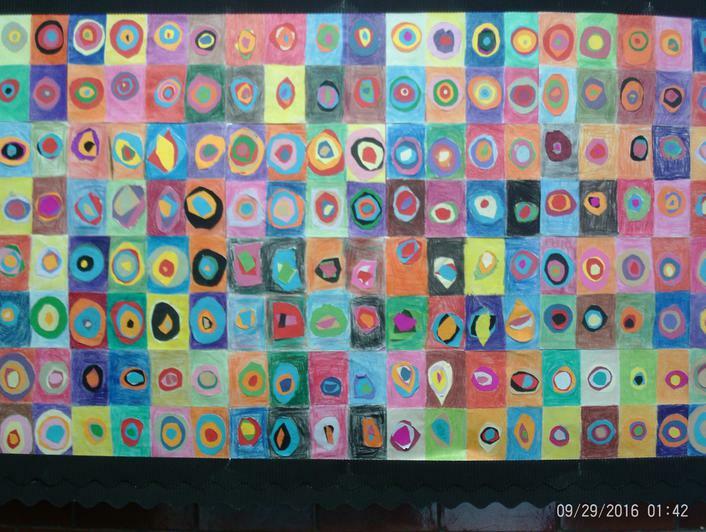 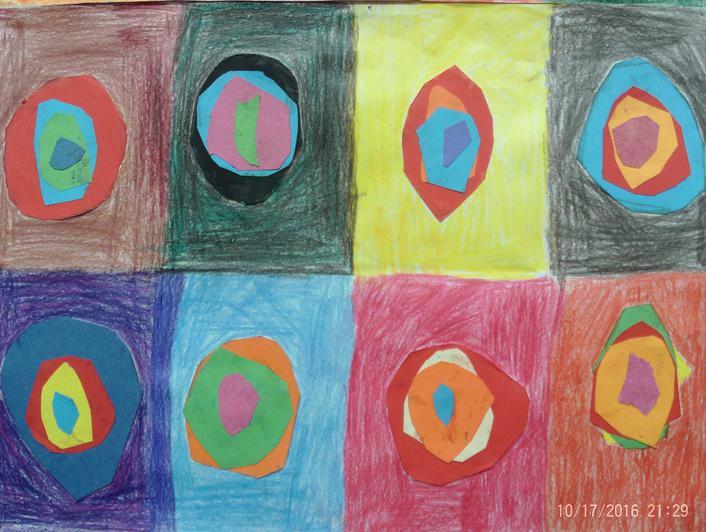 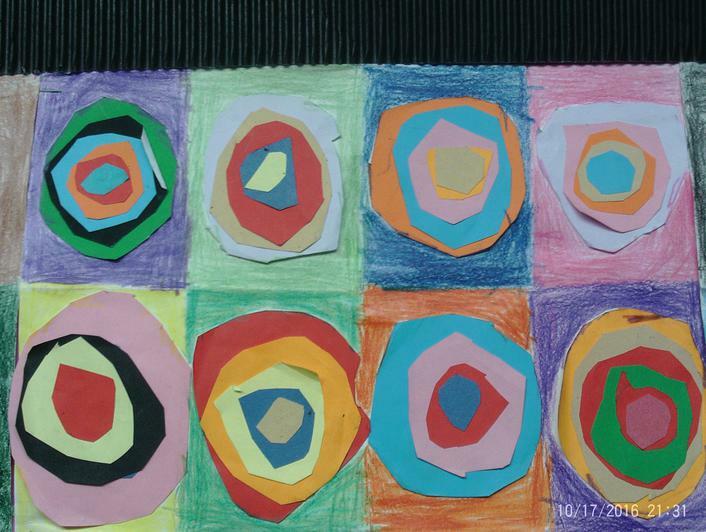 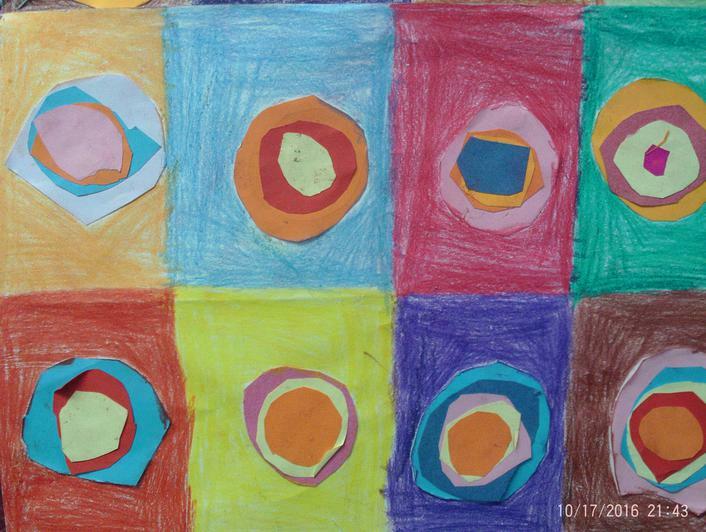 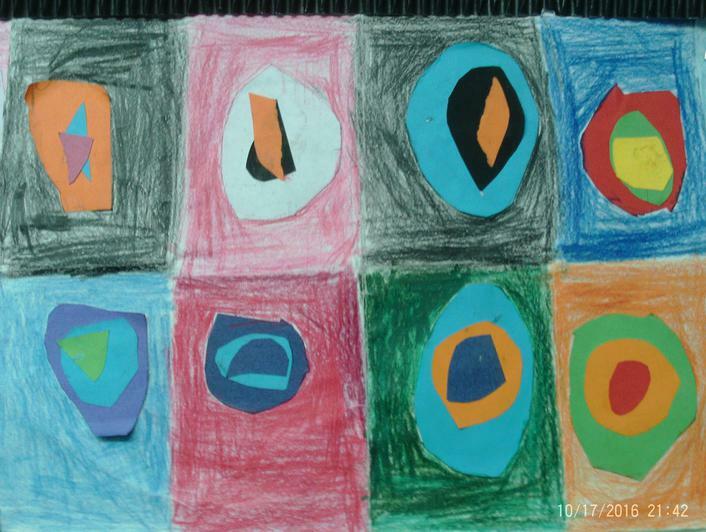 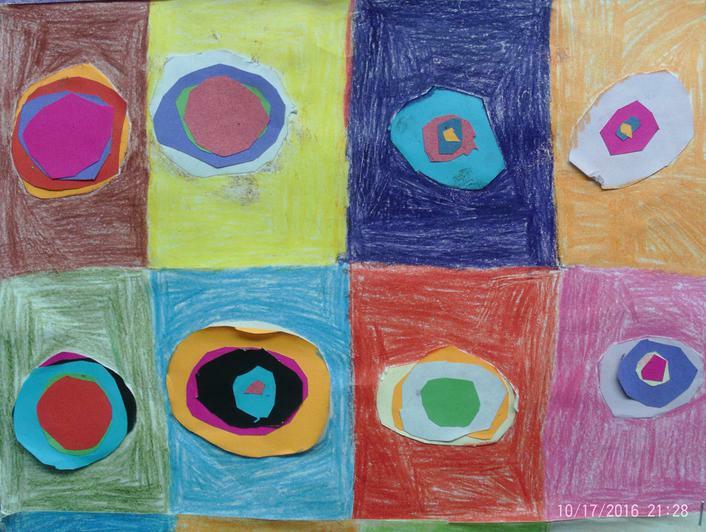 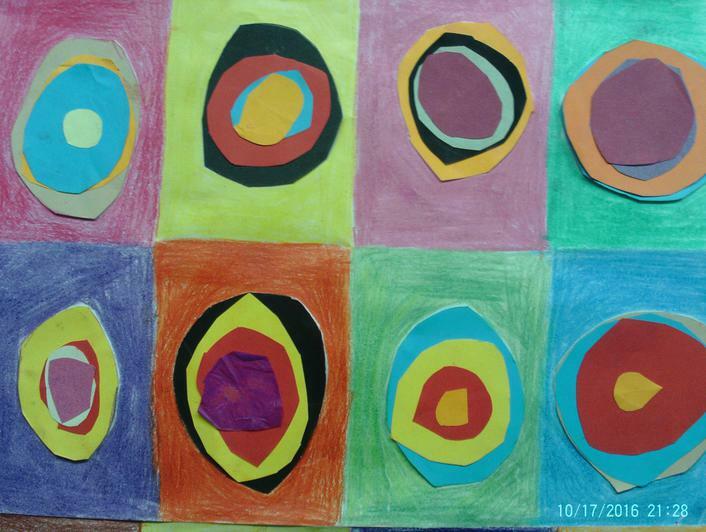 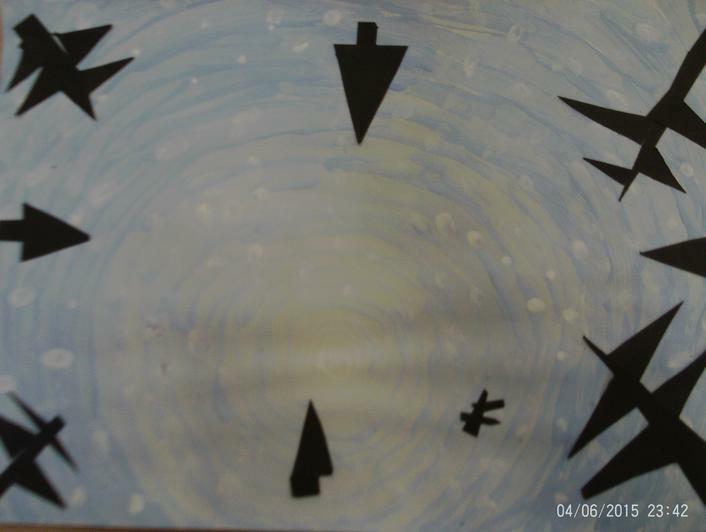 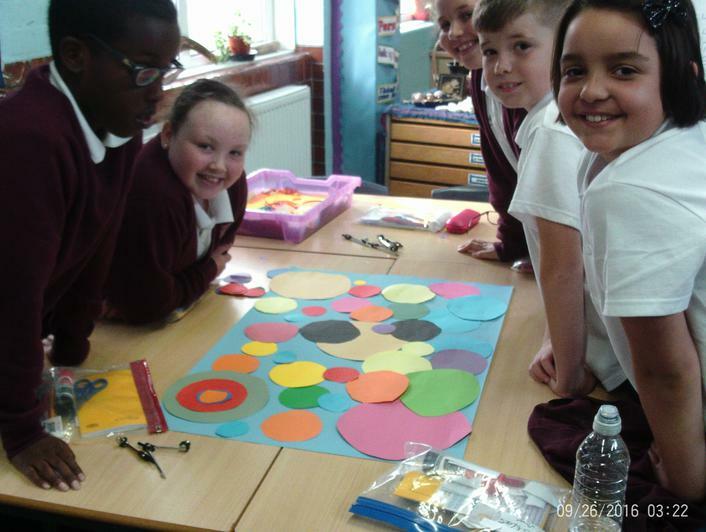 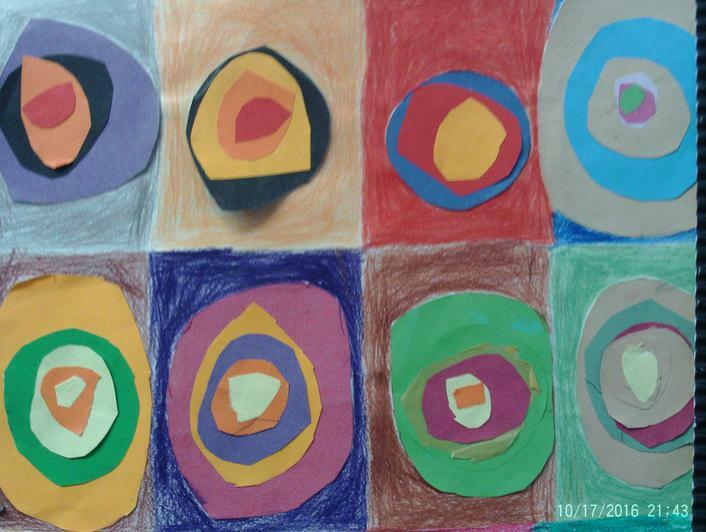 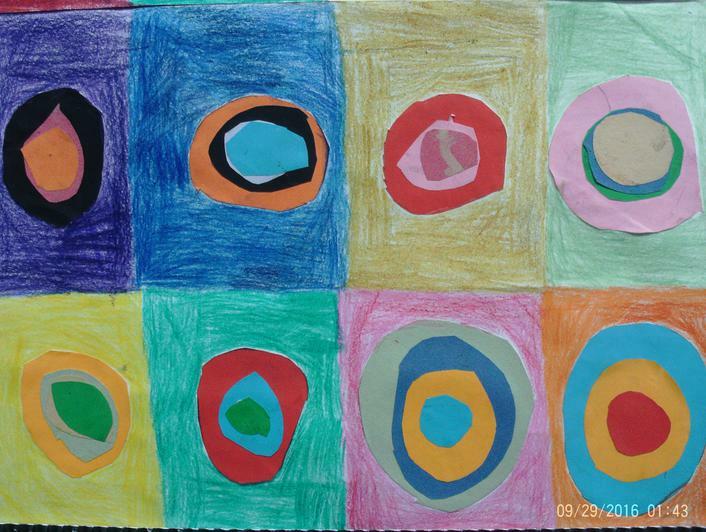 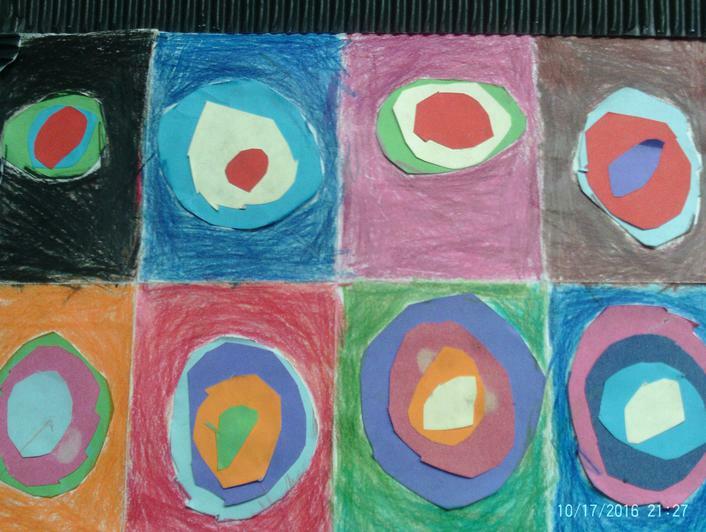 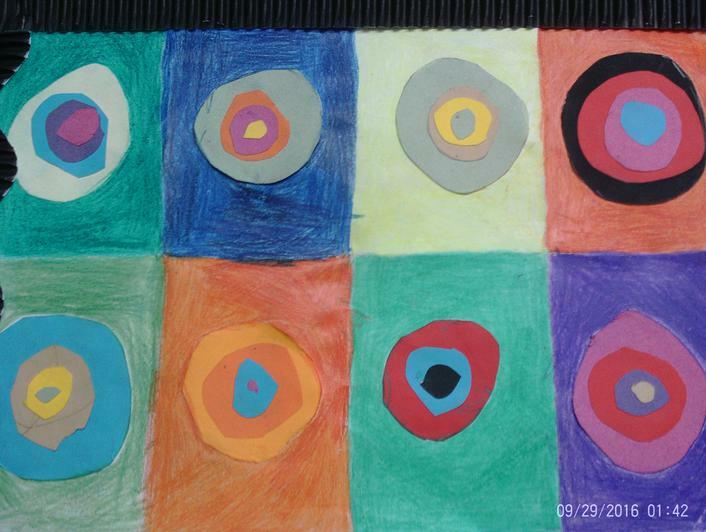 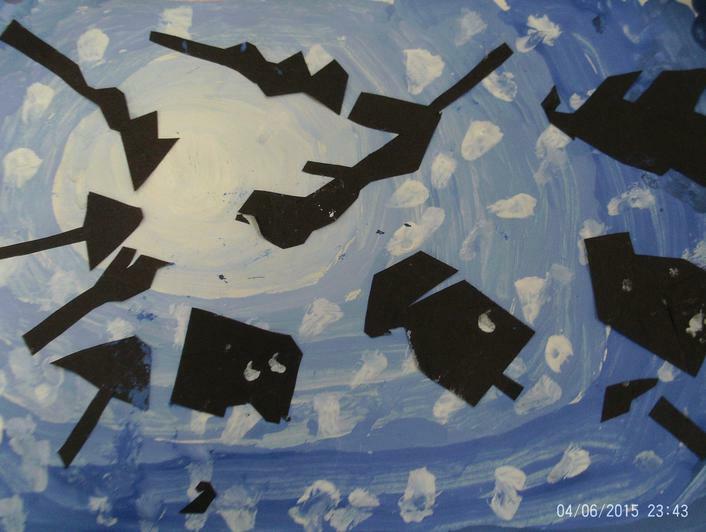 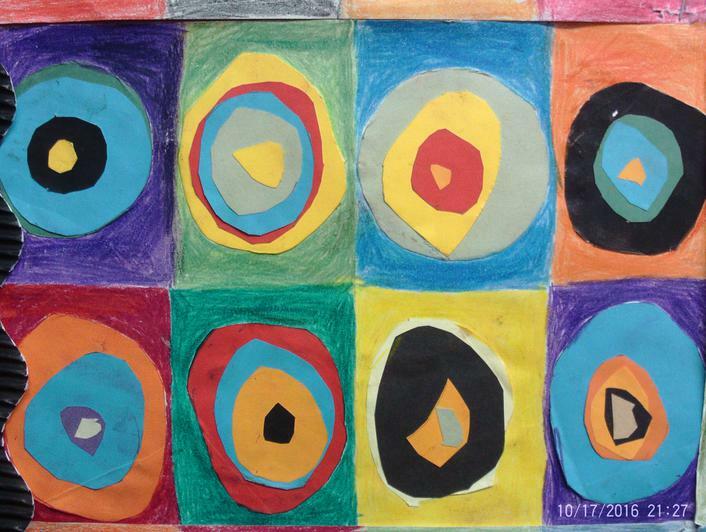 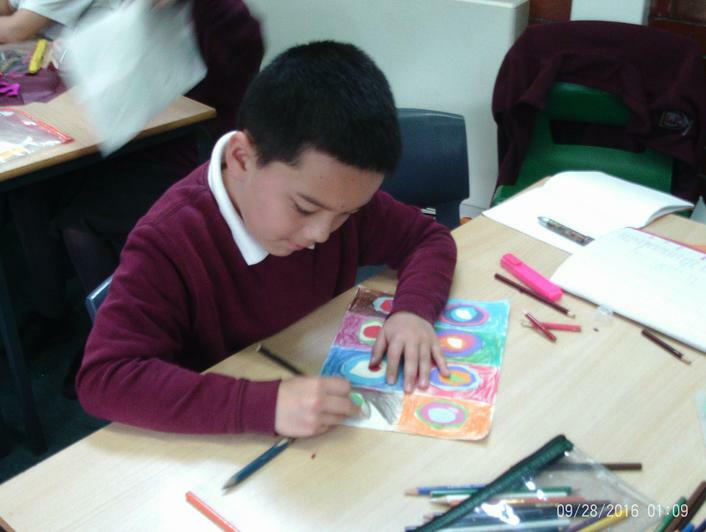 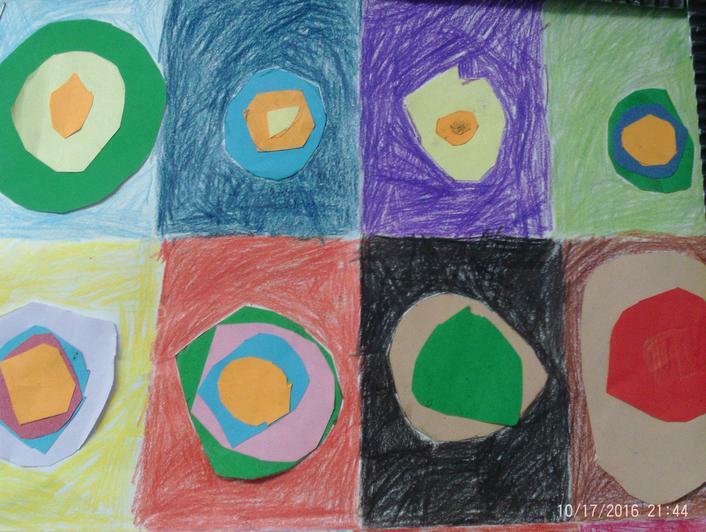 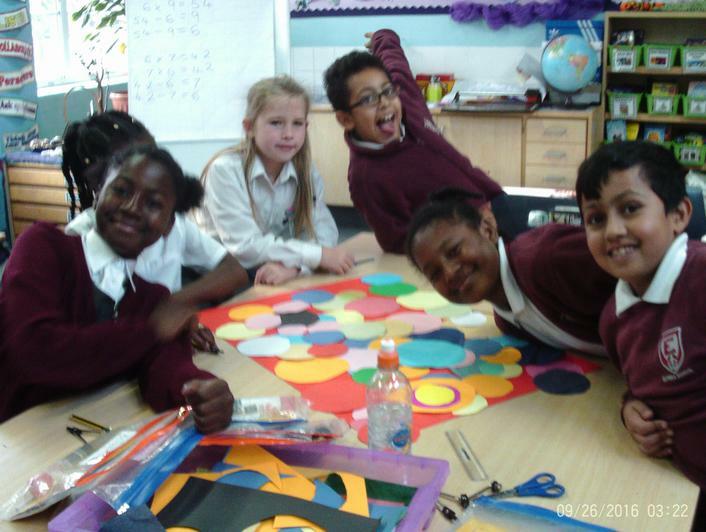 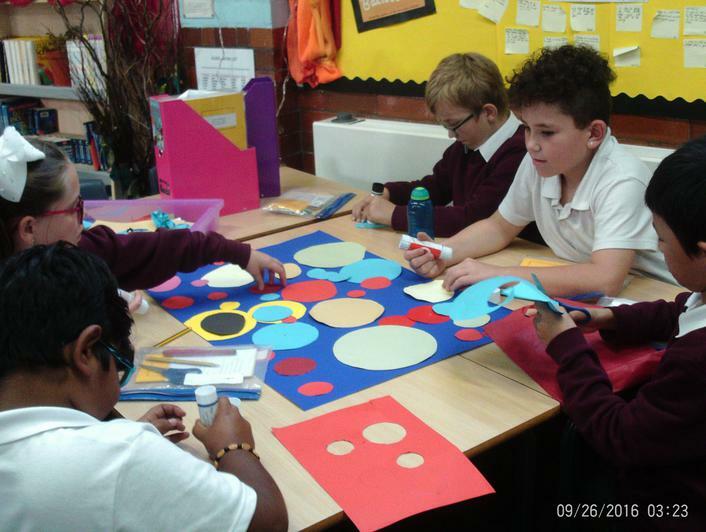 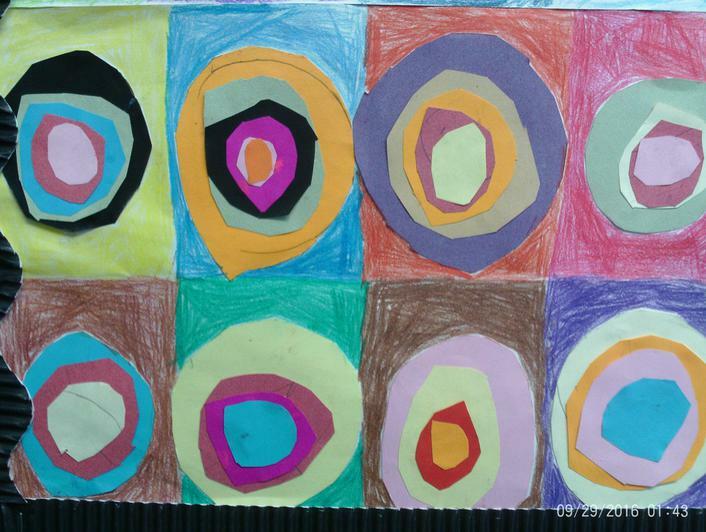 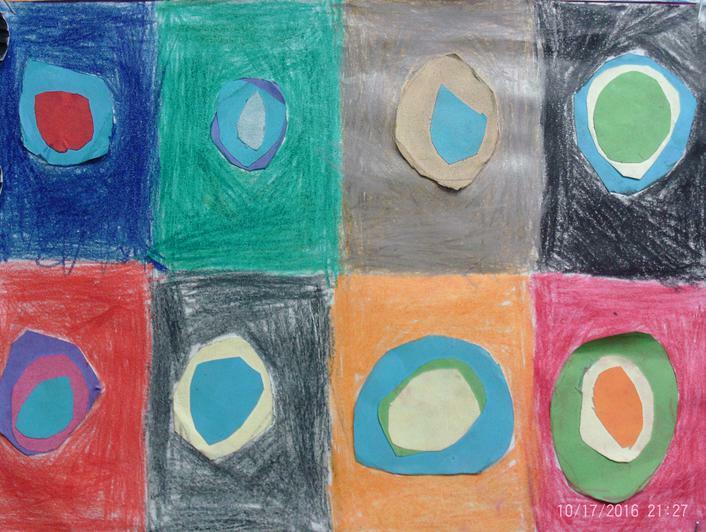 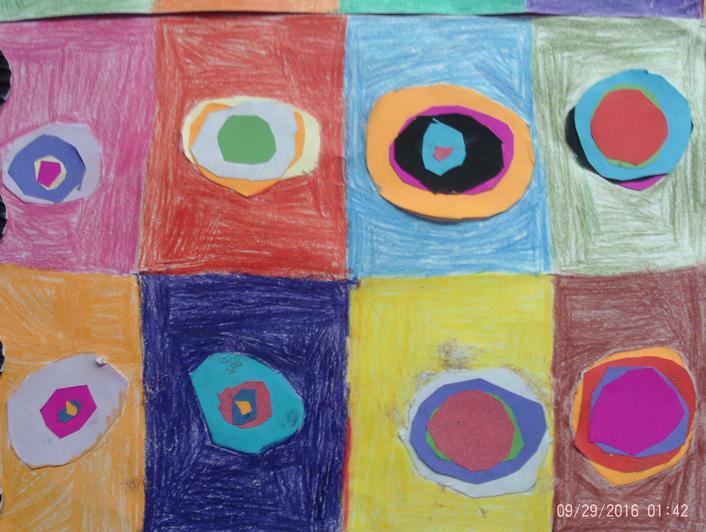 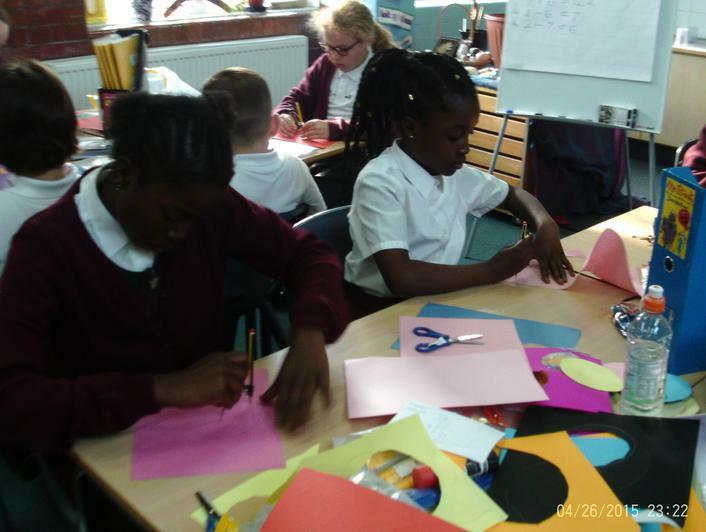 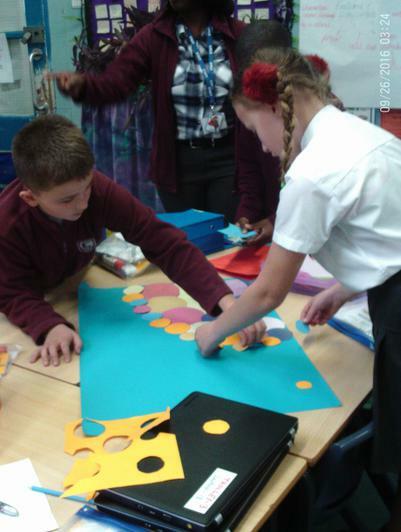 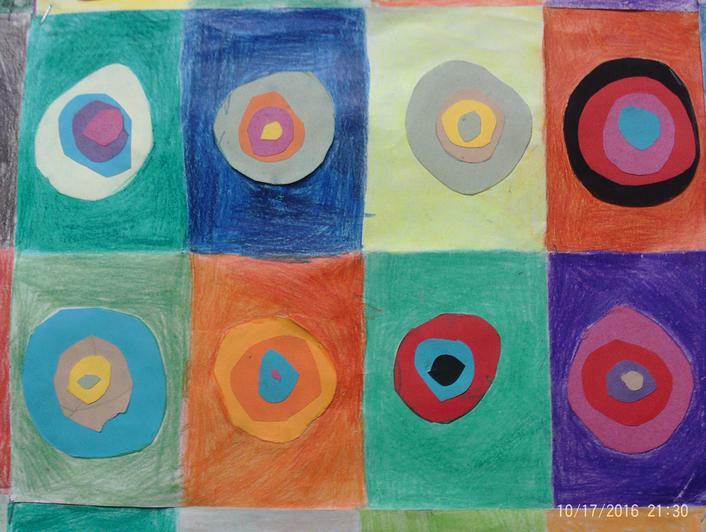 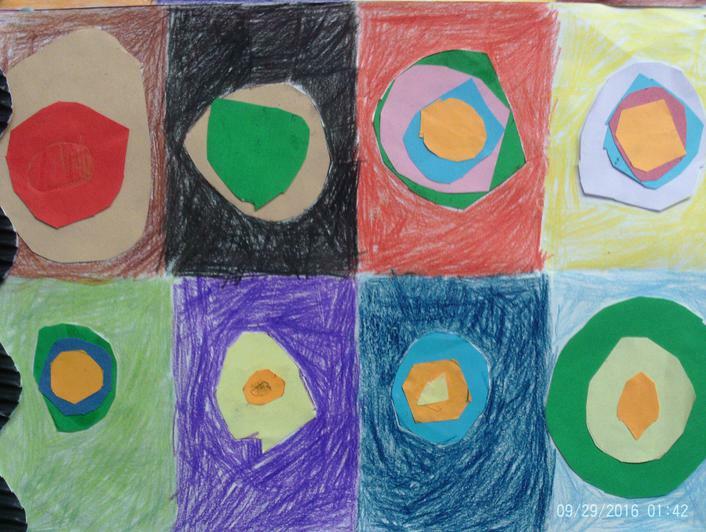 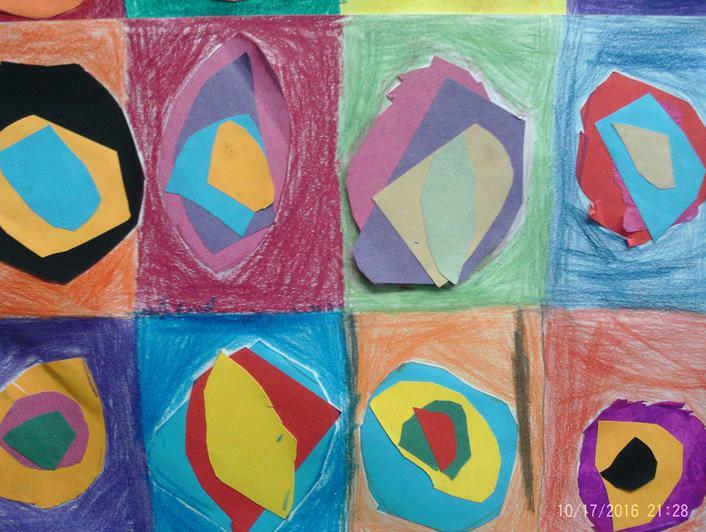 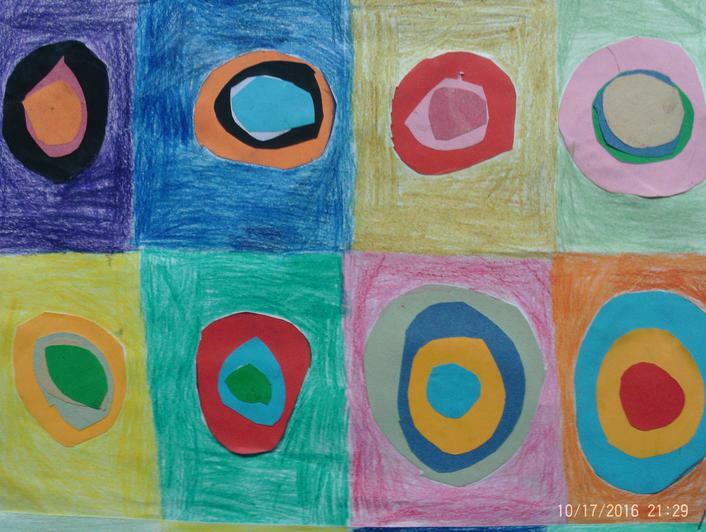 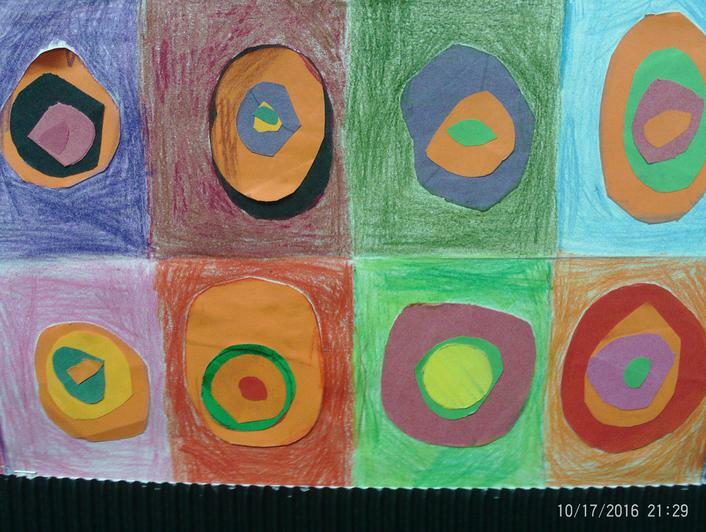 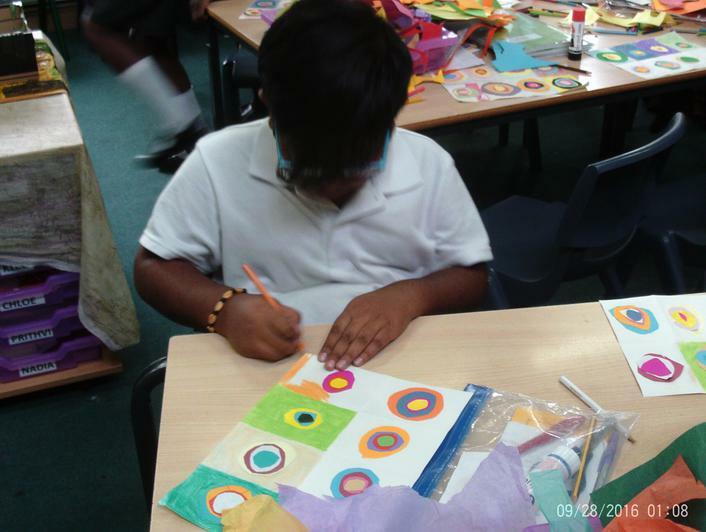 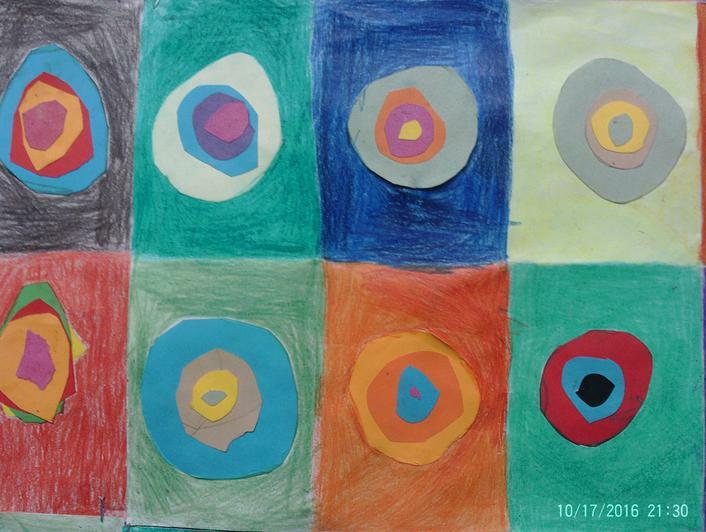 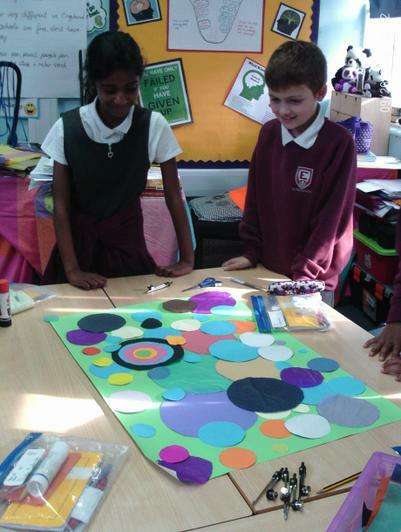 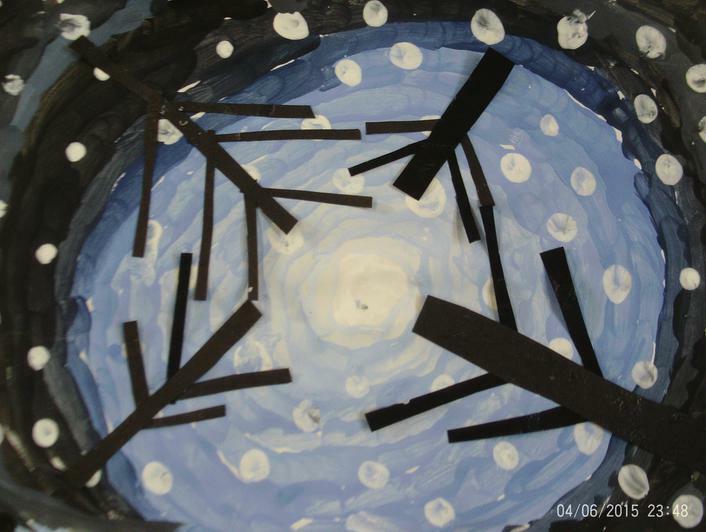 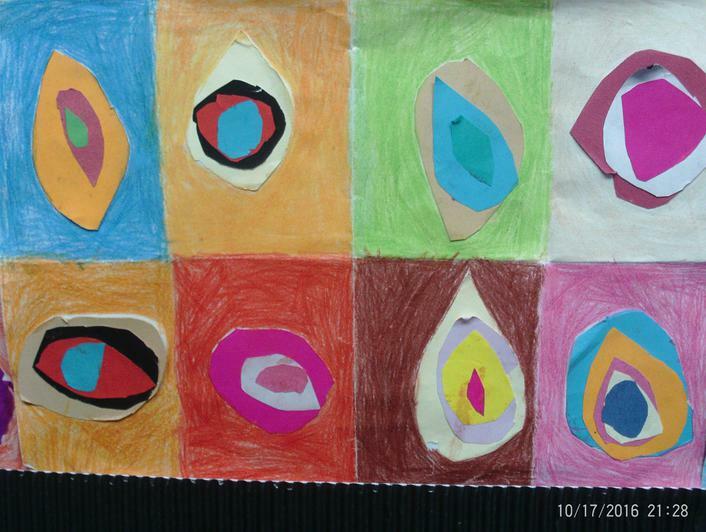 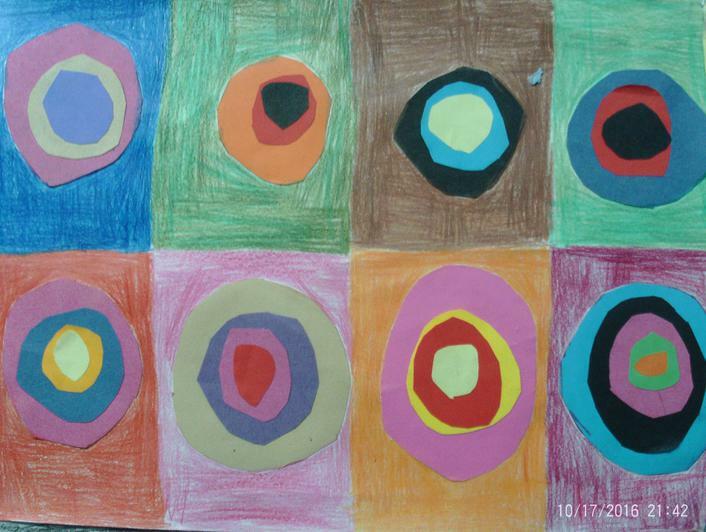 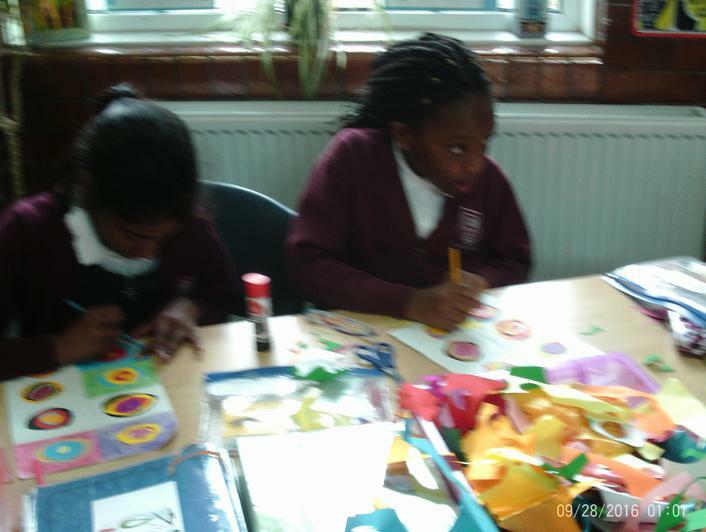 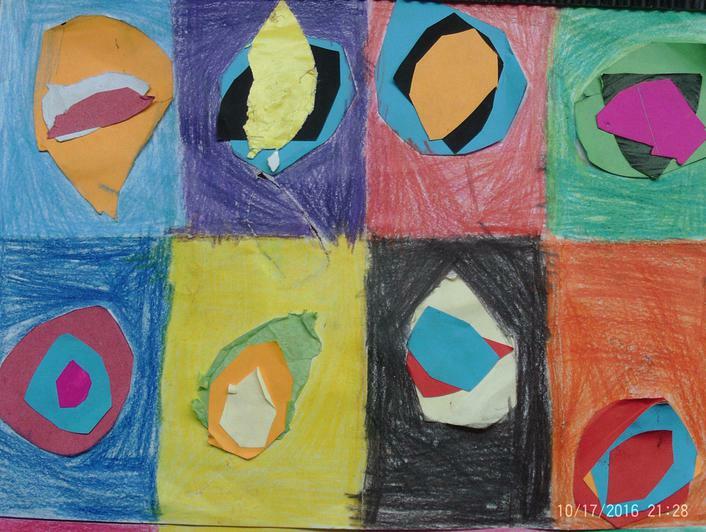 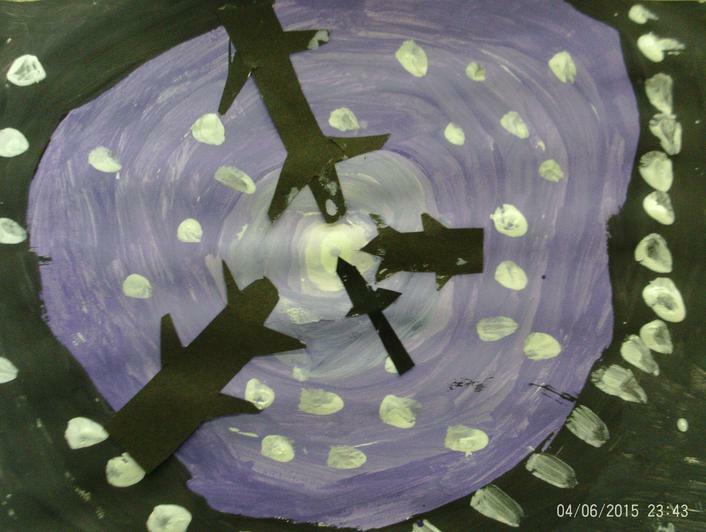 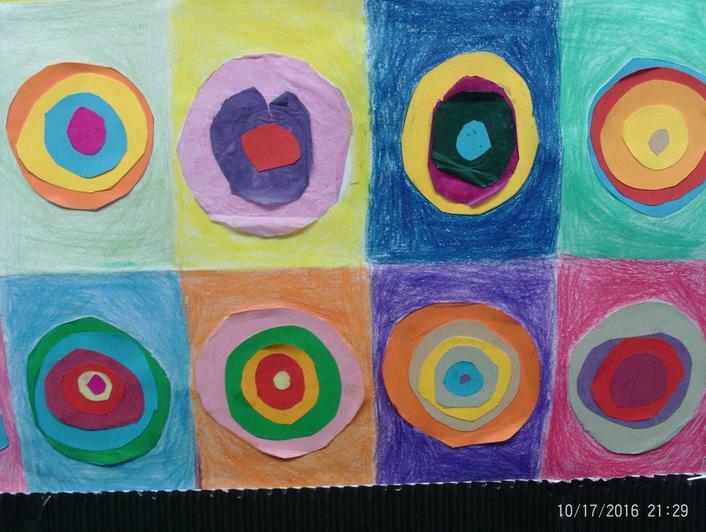 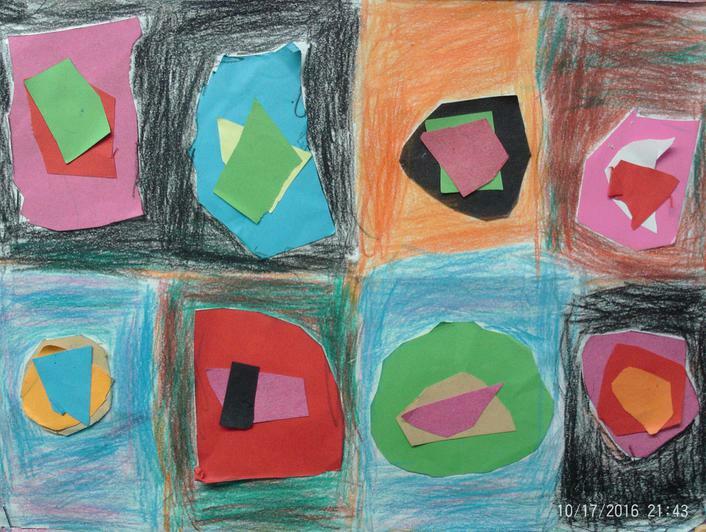 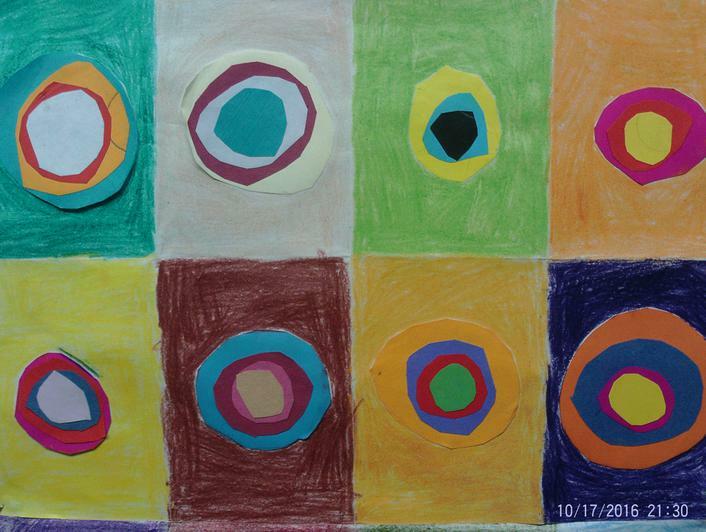 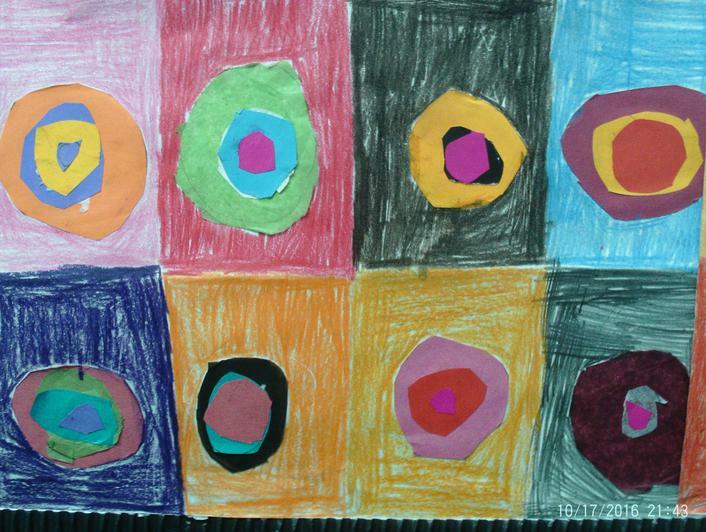 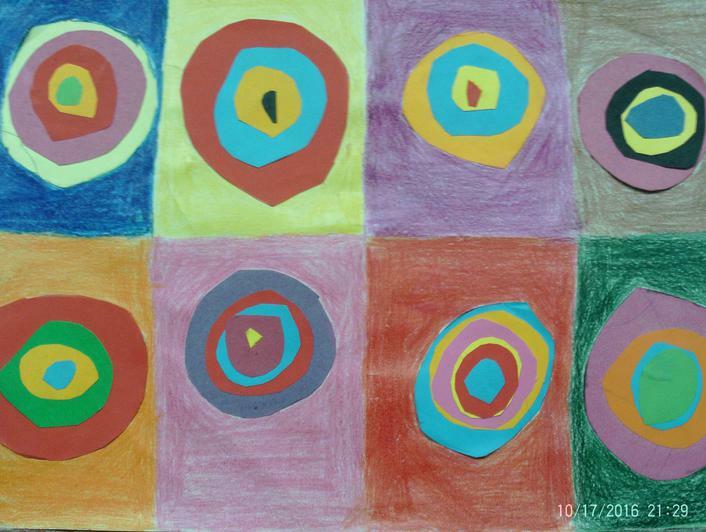 This has lead them to looking at the work of Wassily Kadinsky and creating their own interpretations of circle art. 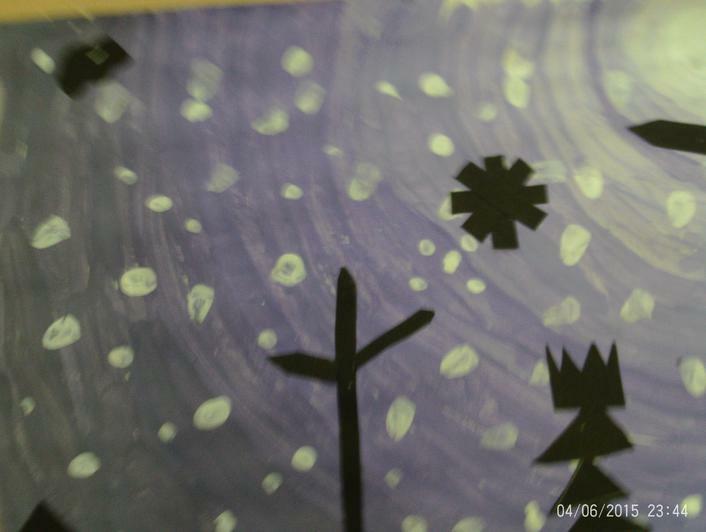 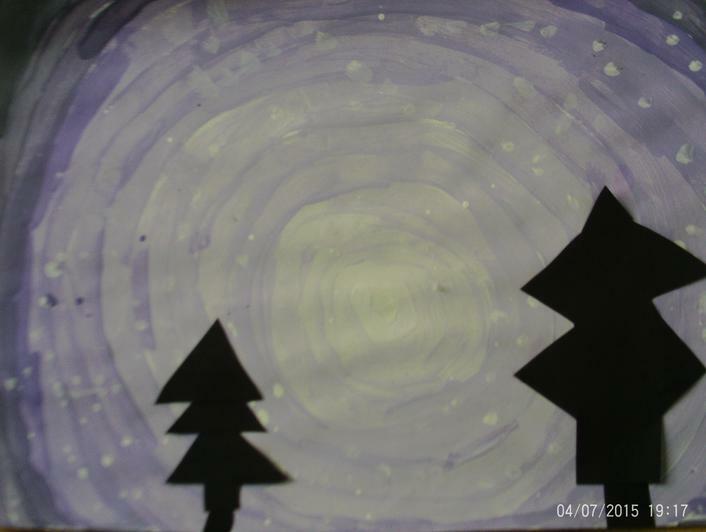 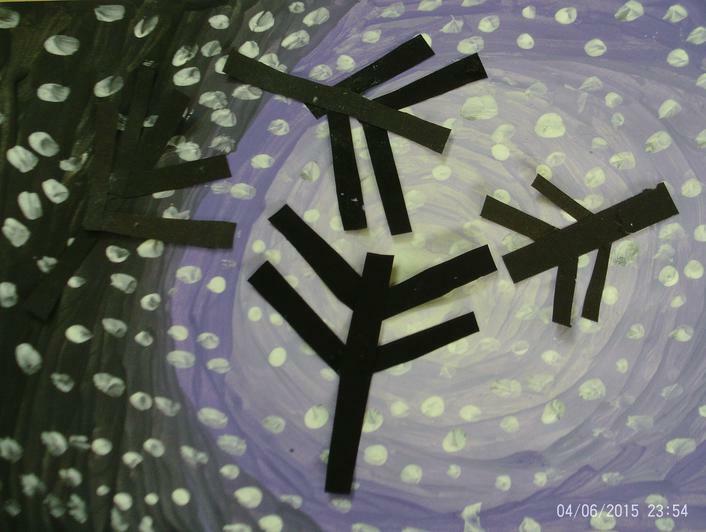 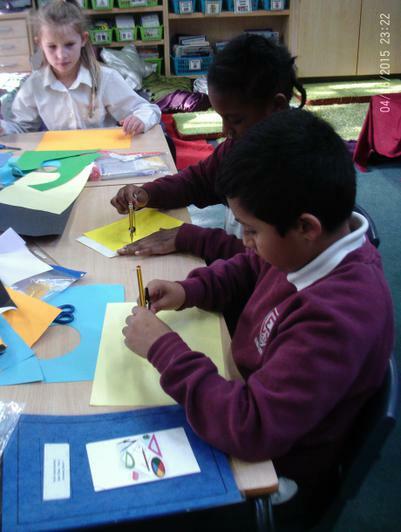 We used our knowledge of making tints and shades of a colour and put them to use when designing our Christmas cards. 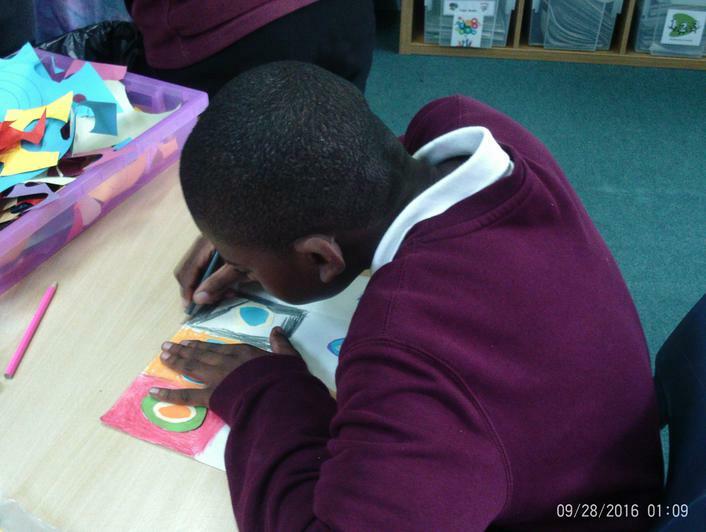 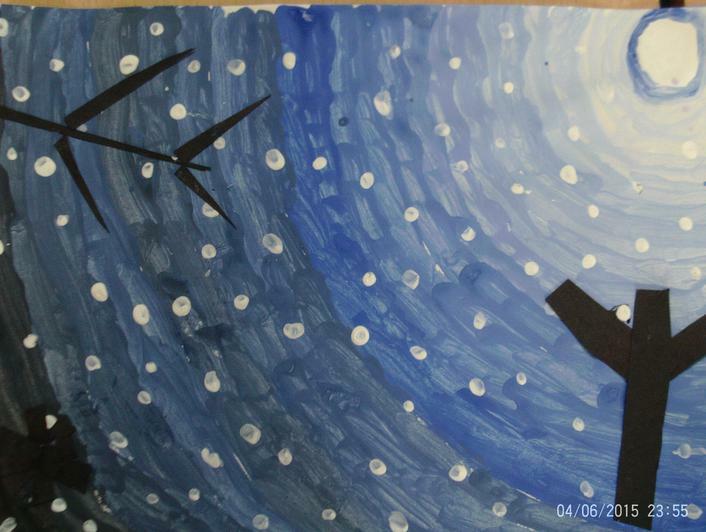 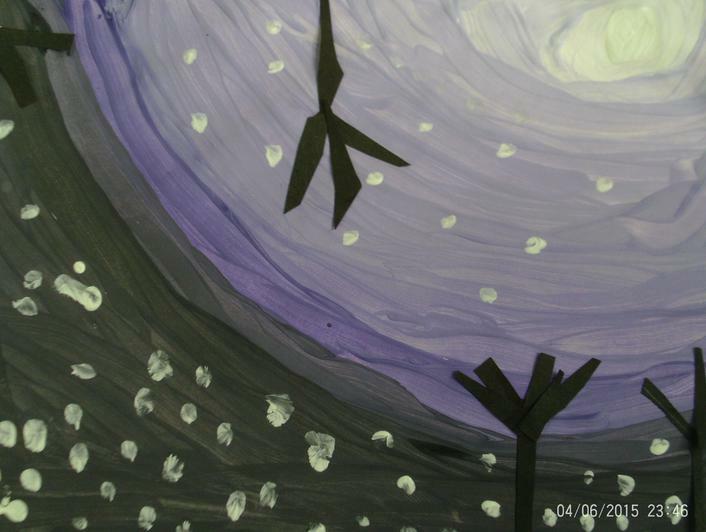 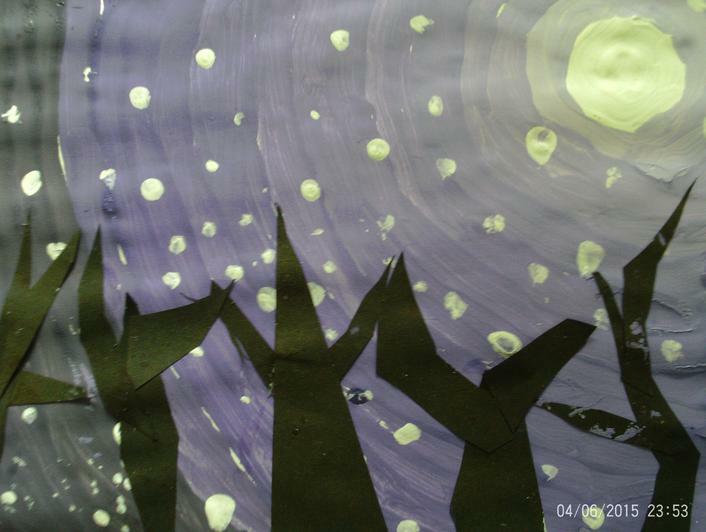 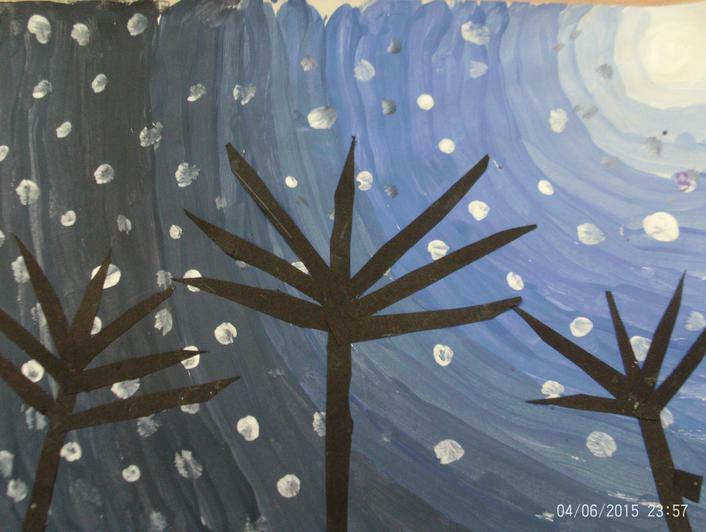 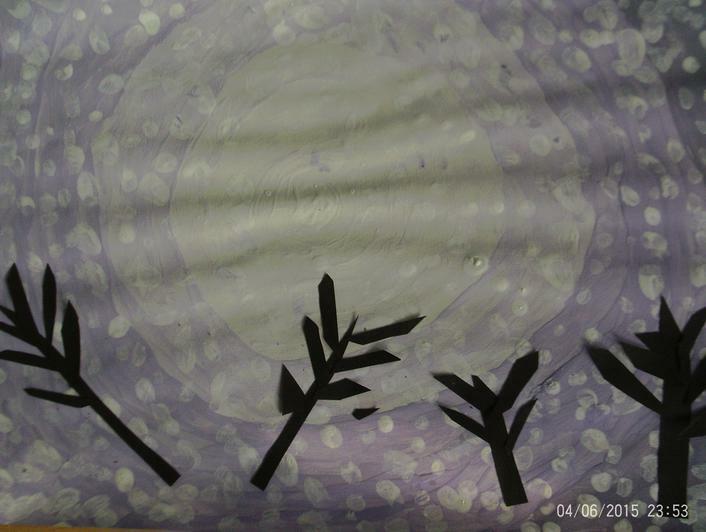 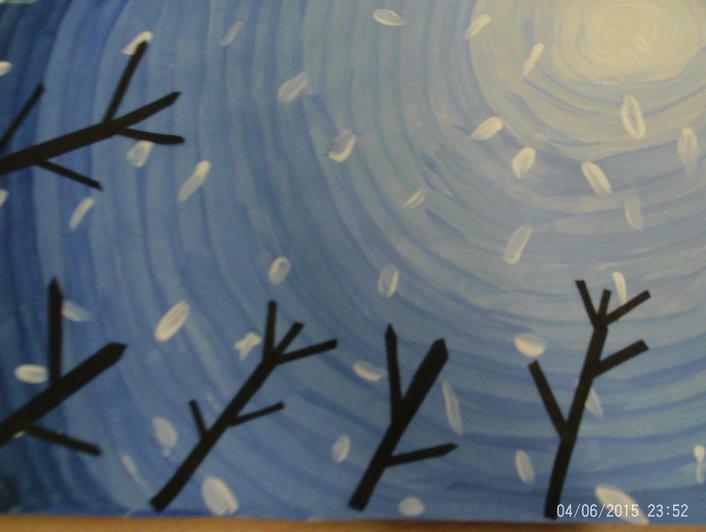 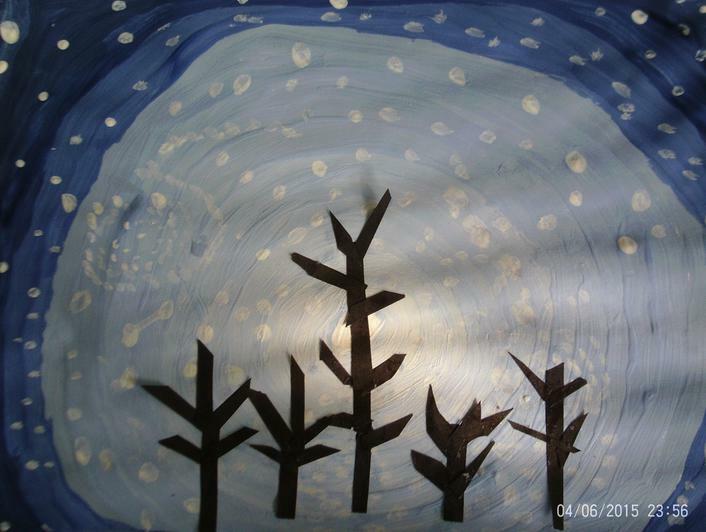 In art, we have been learning about tints and shades. 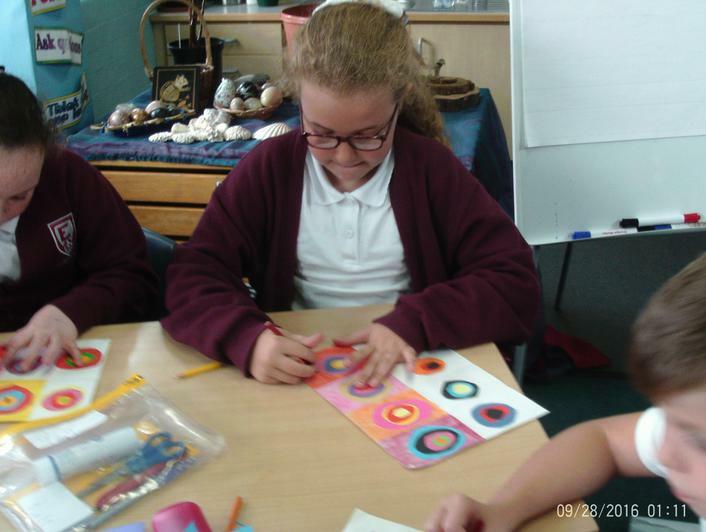 We had to make a colour wheel starting with white, and then adding small amounts of a pure colour to create tints until we reached the pure colour. 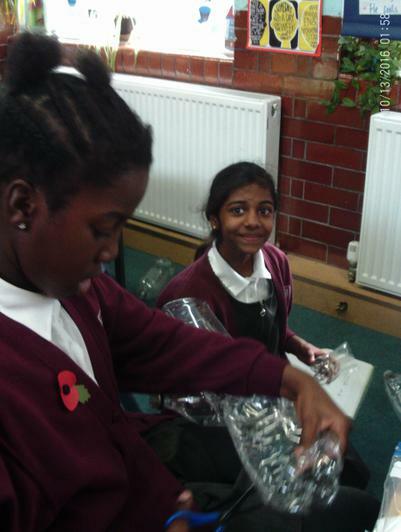 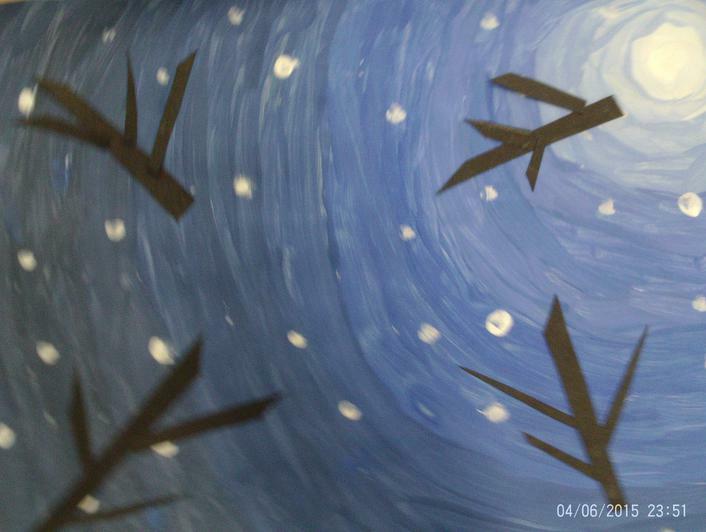 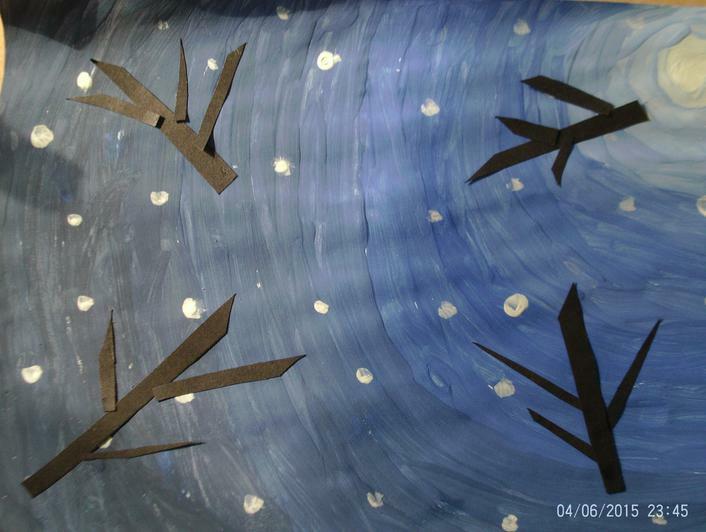 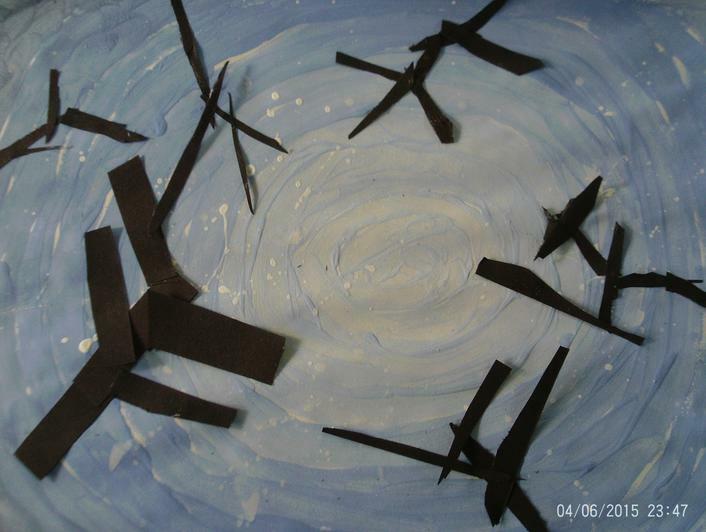 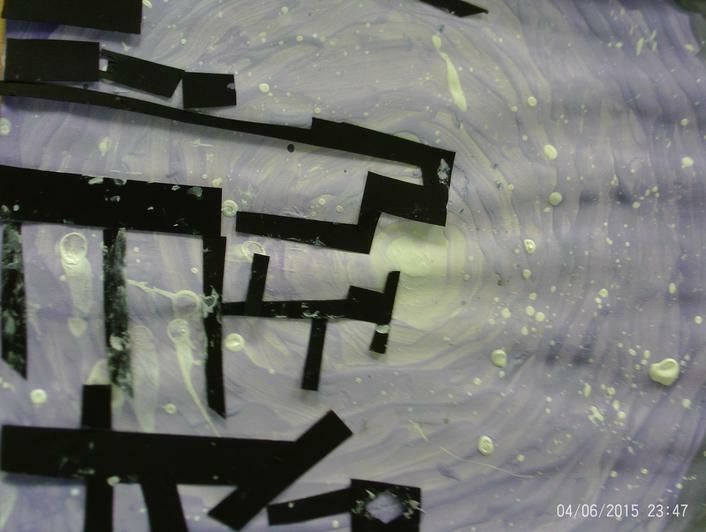 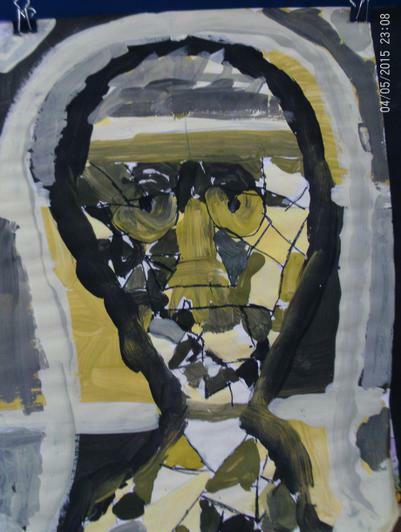 Afterwards, we started with the pure colour and adding small amounts of black to make shades until we reached black. 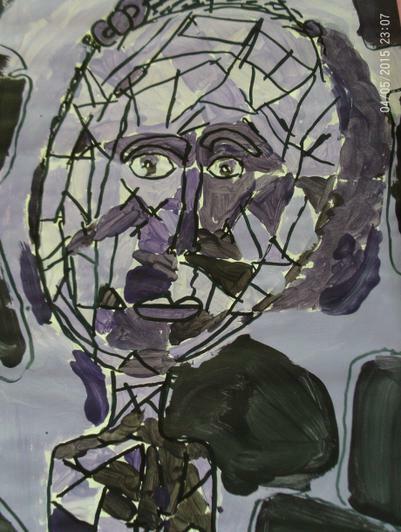 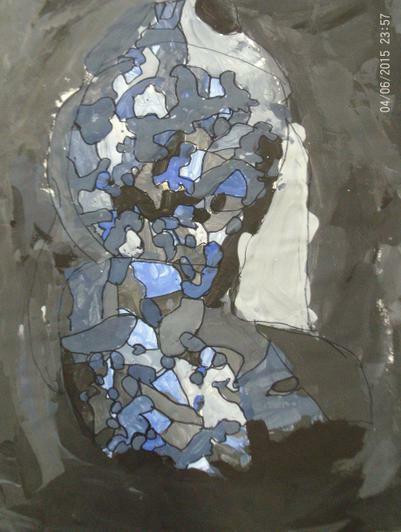 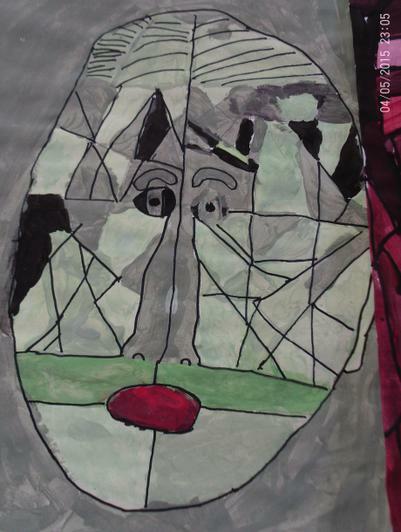 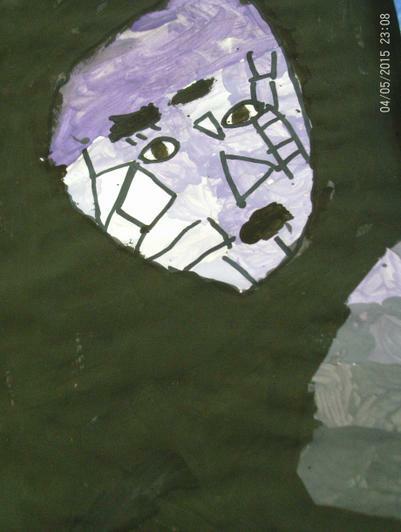 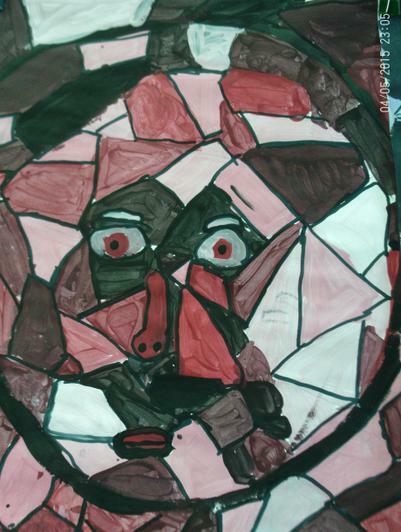 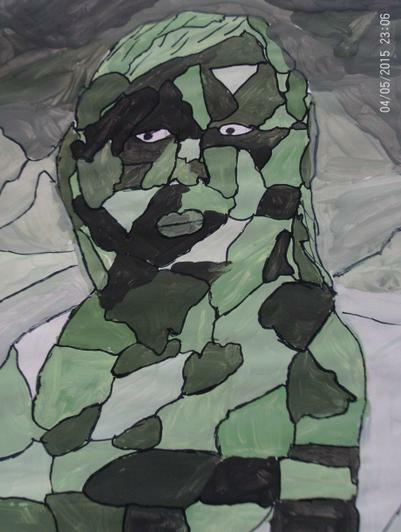 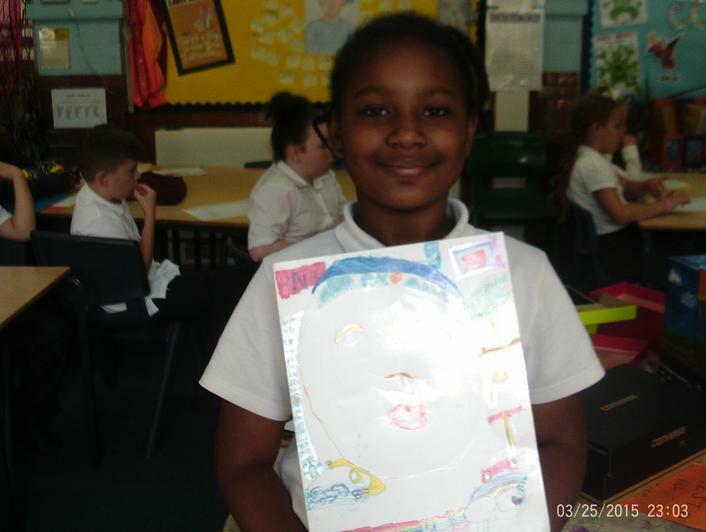 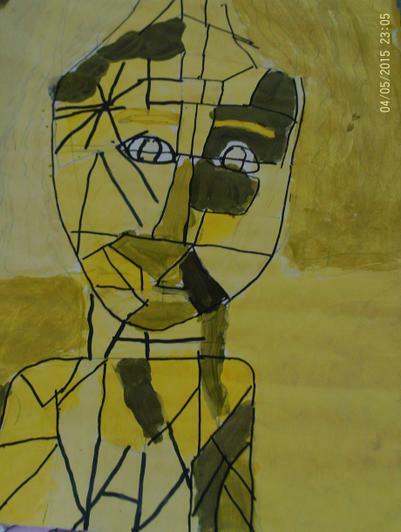 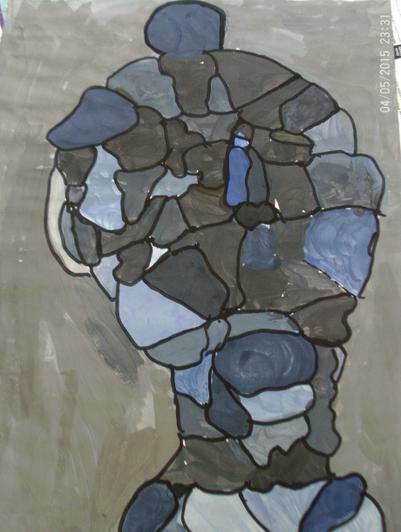 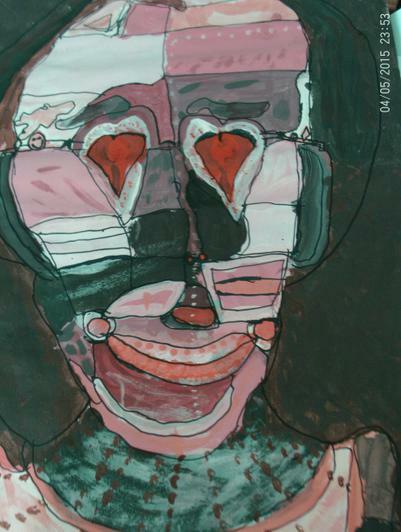 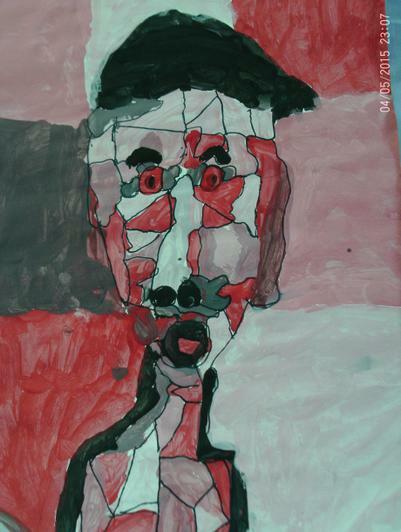 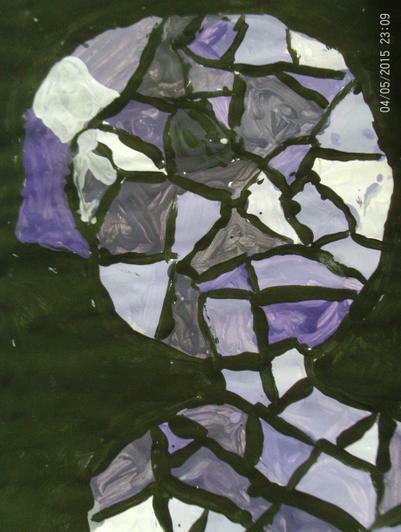 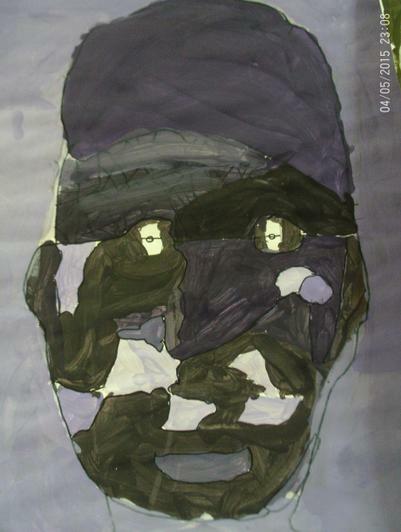 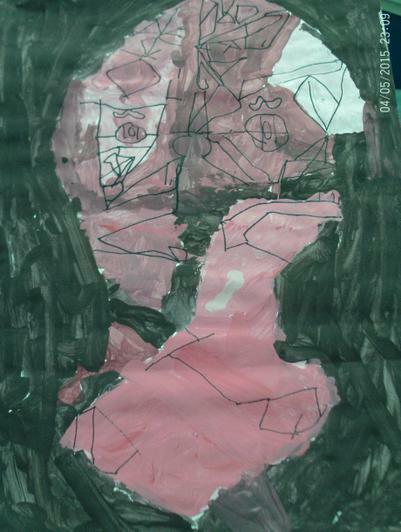 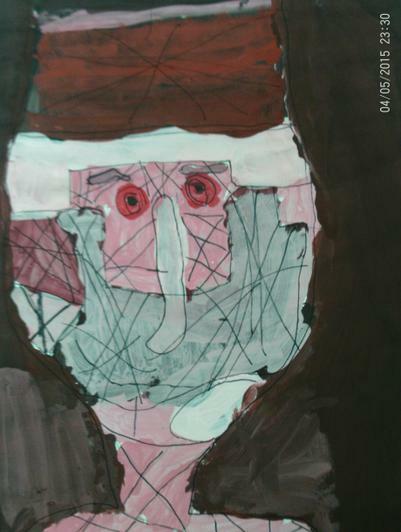 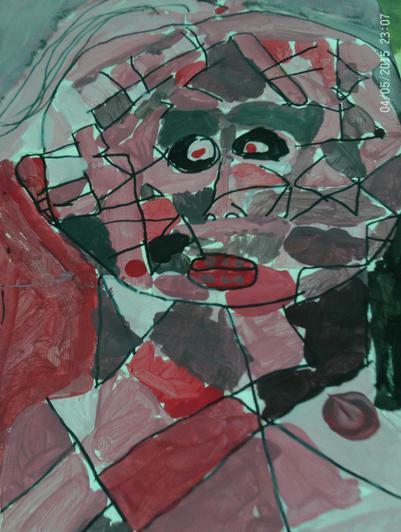 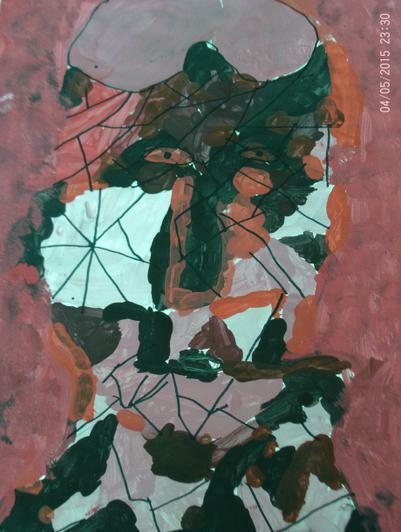 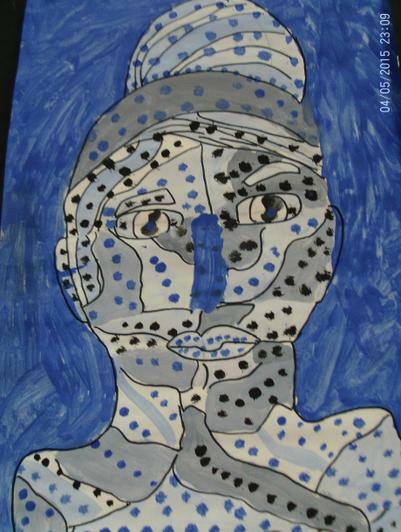 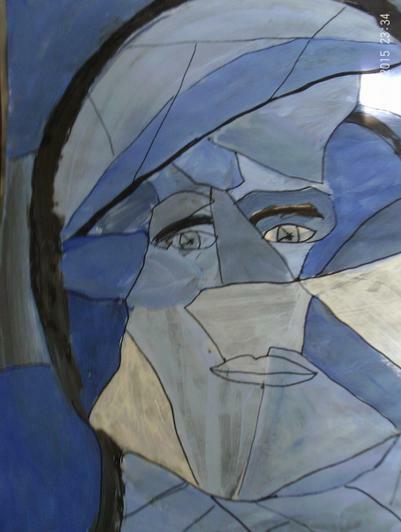 As our topic is, Our World, Happiness, we then drew self-portraits and used our tints and shades to paint them. 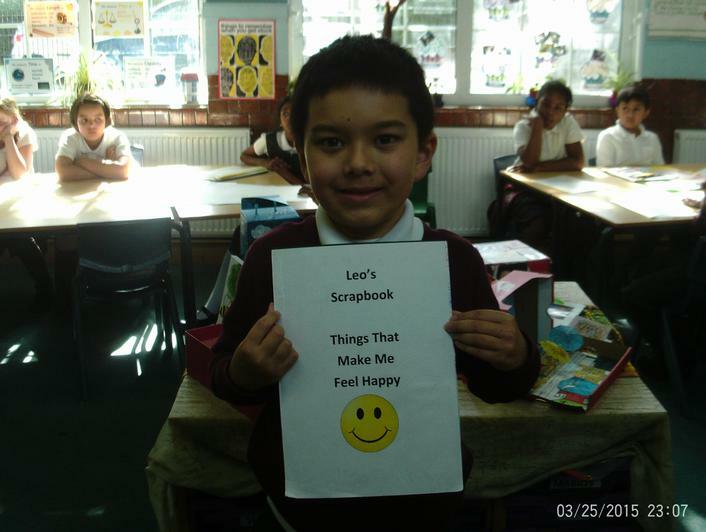 Our topic this term is 'Happiness, Our World.' 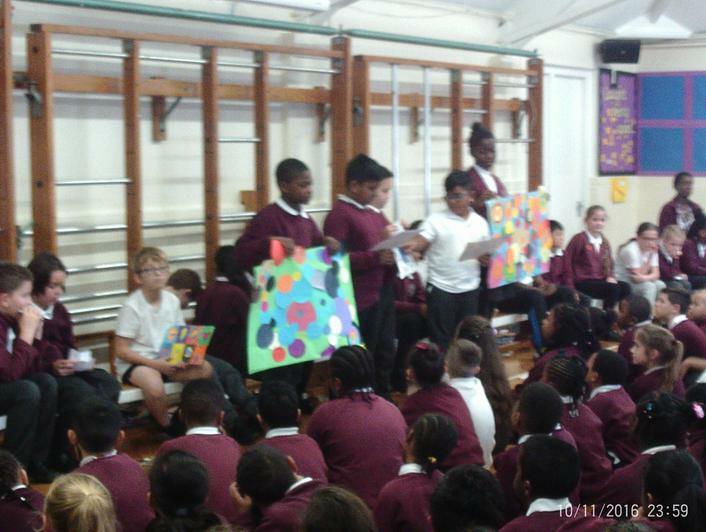 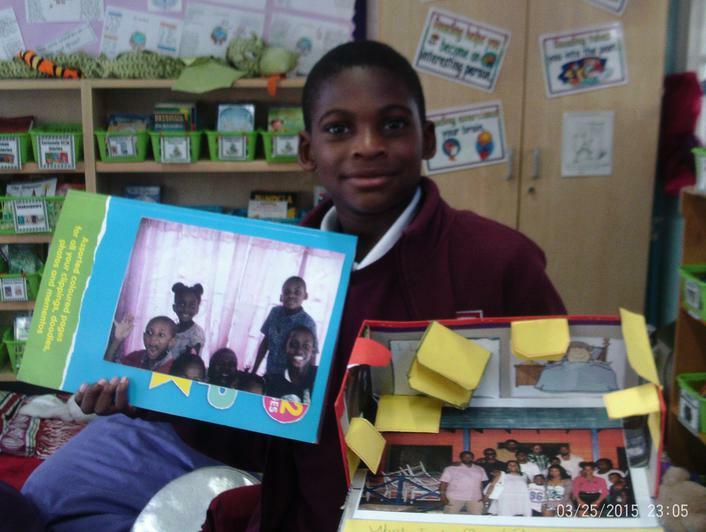 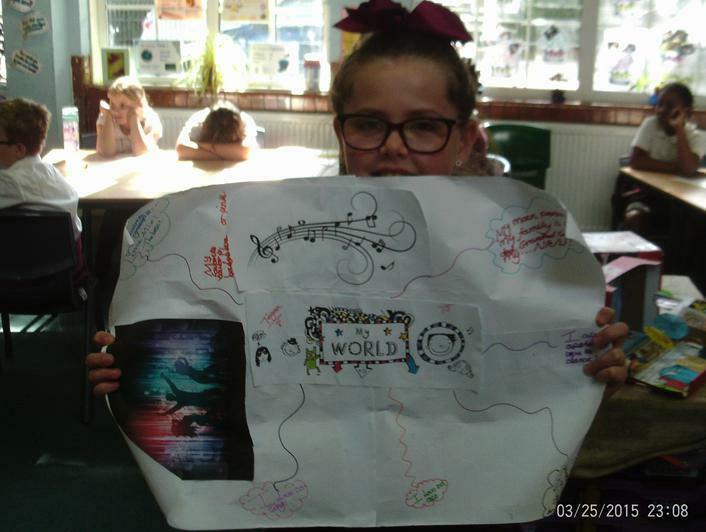 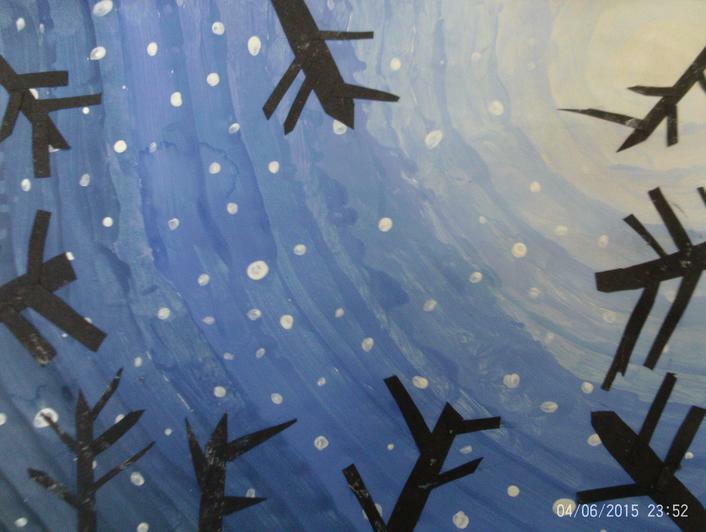 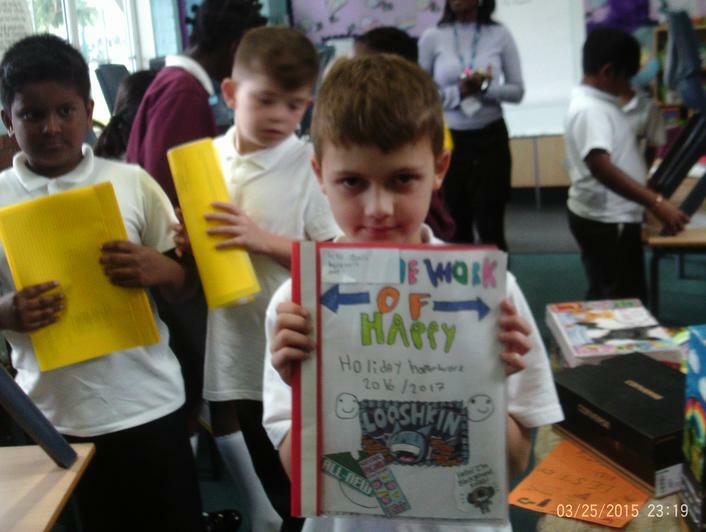 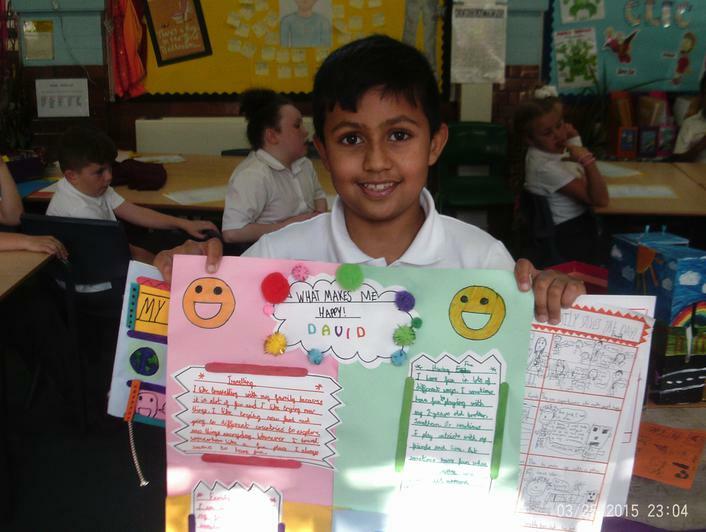 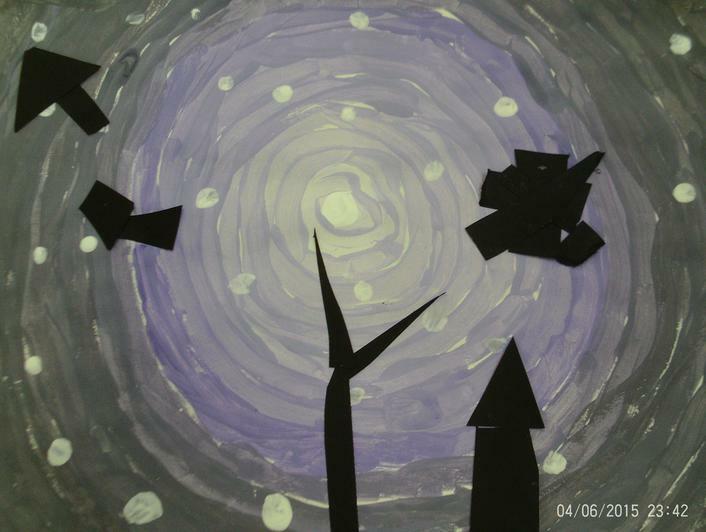 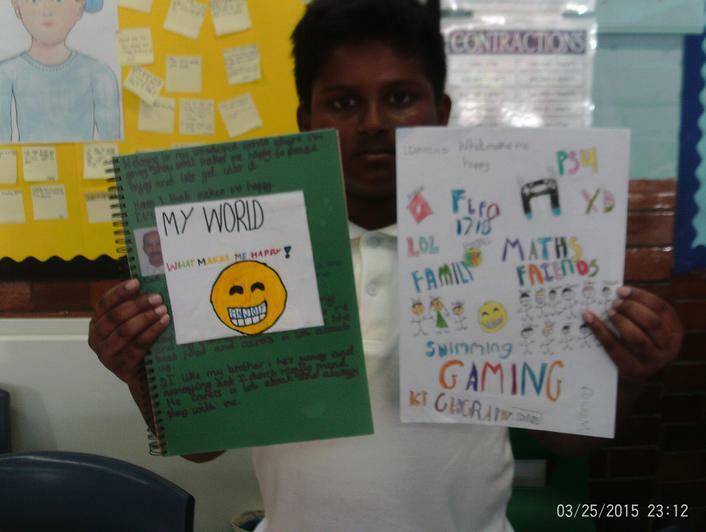 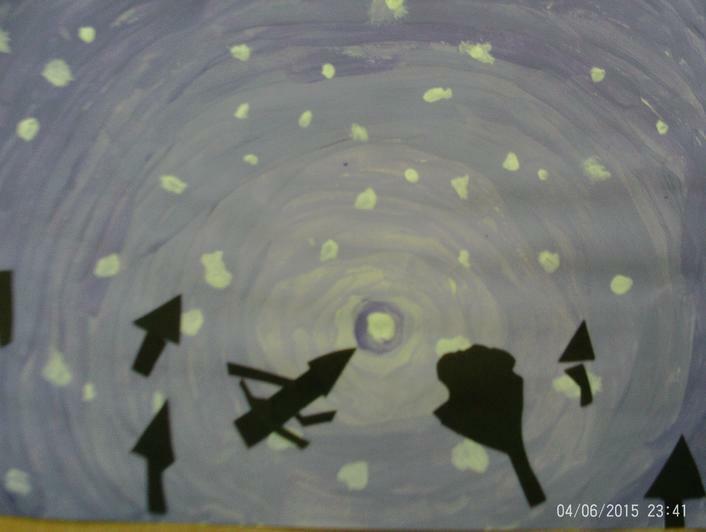 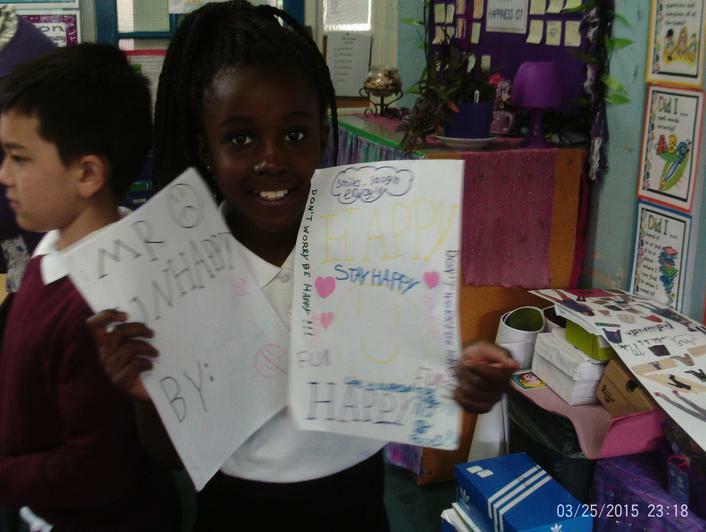 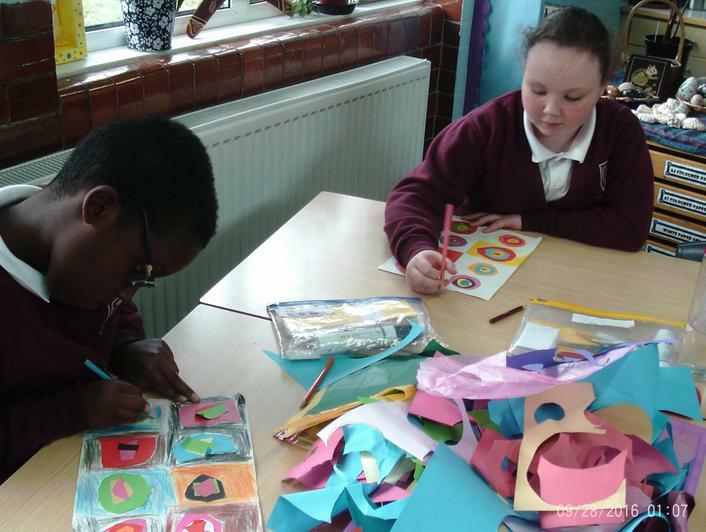 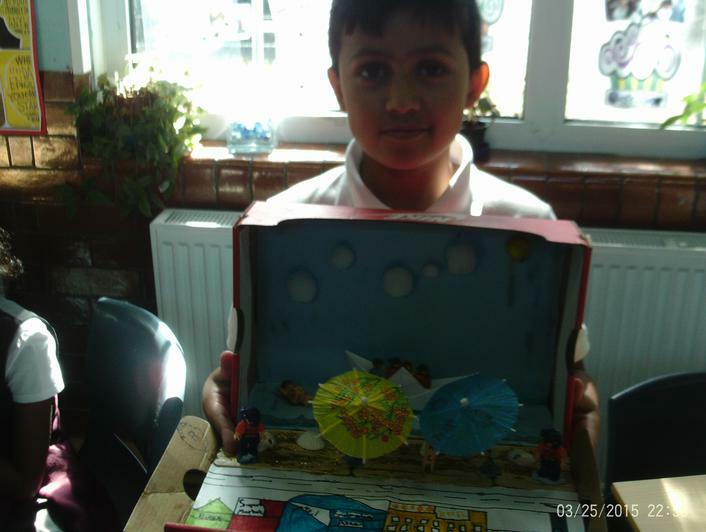 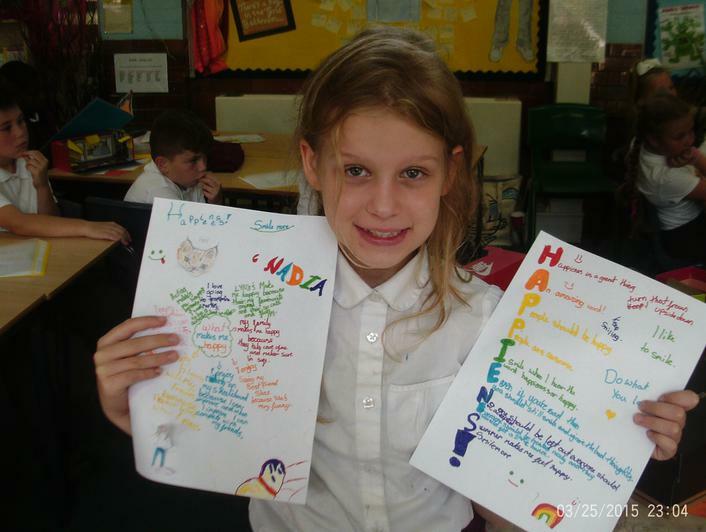 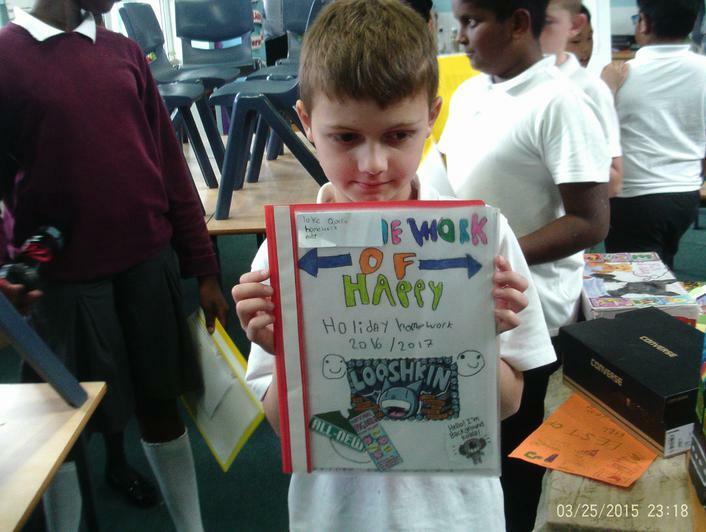 During the Summer holidays, the children were asked to create a project all about their world and what makes them happy. 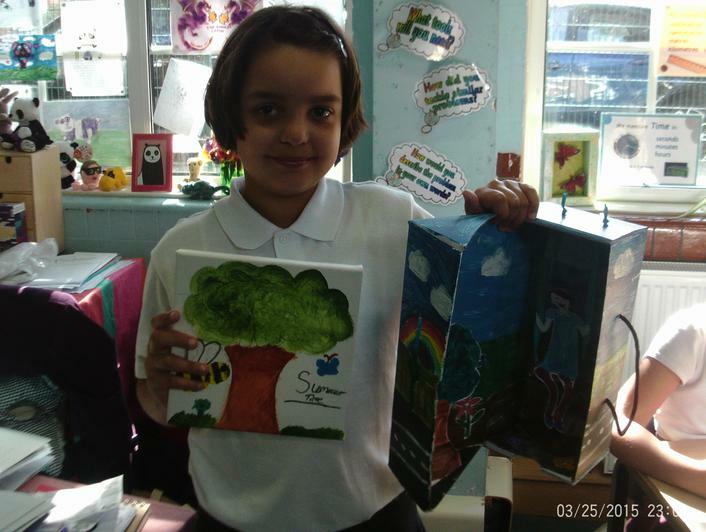 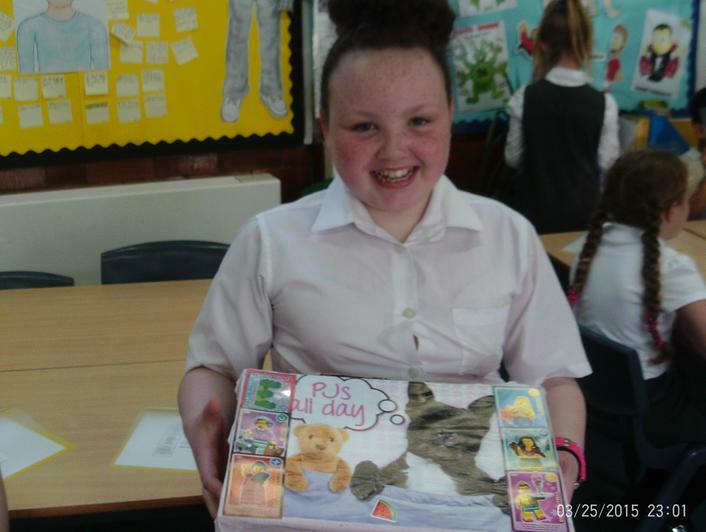 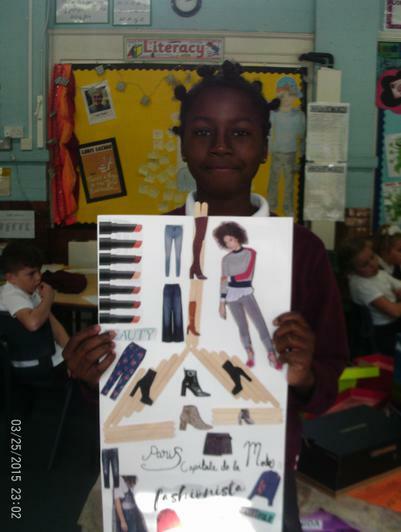 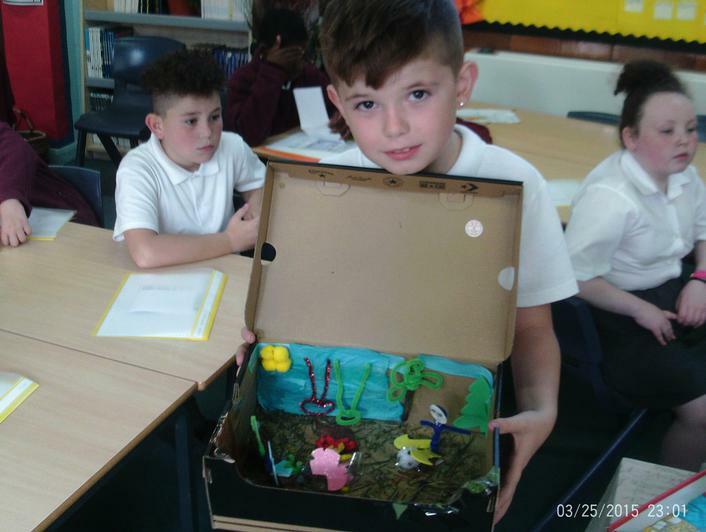 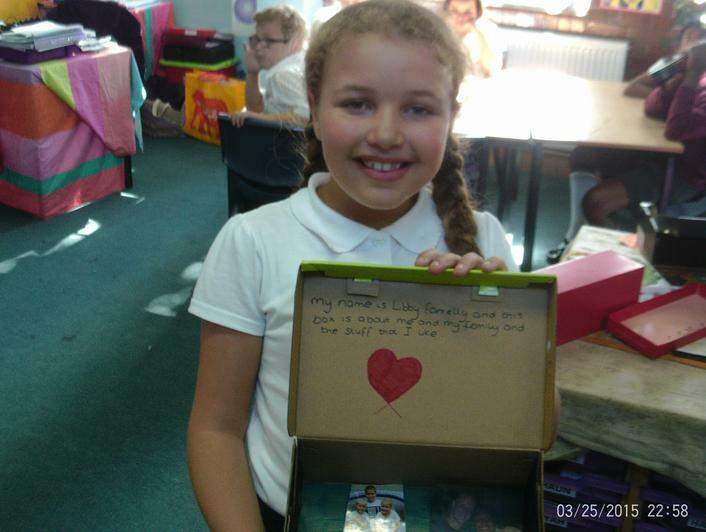 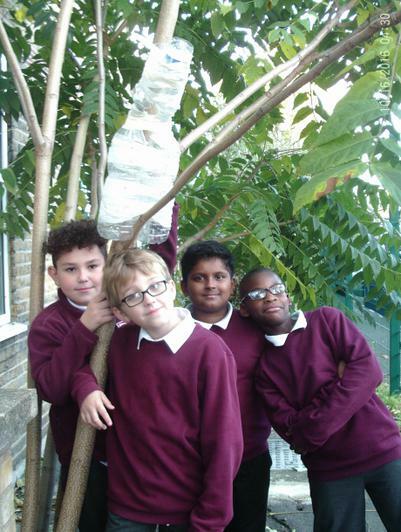 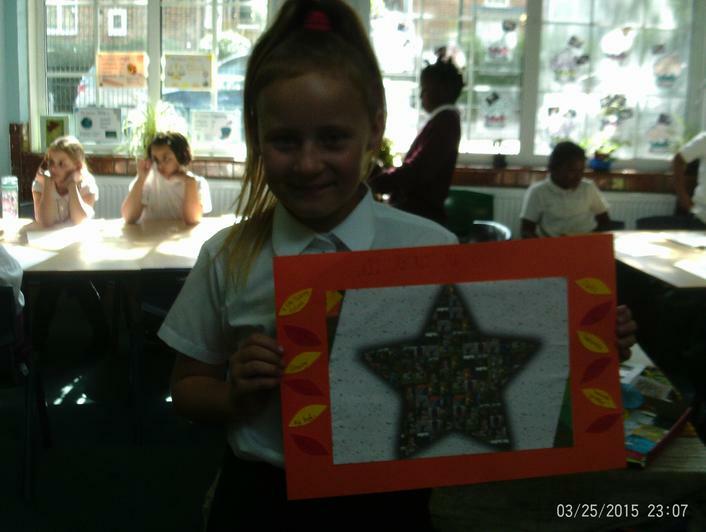 Alder class produced some excellent, creative and well thought out projects. 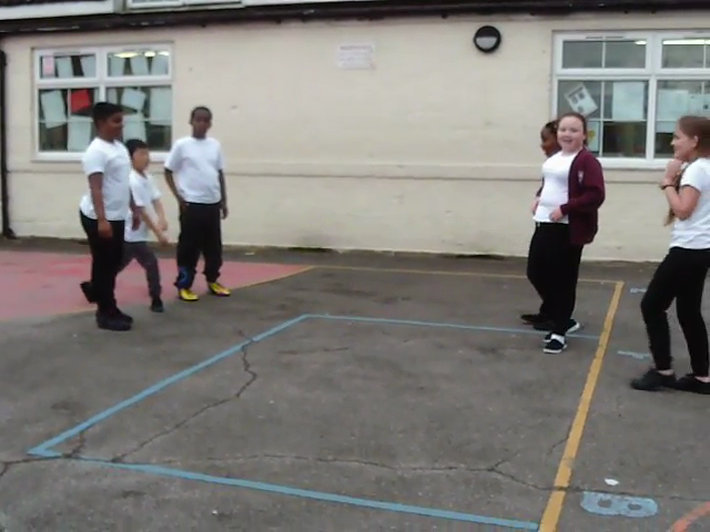 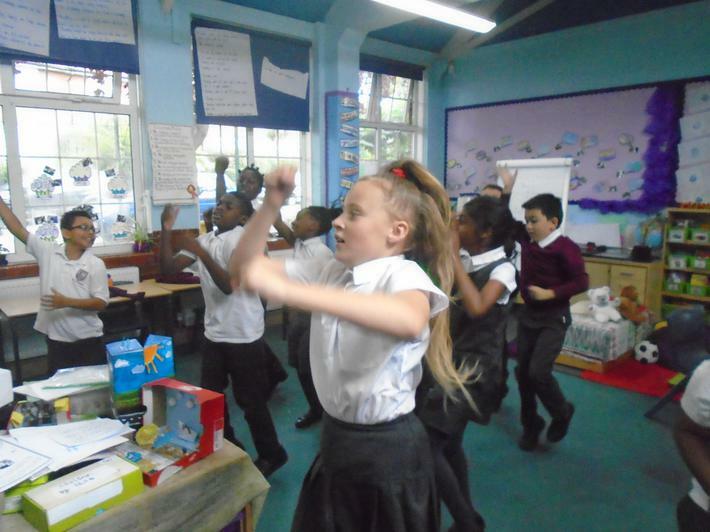 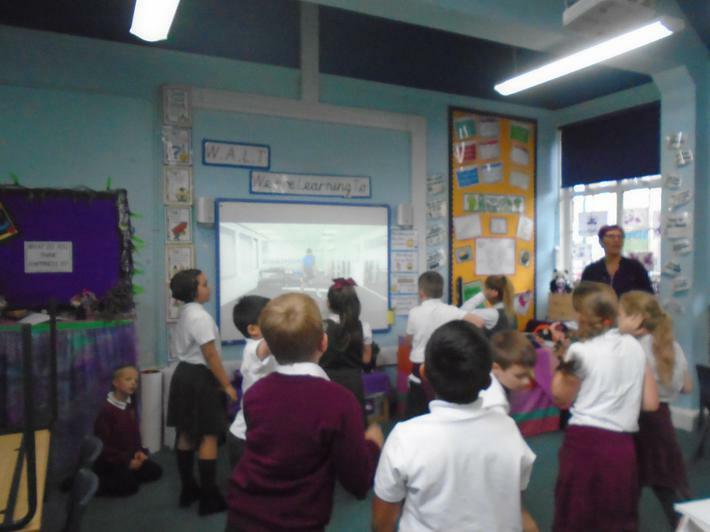 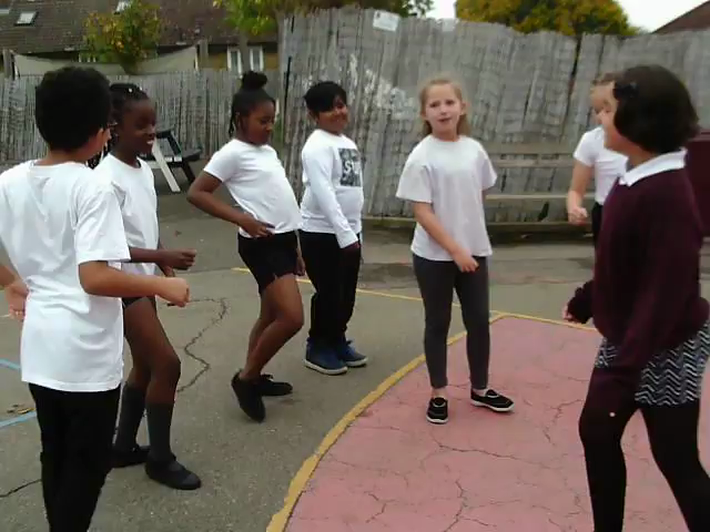 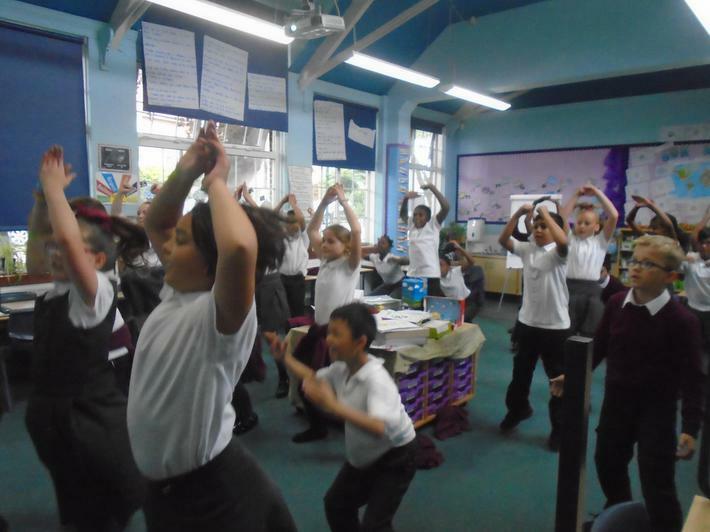 Last week, Alder class took part in Schools Fitness week. 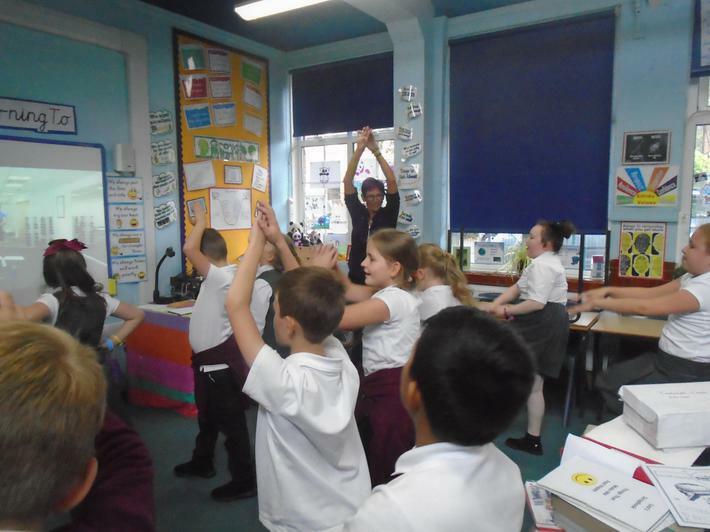 Joe Wicks, known for his 15 minute HITT workouts, wanted to get 1 million children exercising everyday as part of their school routine. 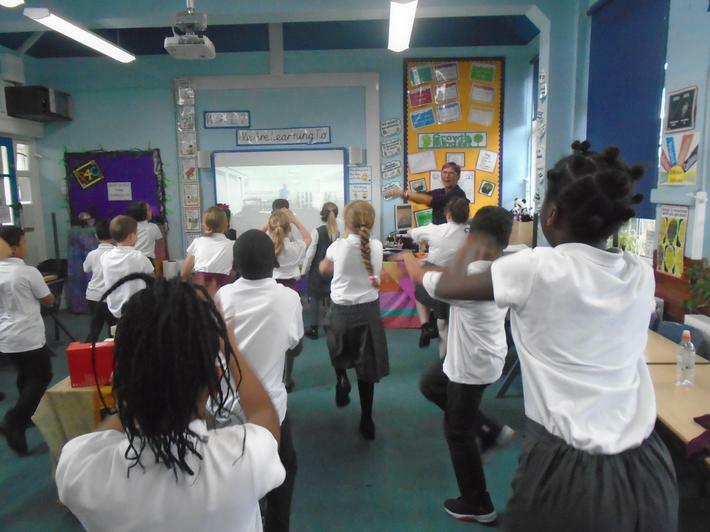 He held a daily live stream on youtube and encouraged adults and children to take part in a 20 minute fitness activity. 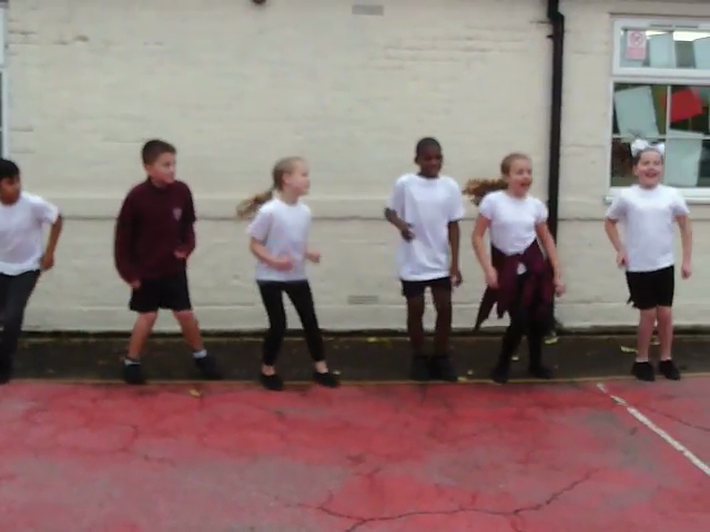 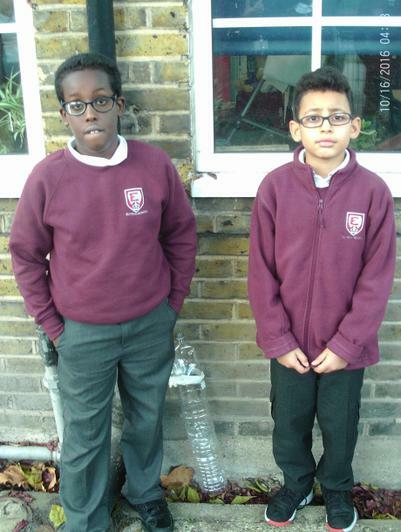 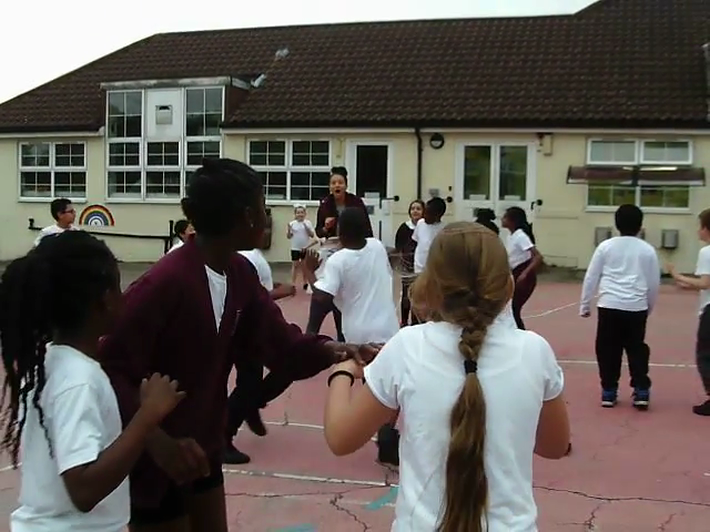 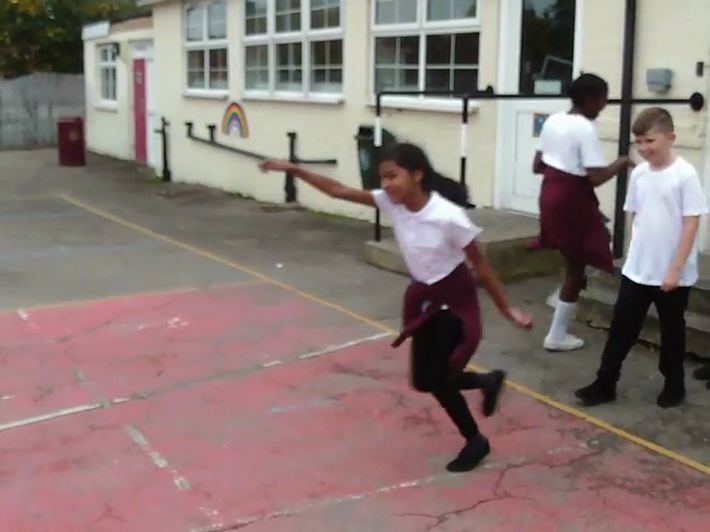 'The aim of my schools week is to get more kids active and feel the benefits of exercise. 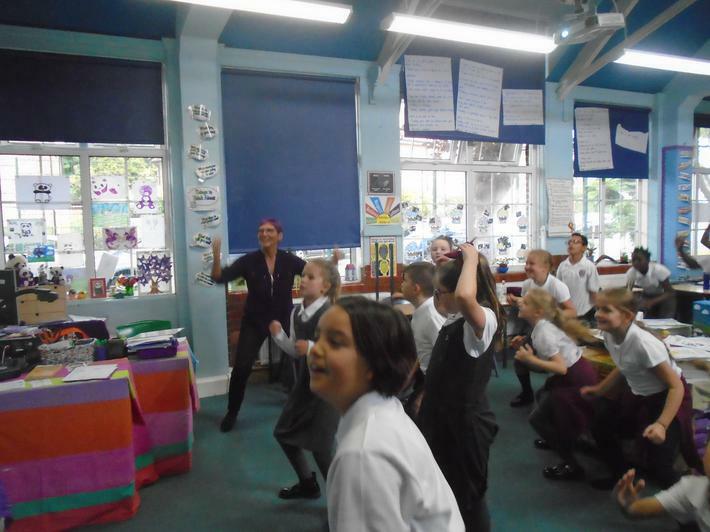 I want young people to see that fitness can be fun and to love it as much as I do. 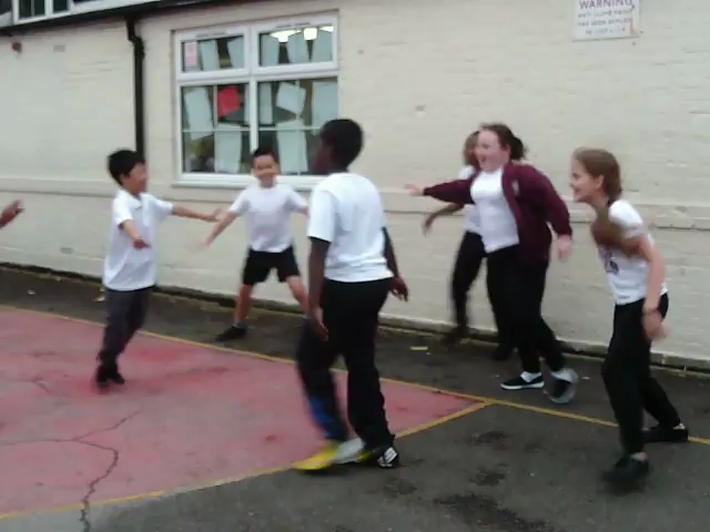 The aim of my schools week is to get more kids active and feel the benefits of exercise. 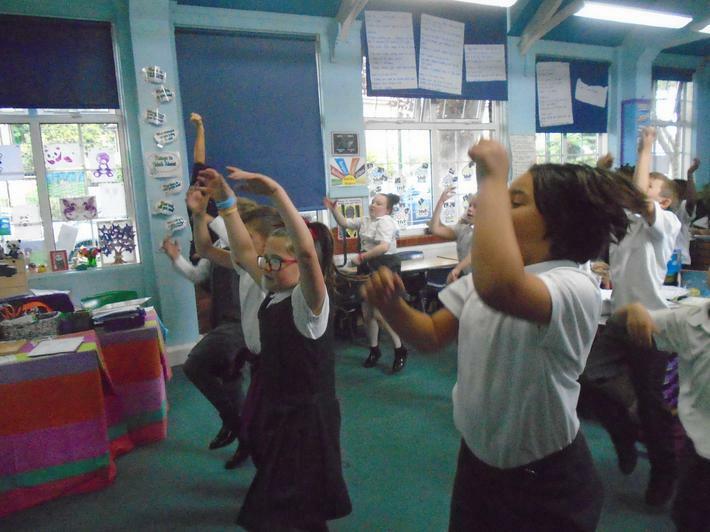 I want young people to see that fitness can be fun and to love it as much I do' Joe Wicks. 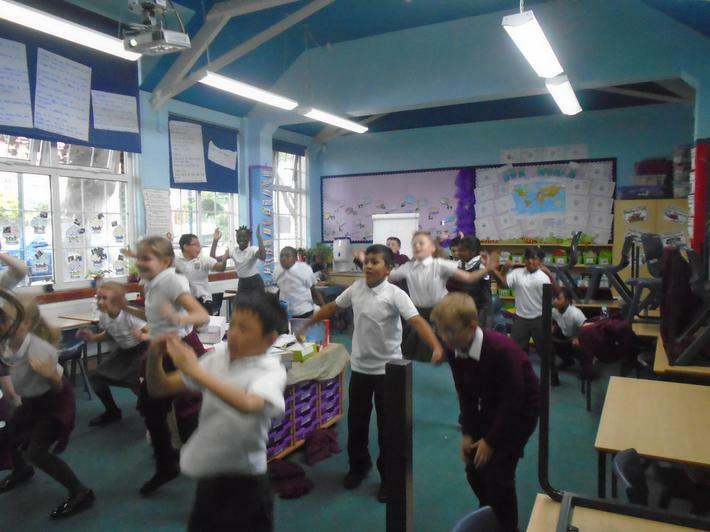 Alder class thoroughly enjoyed taking part and definitely felt fitter and happier as the week went on! 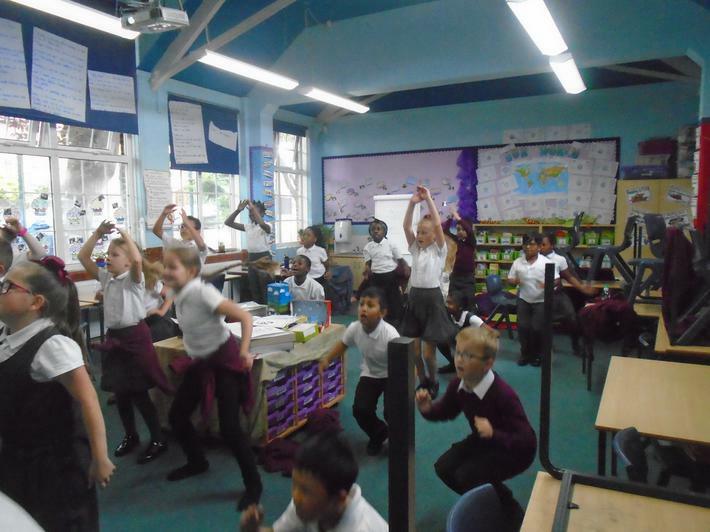 We have now decided that we will be doing 15 minutes of fitness everyday to keep our bodies and minds happy and healthy. 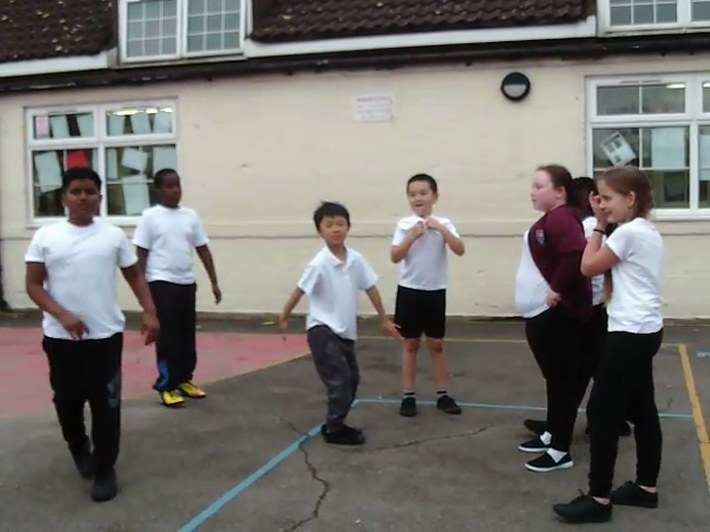 This is the web link to Joe Wicks' youtube channel. 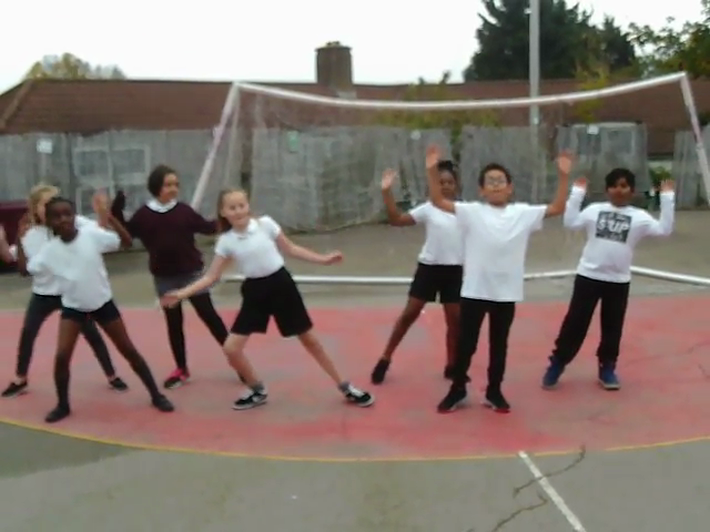 Here you can find all the videos from Schools Fitness Week.